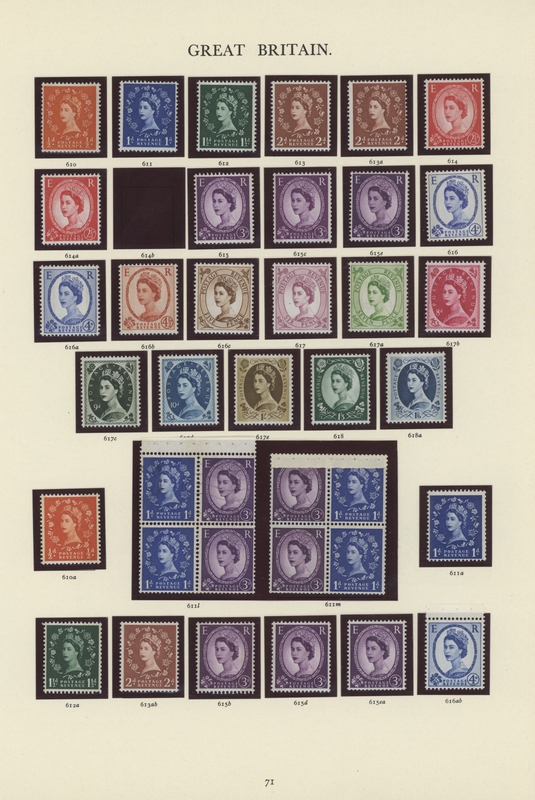 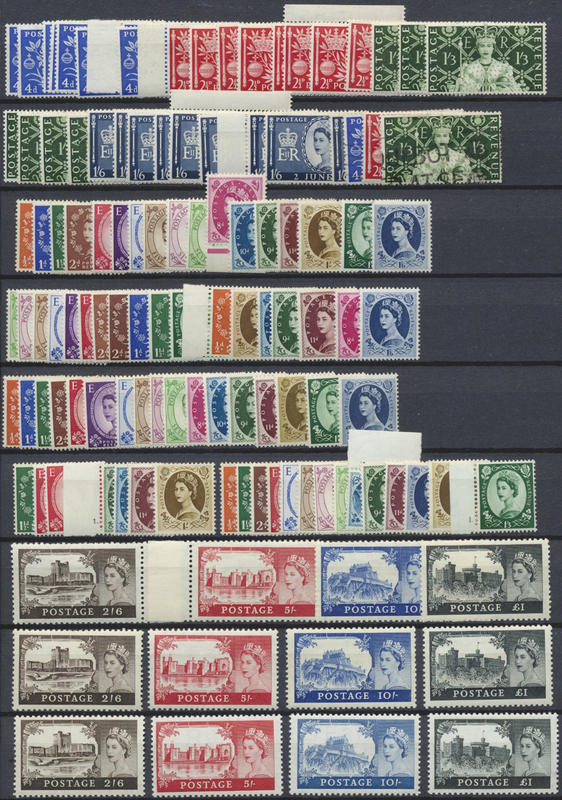 34955 gestempelt (marked) 1858/1918, huge stock on approximately 160 cards predominantly QV from 1883 and 1887 (jubilee) issues and Edward VII 1902 issue. 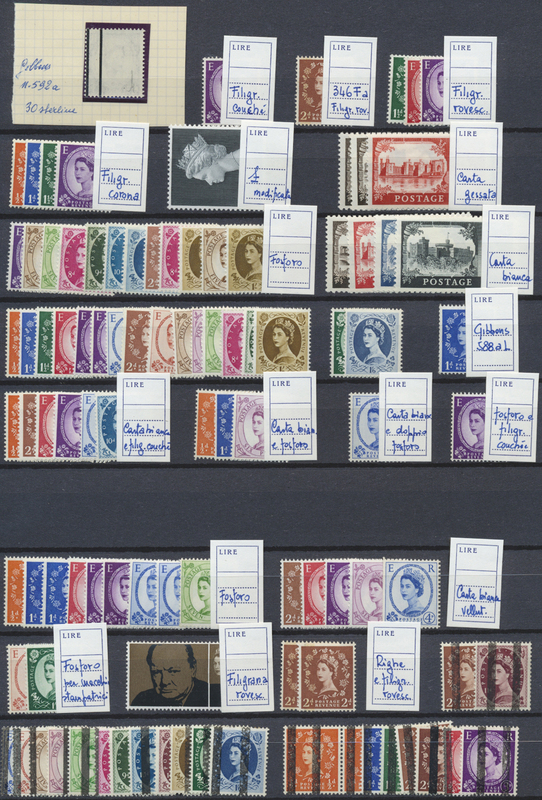 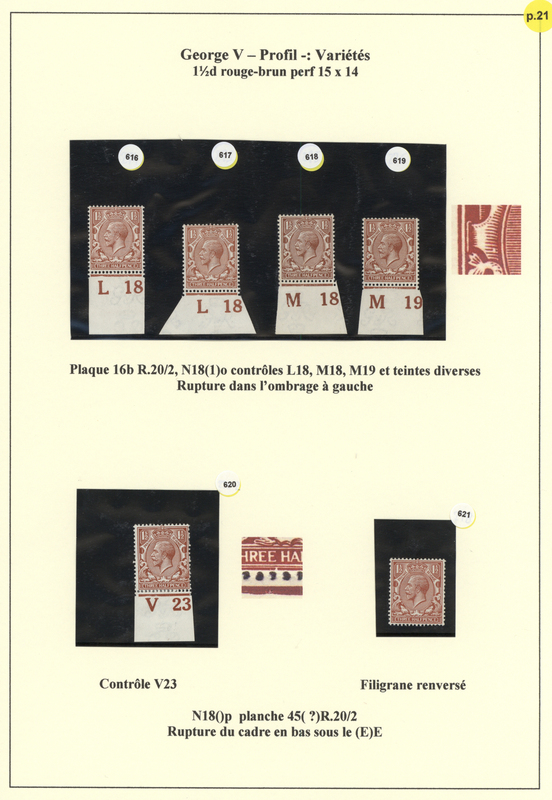 Catalogue value exeeds 25.000 Euro (roughly estimated). 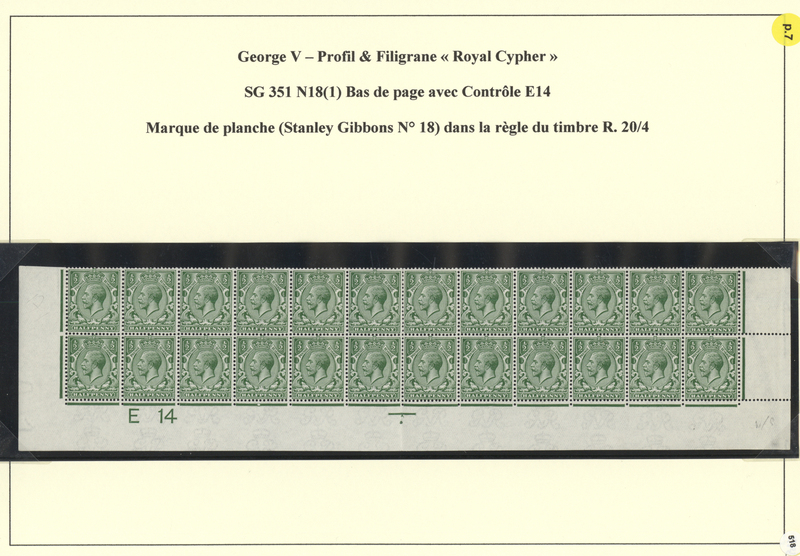 Please calculate by yourself. 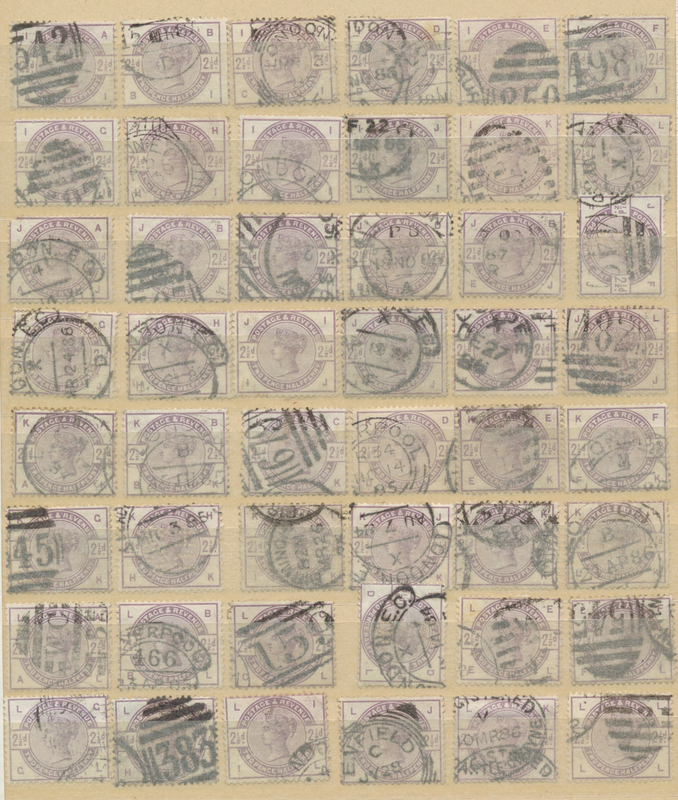 34960 gestempelt (marked) 16 1864, QV 1d perforated, total 3896 used copies, roughly sorted by first plate letter, in two stockbooks, some in mixed condition. 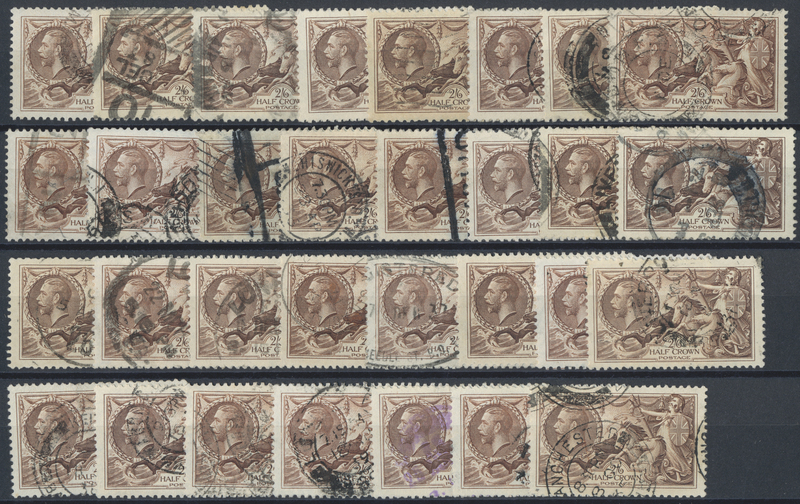 34962 gestempelt (marked) 1867/1884, lot of four used stamps: SG nos. 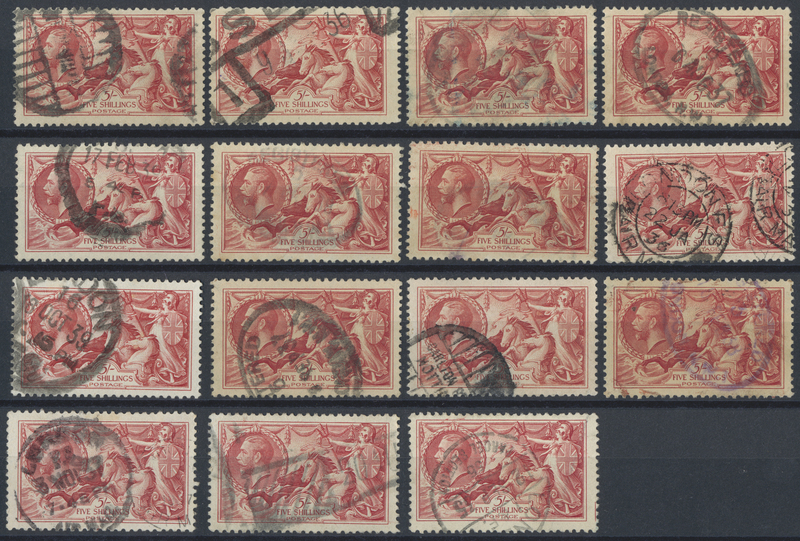 112, 156, 183, 193, each with opinion Louis BPP, tiny imperfections bot overall good condition, especially the 10s. 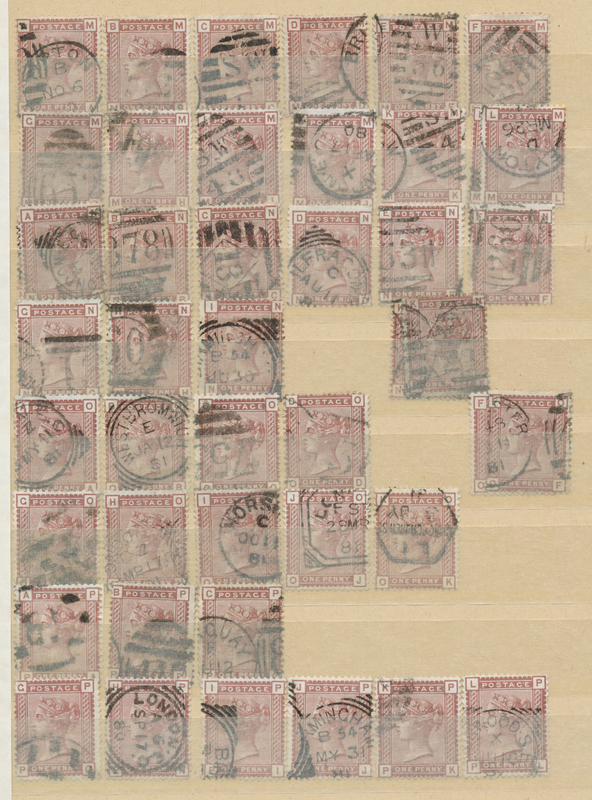 value with clear centric strike "MOTNROSE NO 4 87". 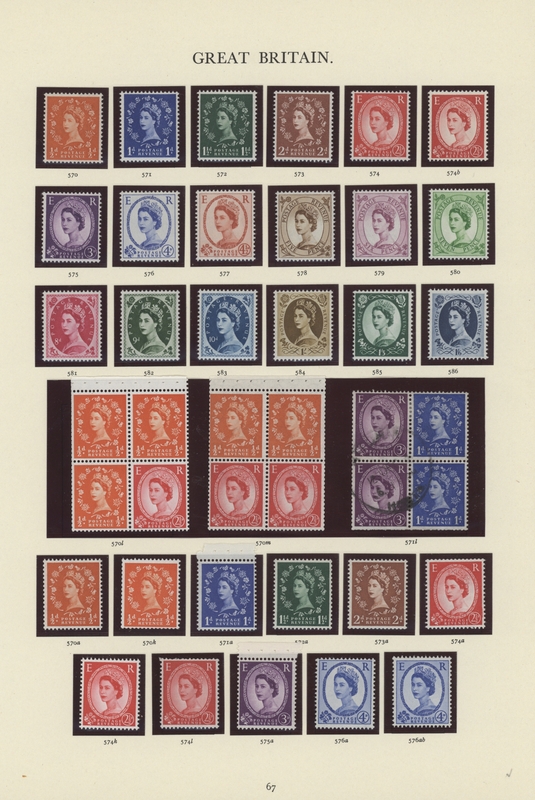 SG £1485. 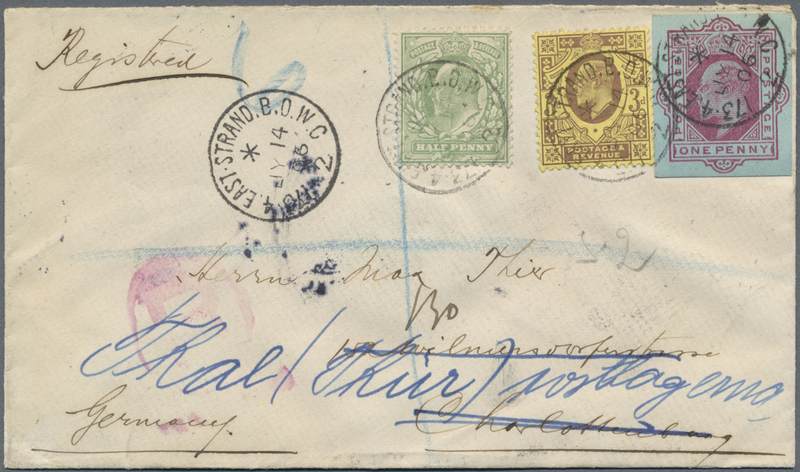 34965 gestempelt (marked) 1869, 6d. 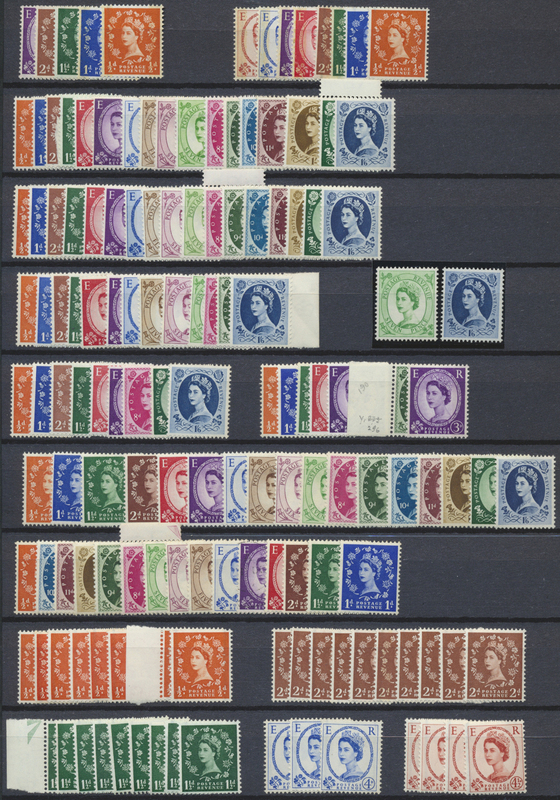 dull violet/mauve, lot of 17 used copies, bright colours. 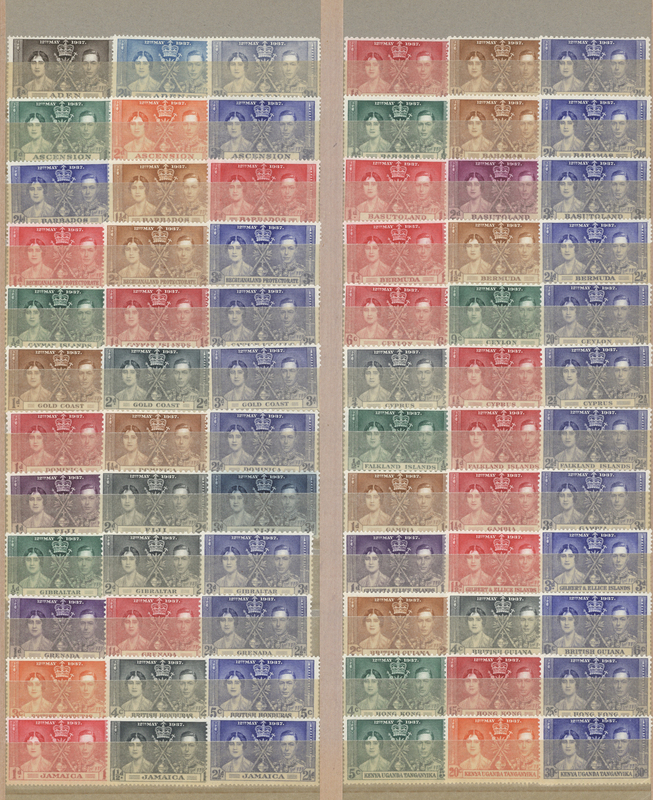 SG 108/09, apprx. 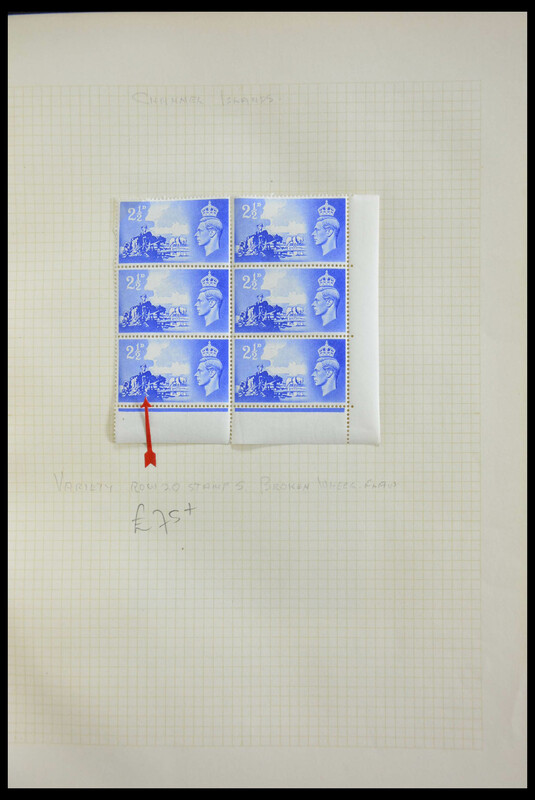 £2300. 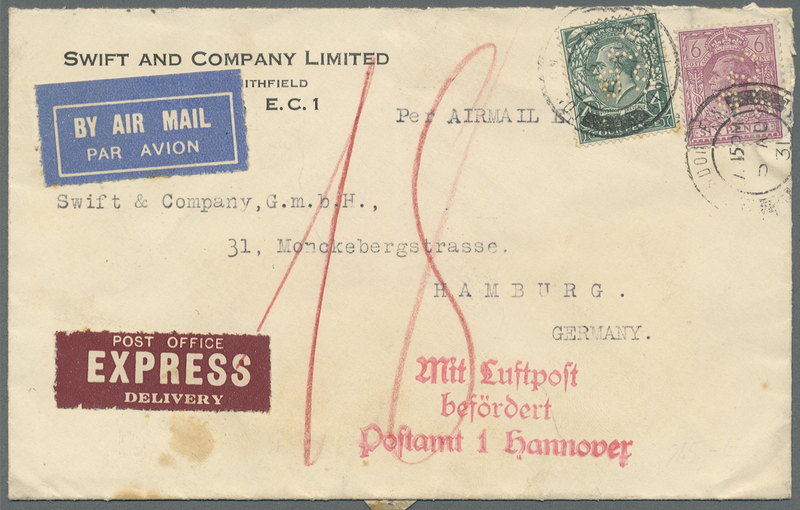 34970 Brief (cover) Ganzsache (Complete) 1890's-1950's ca. 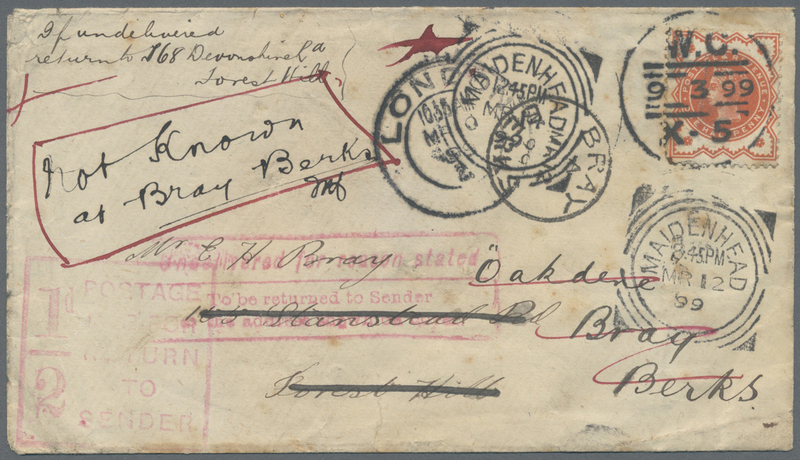 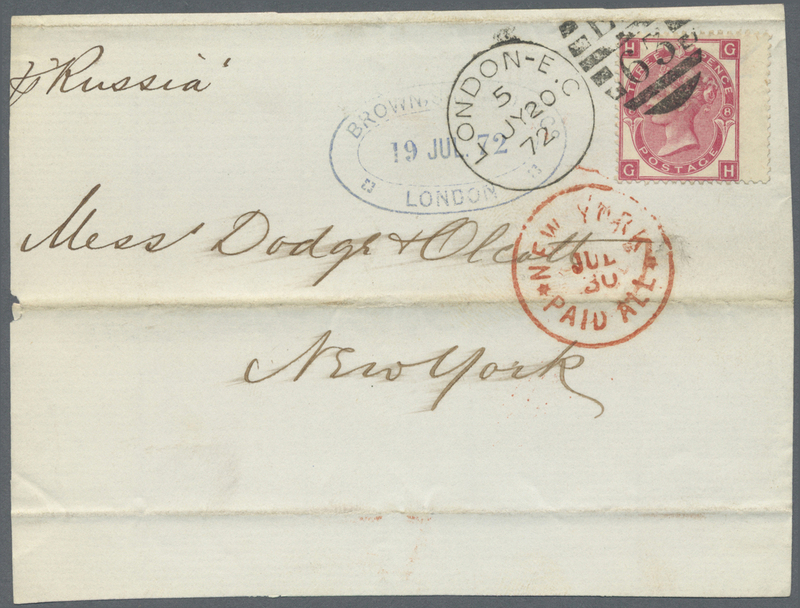 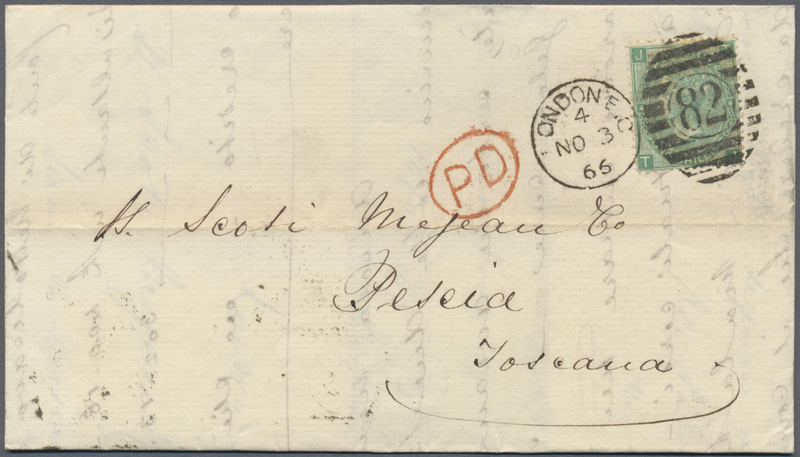 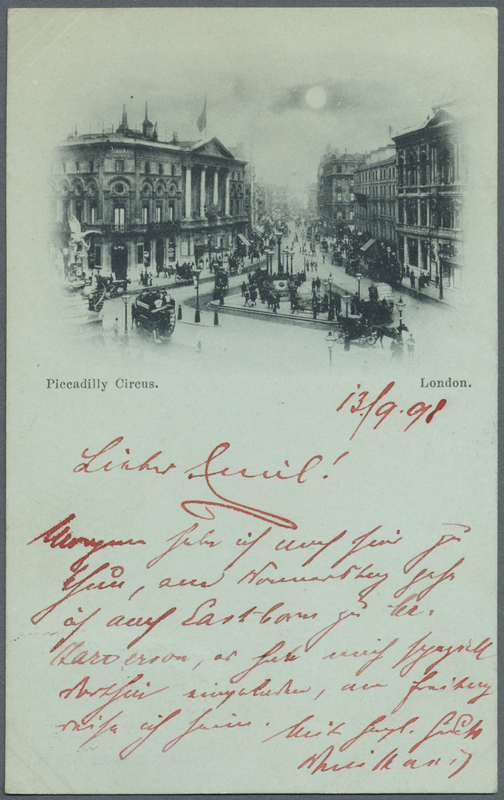 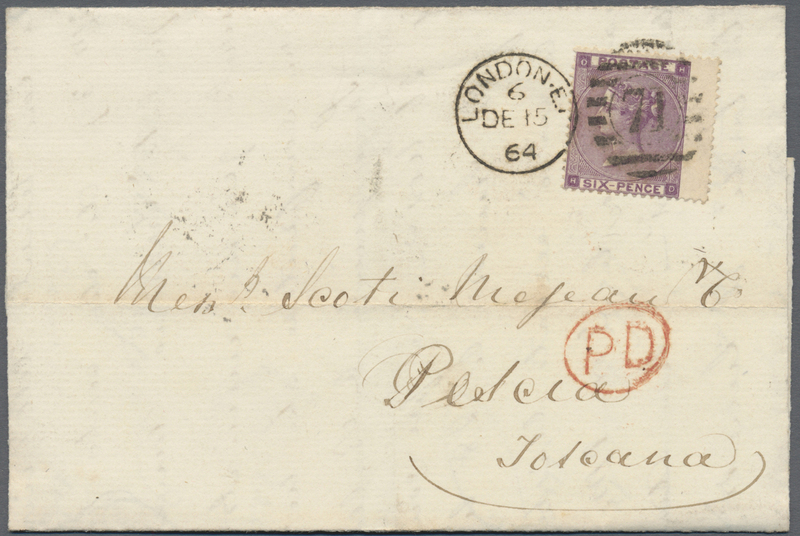 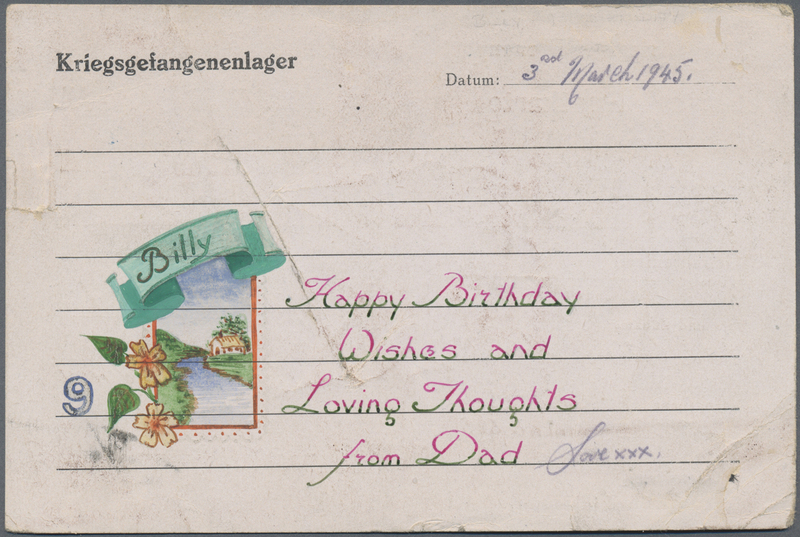 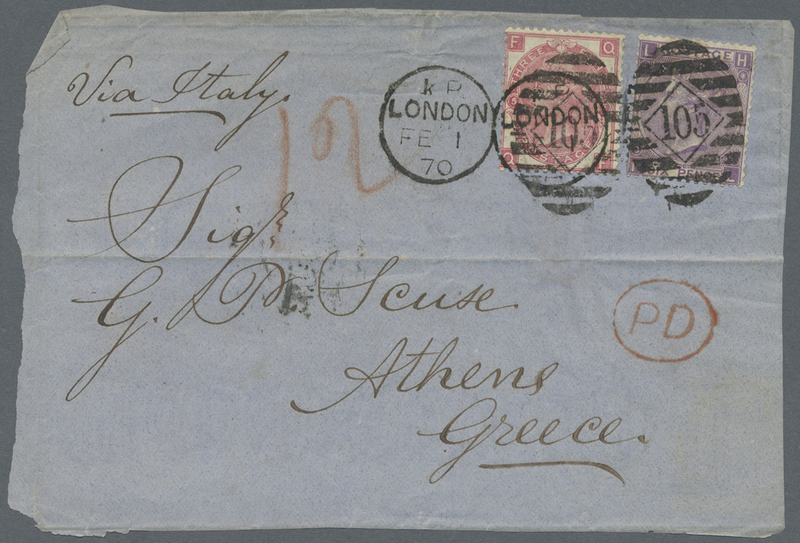 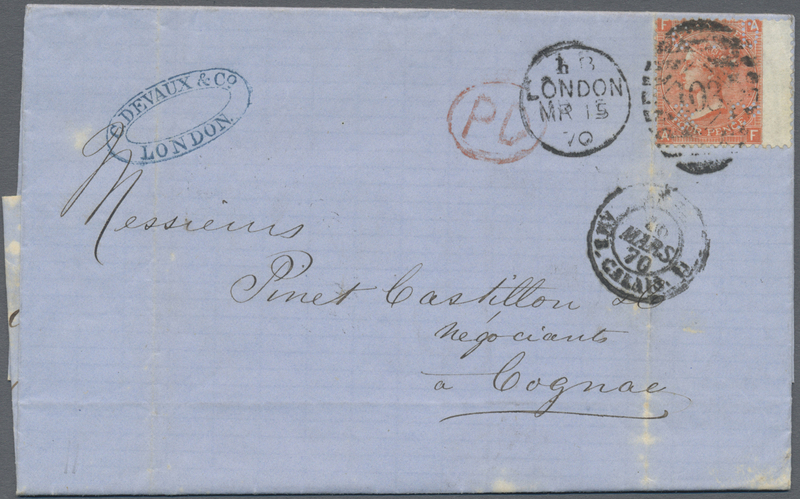 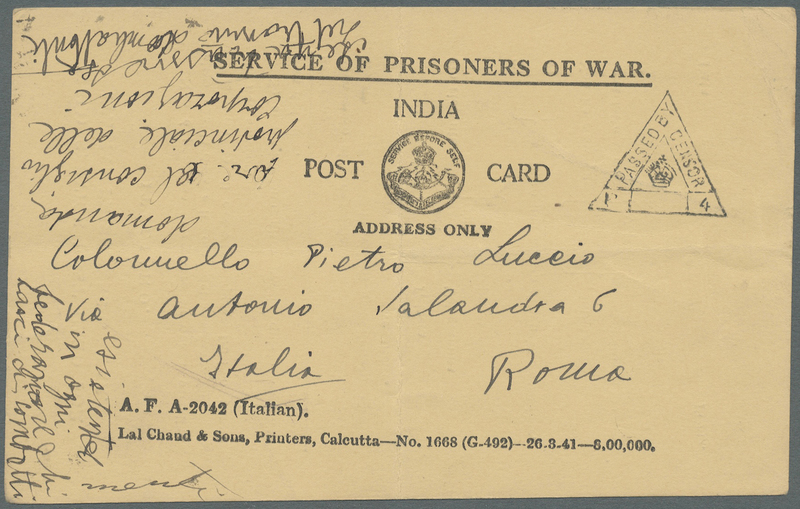 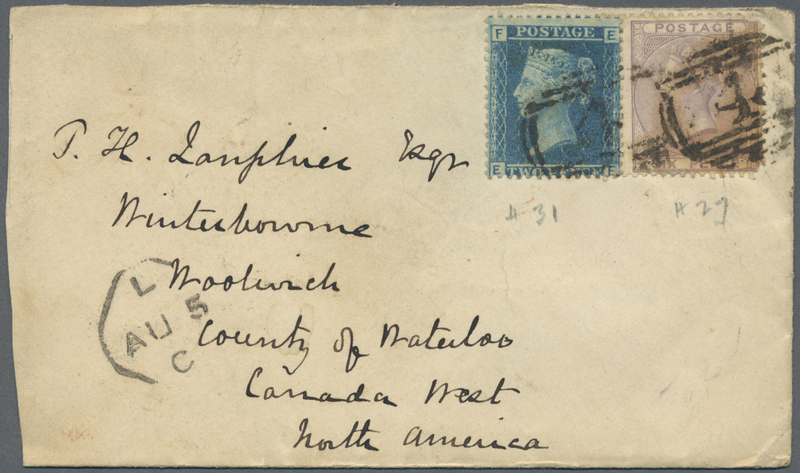 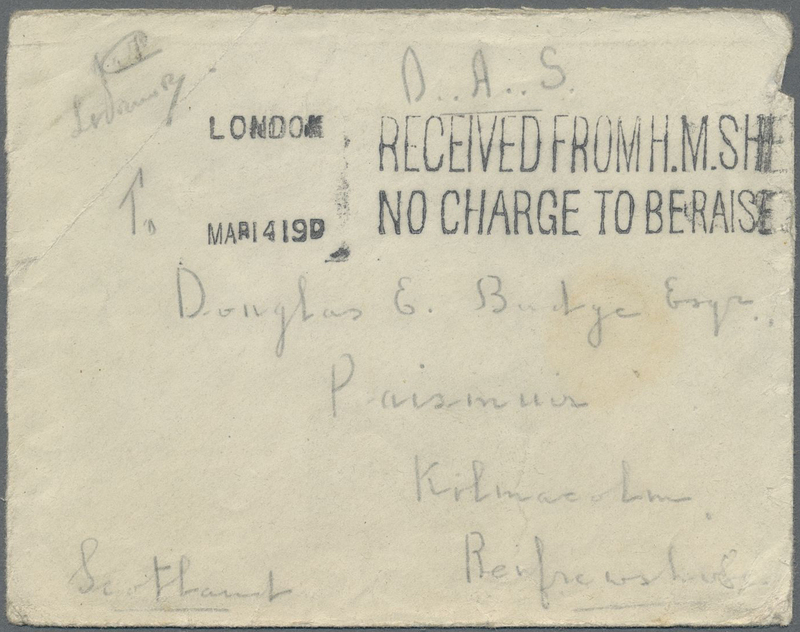 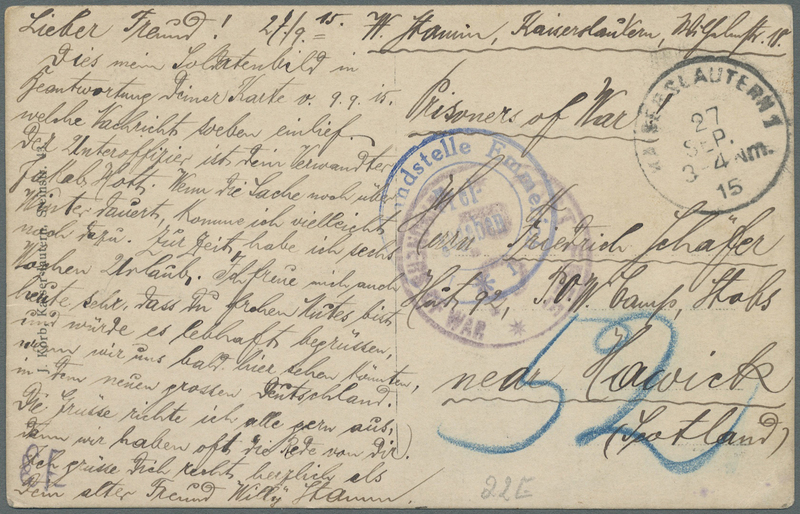 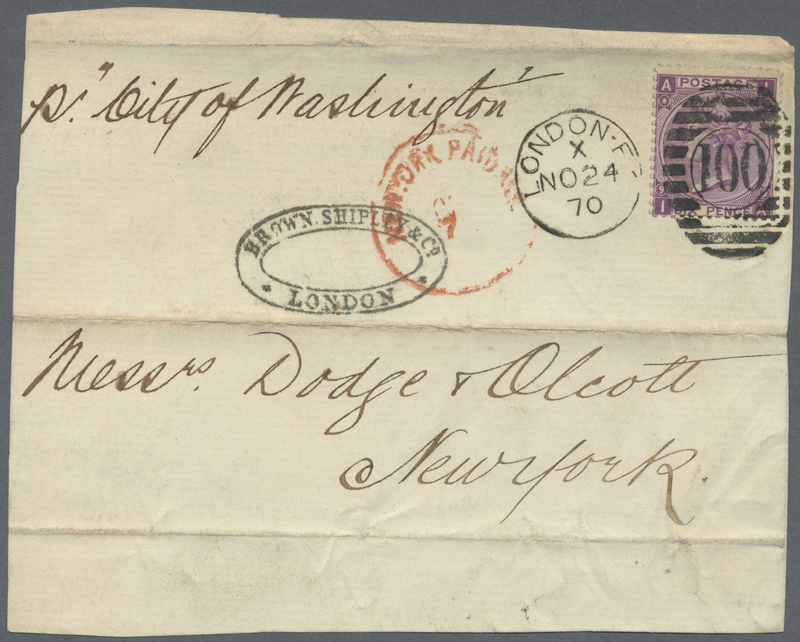 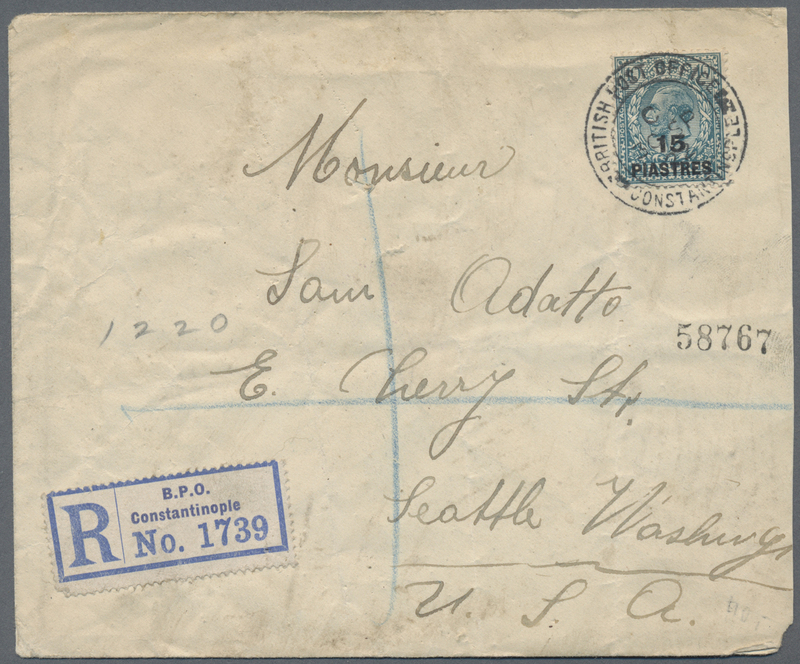 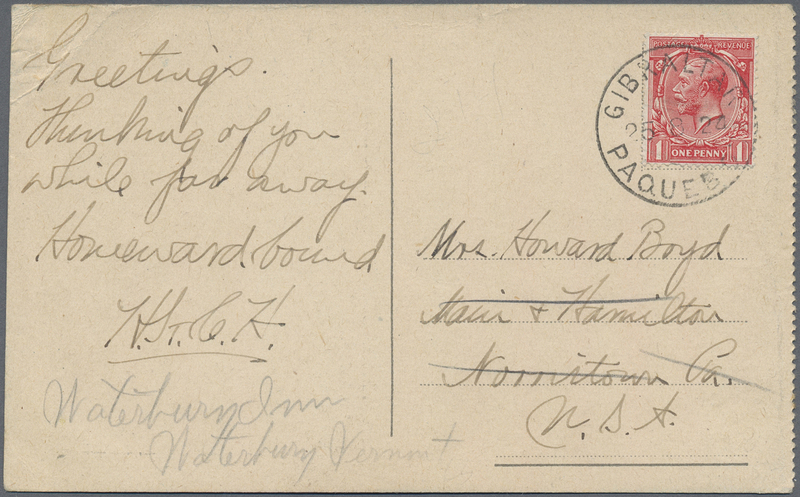 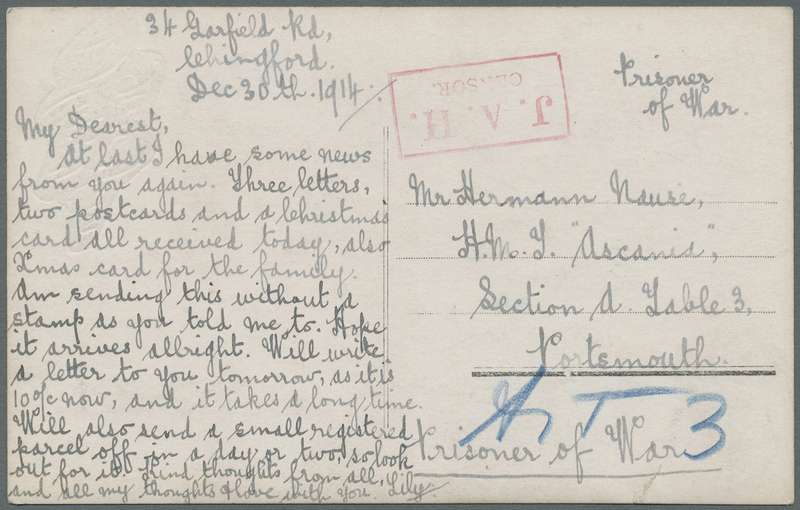 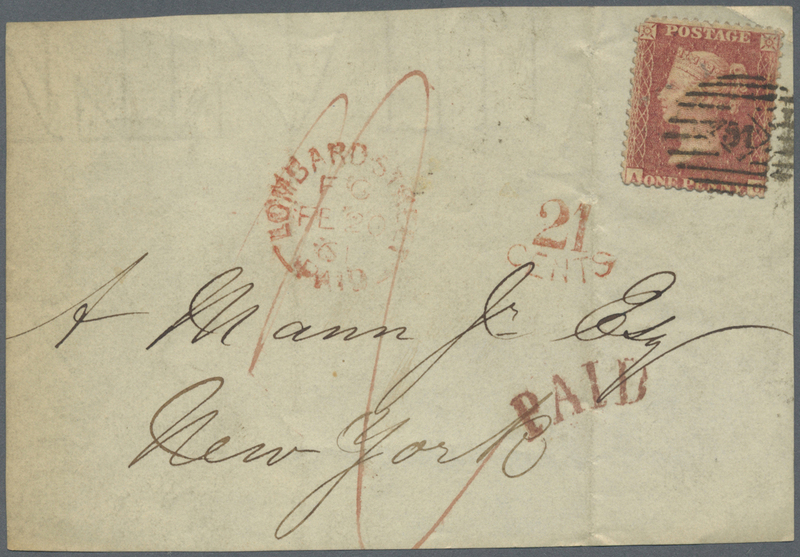 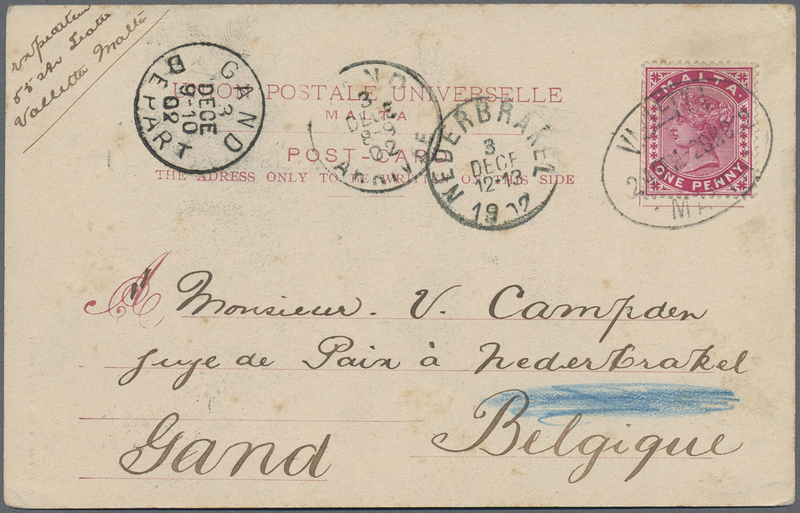 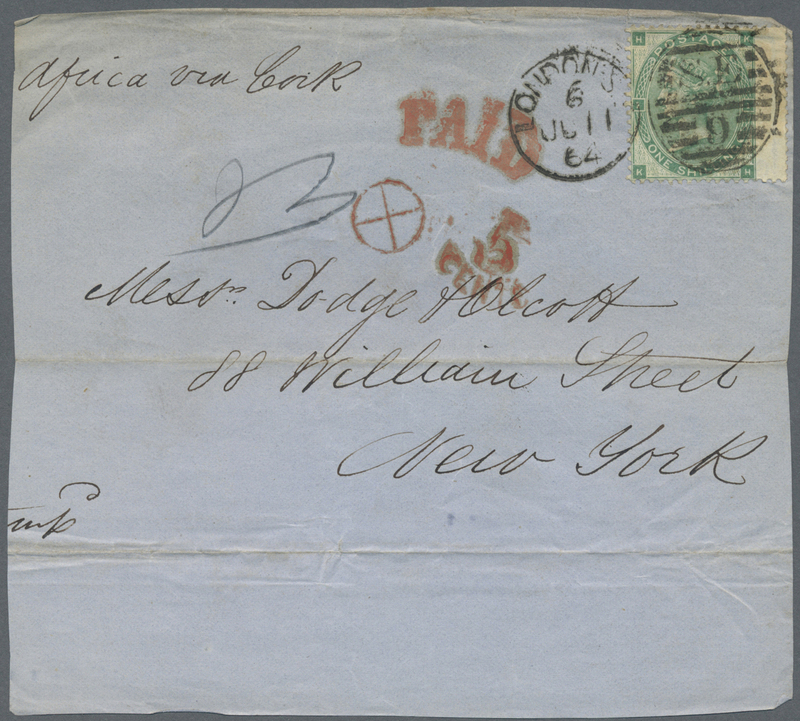 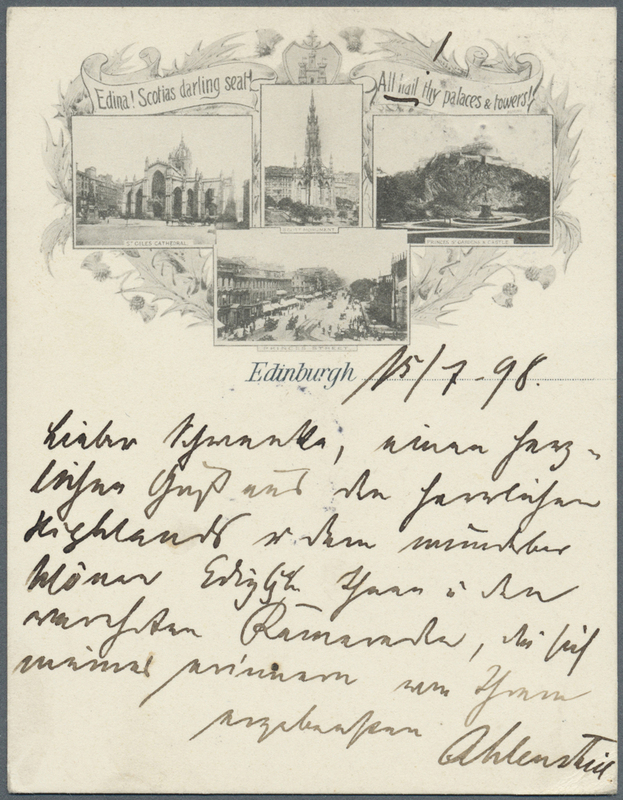 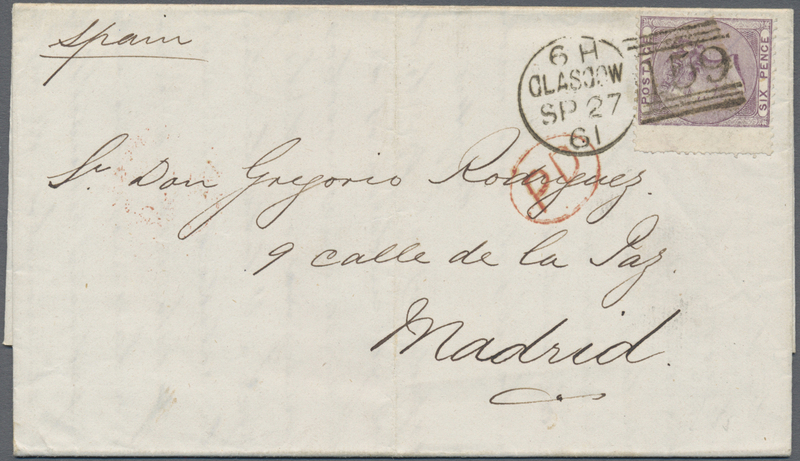 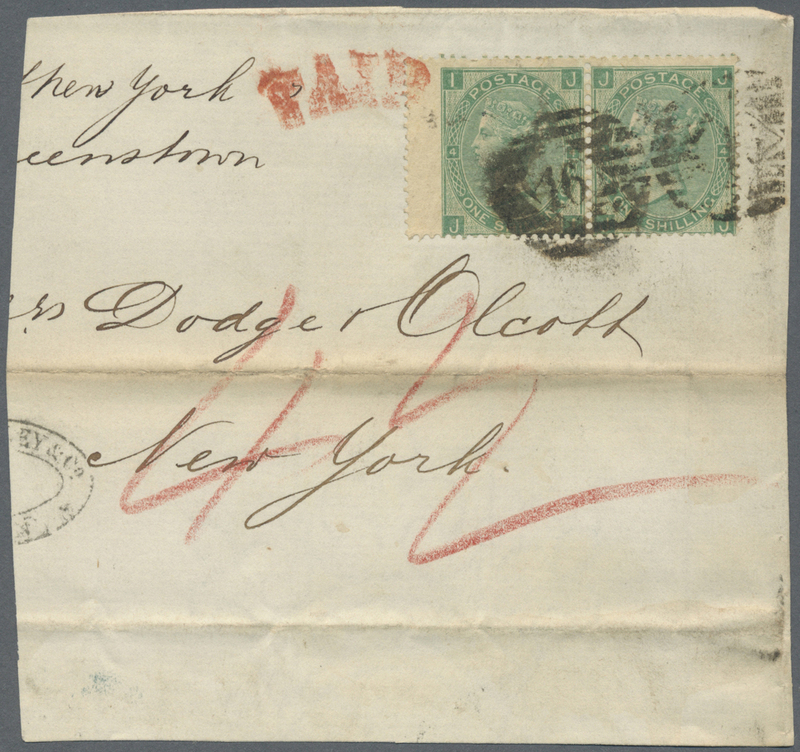 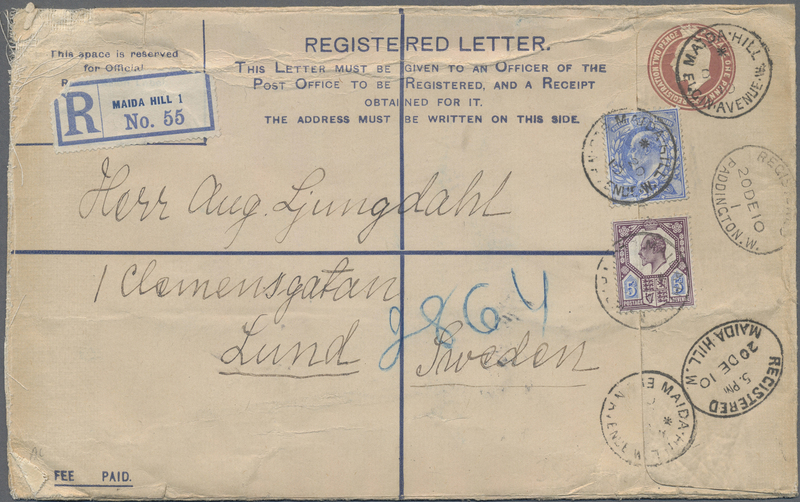 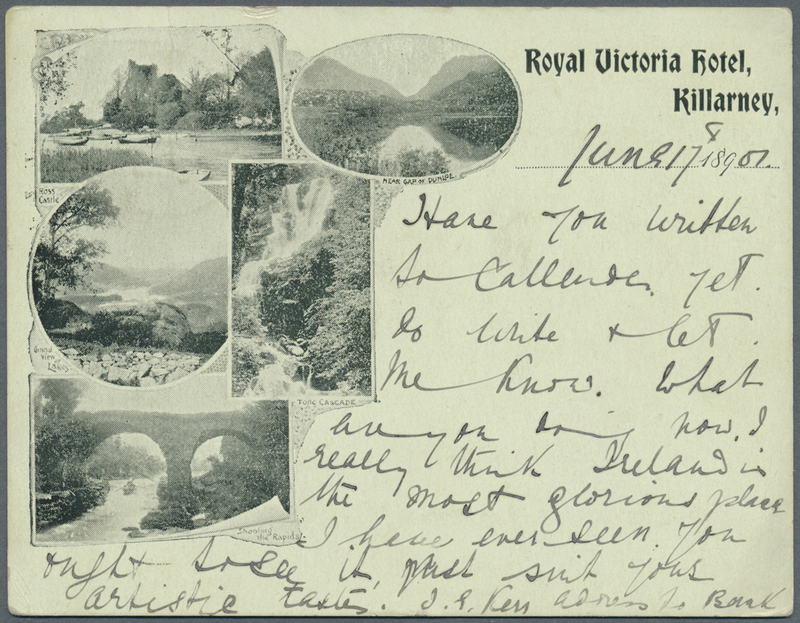 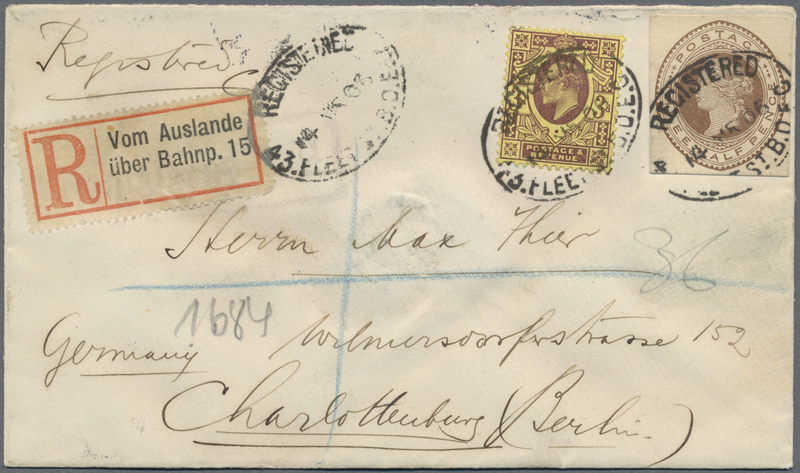 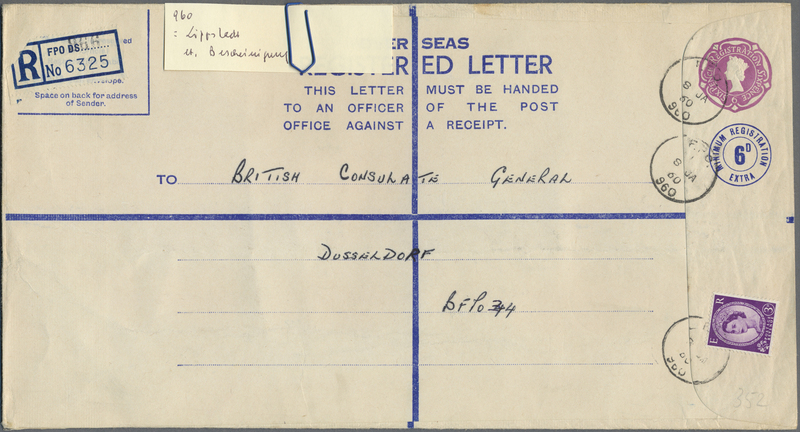 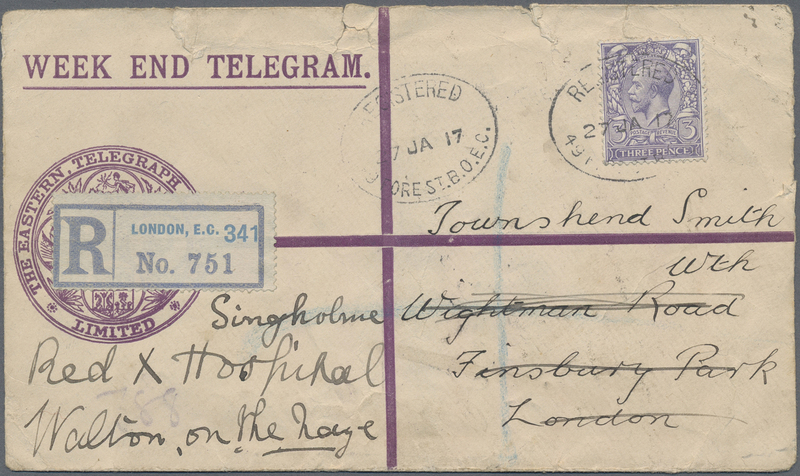 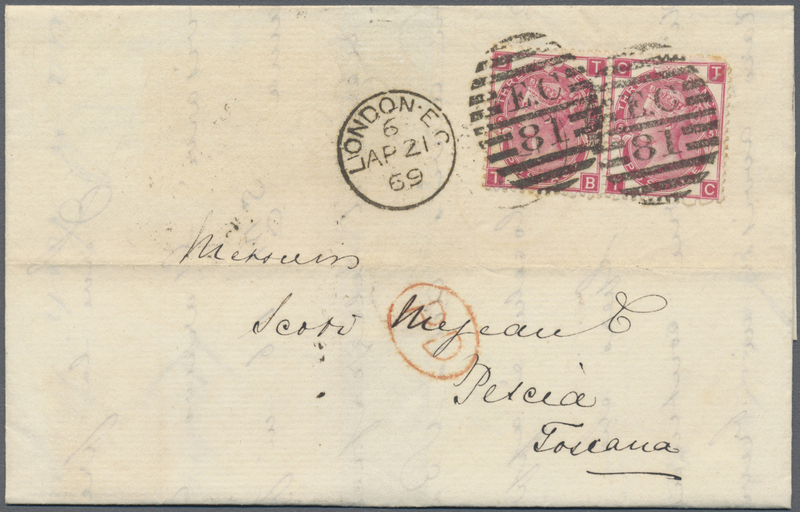 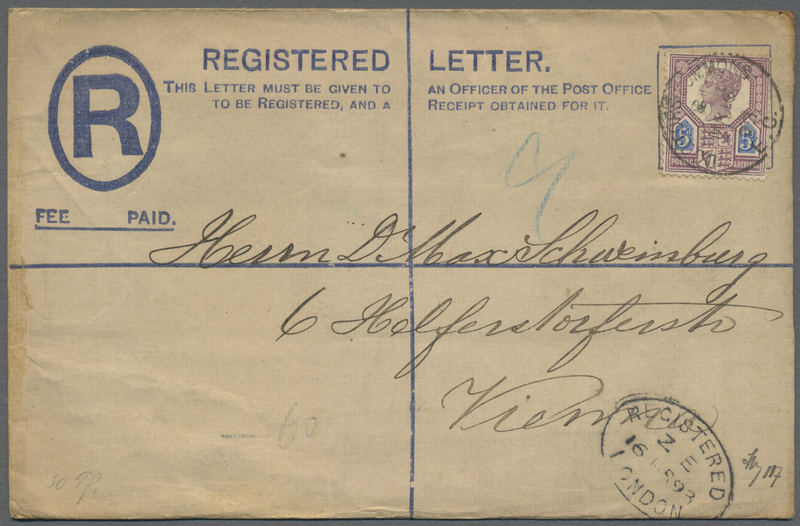 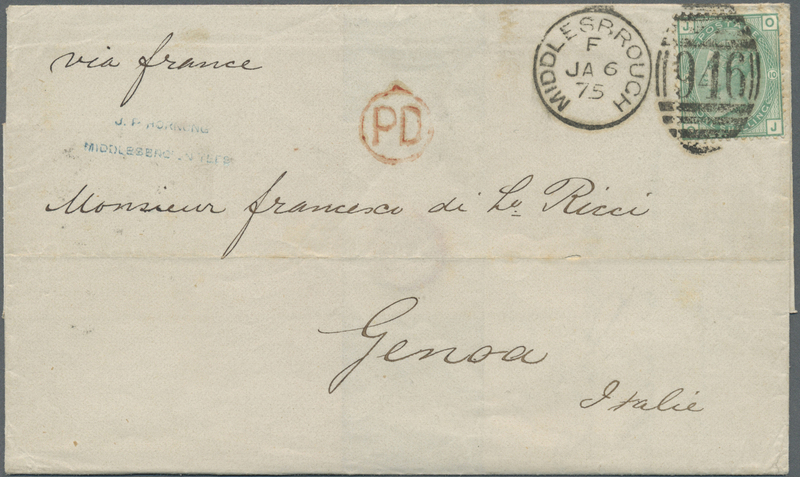 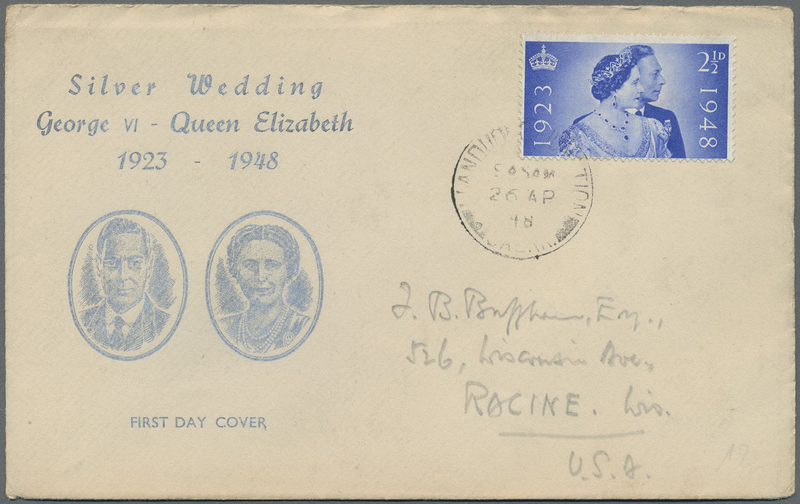 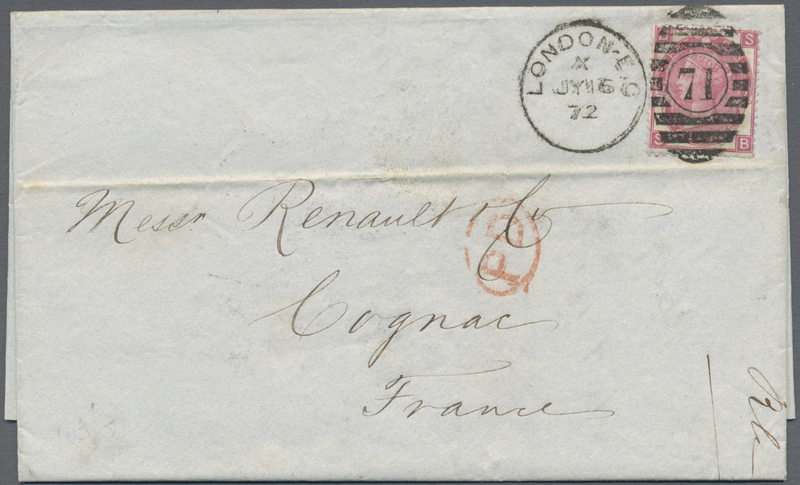 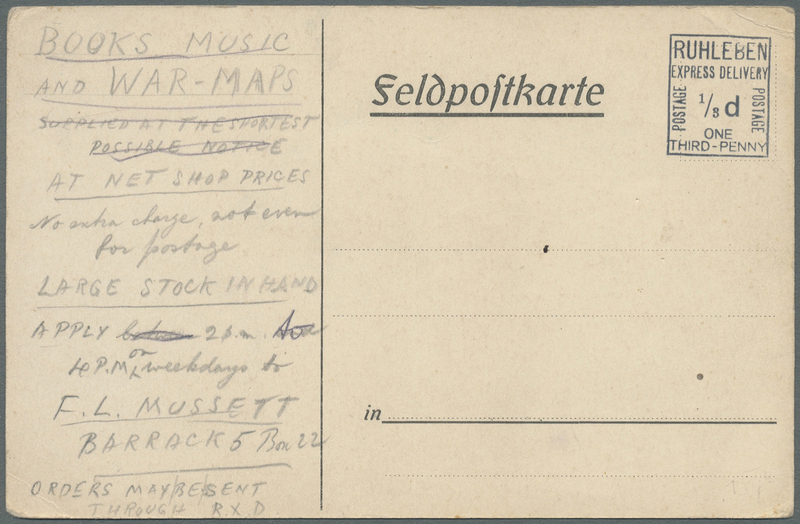 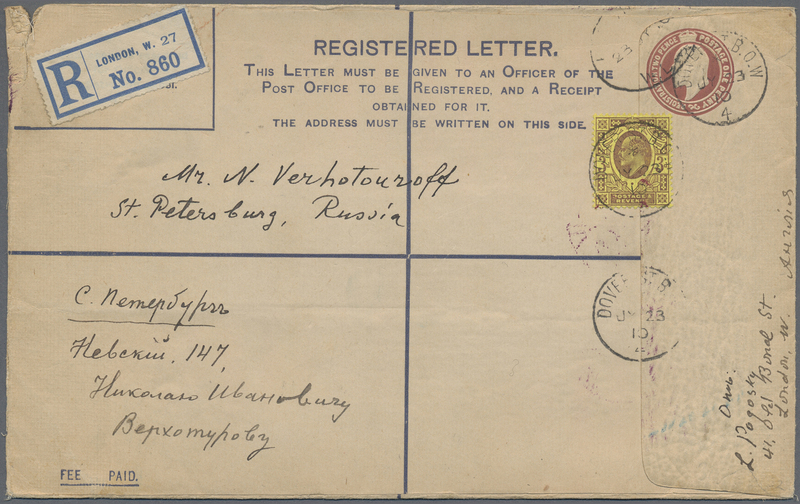 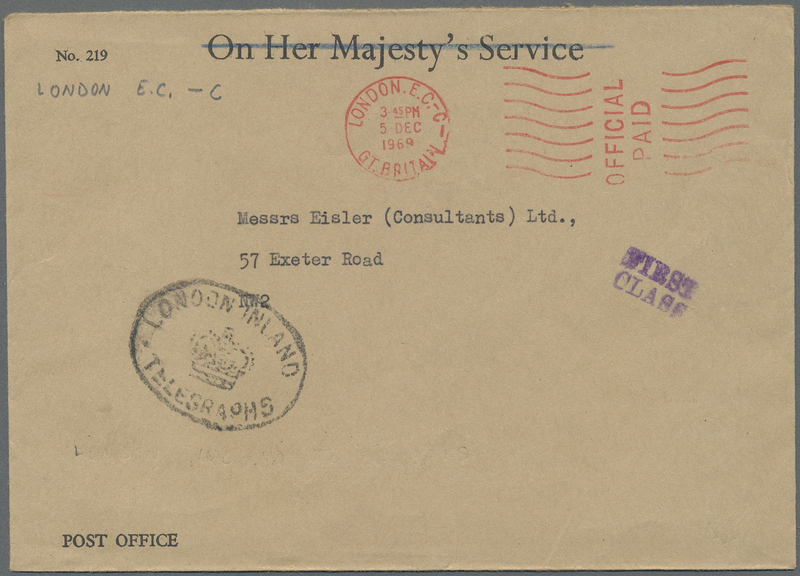 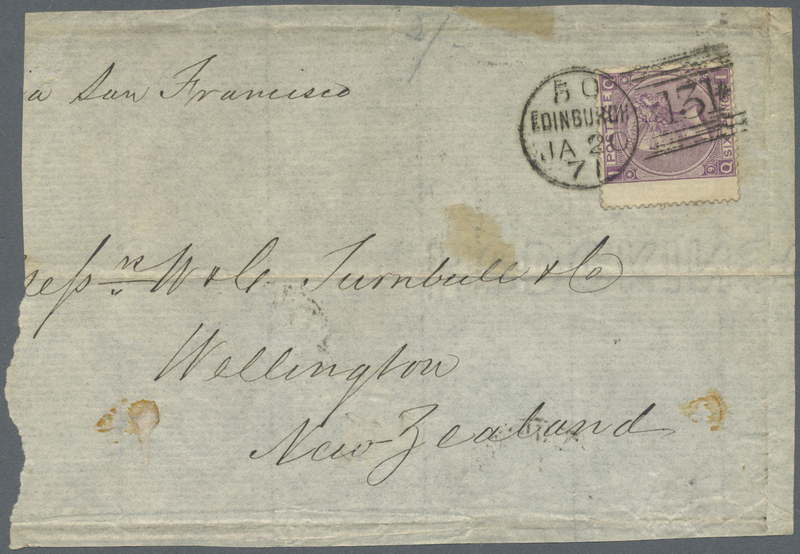 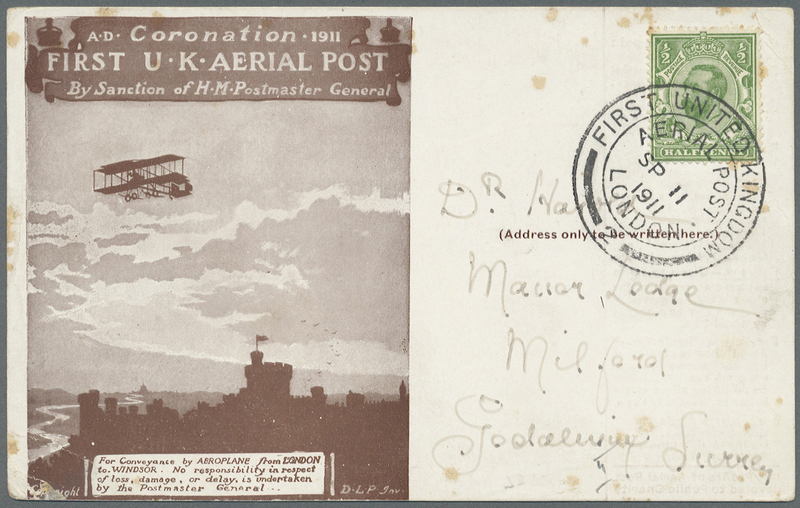 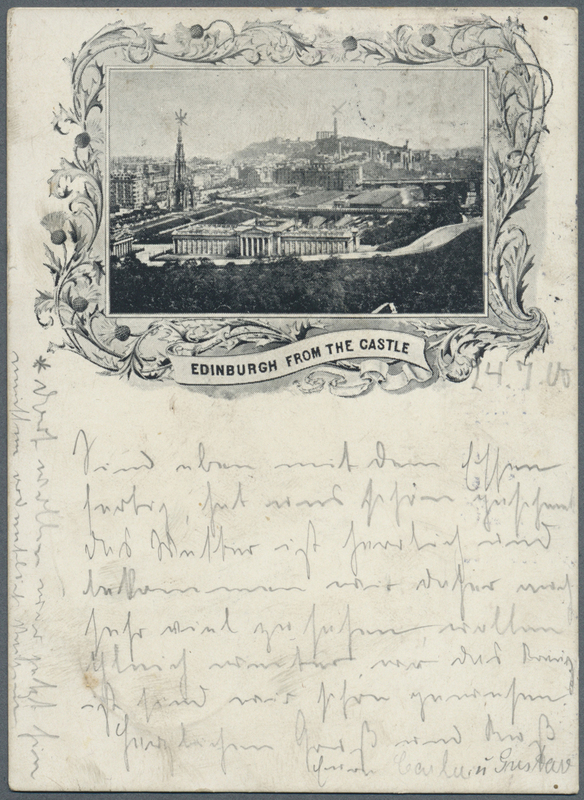 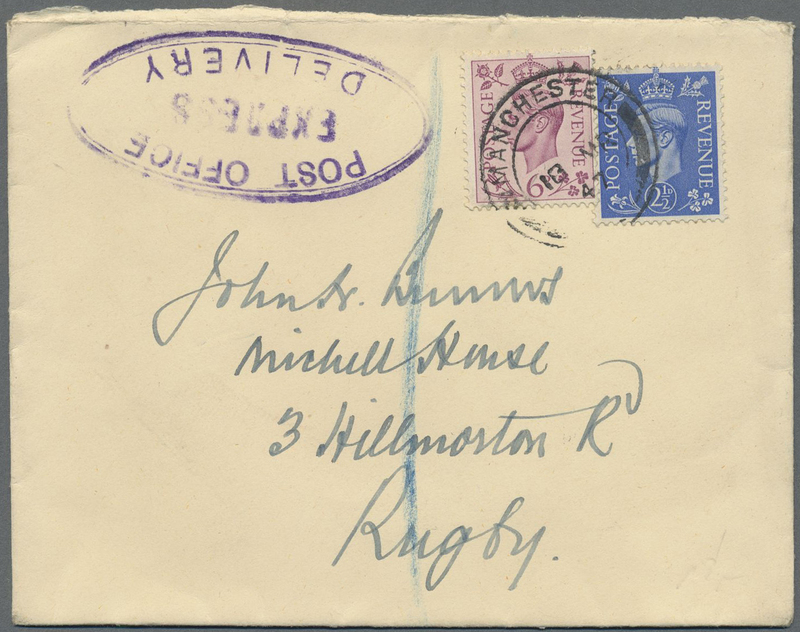 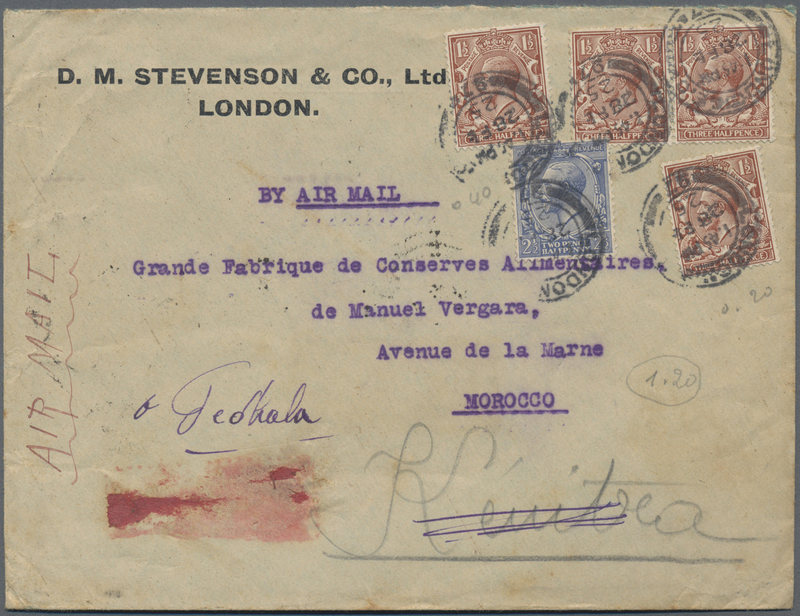 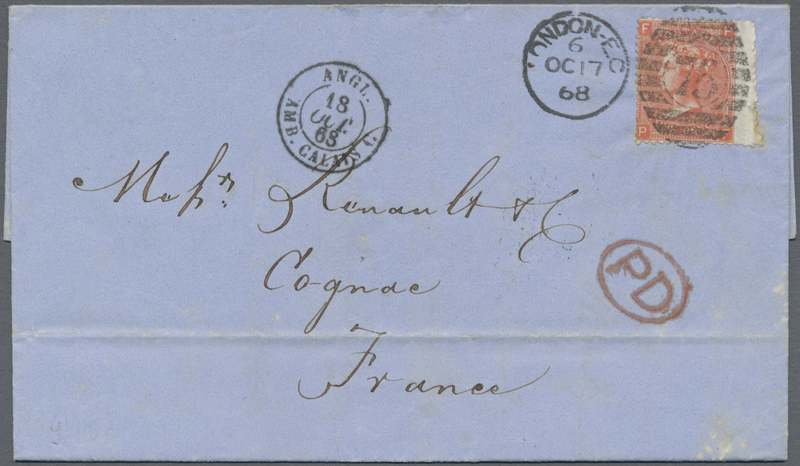 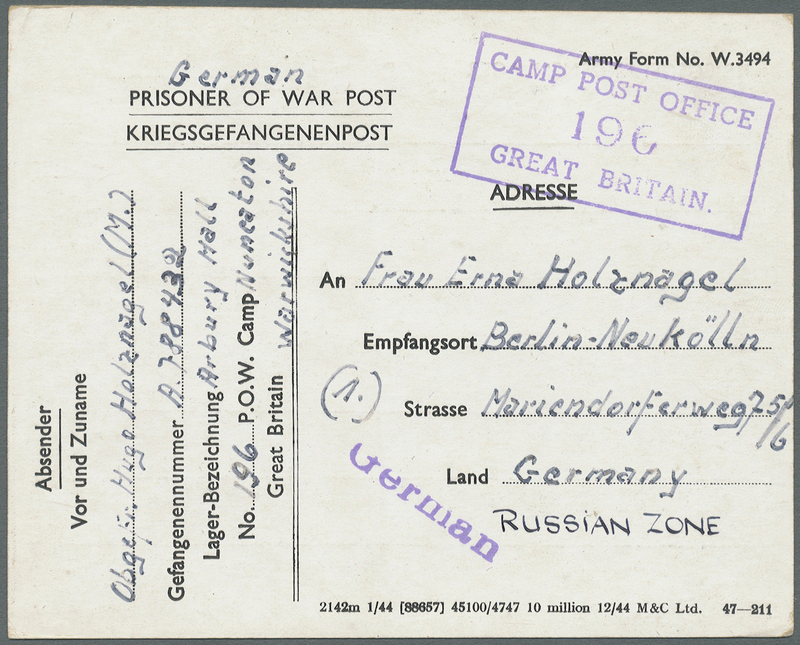 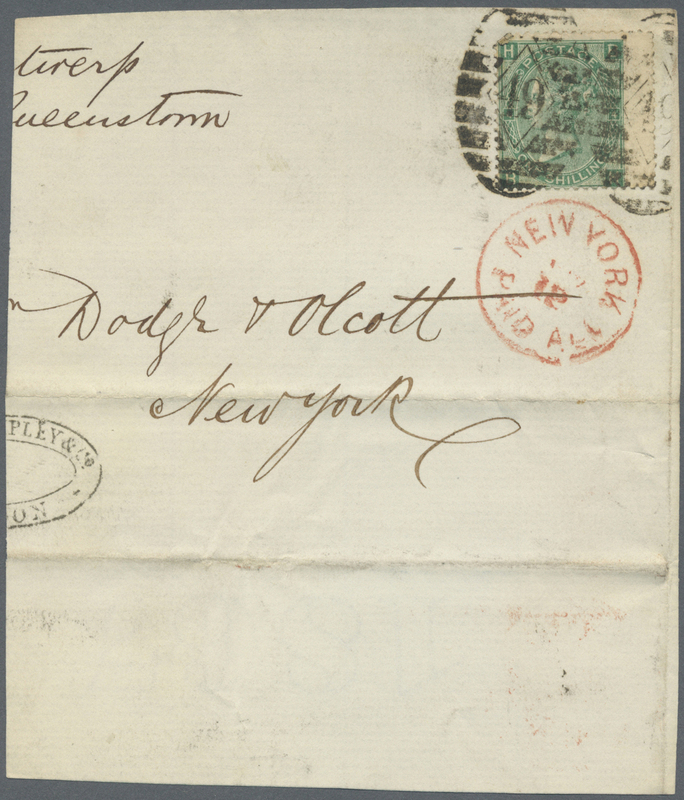 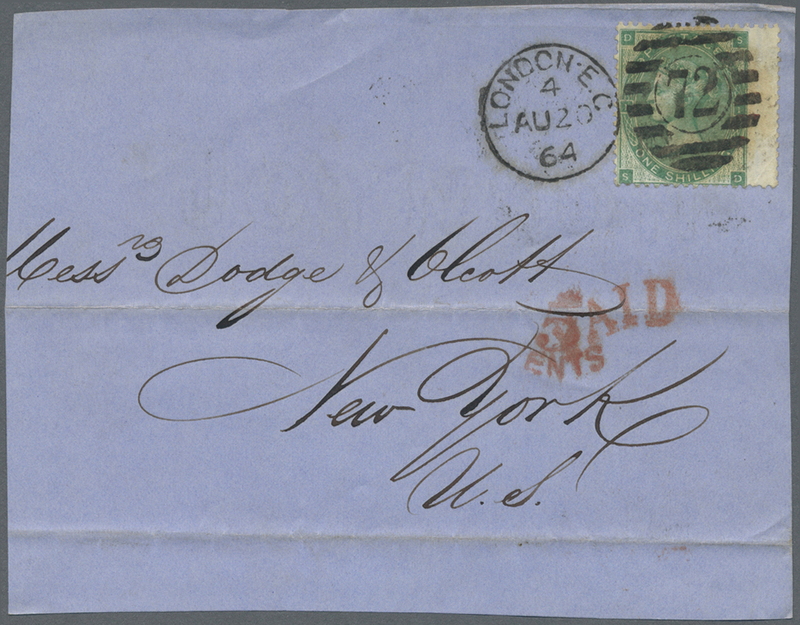 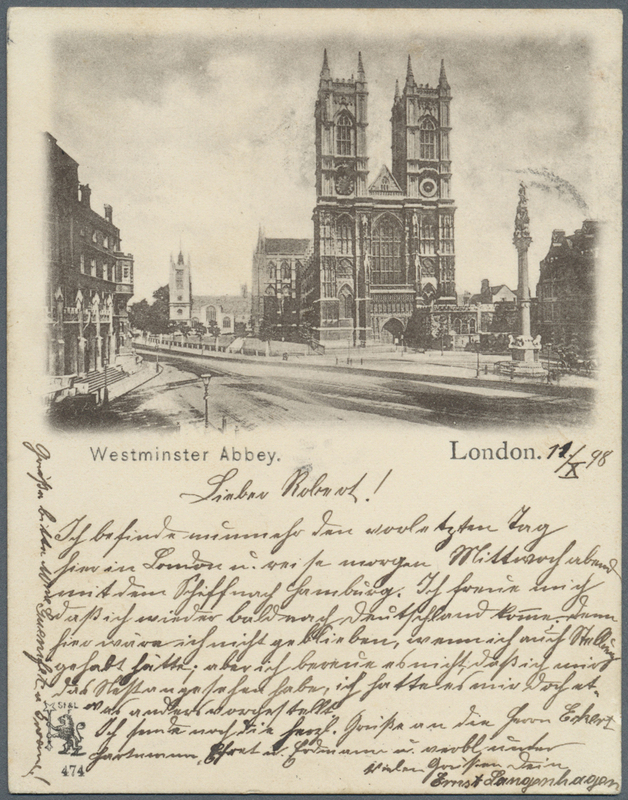 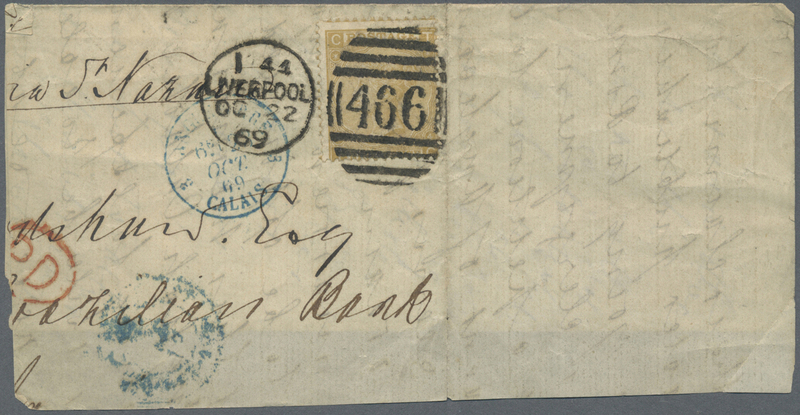 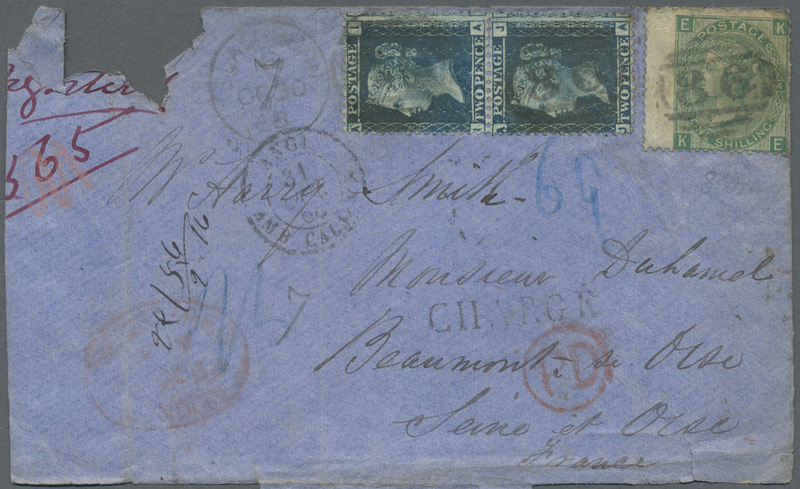 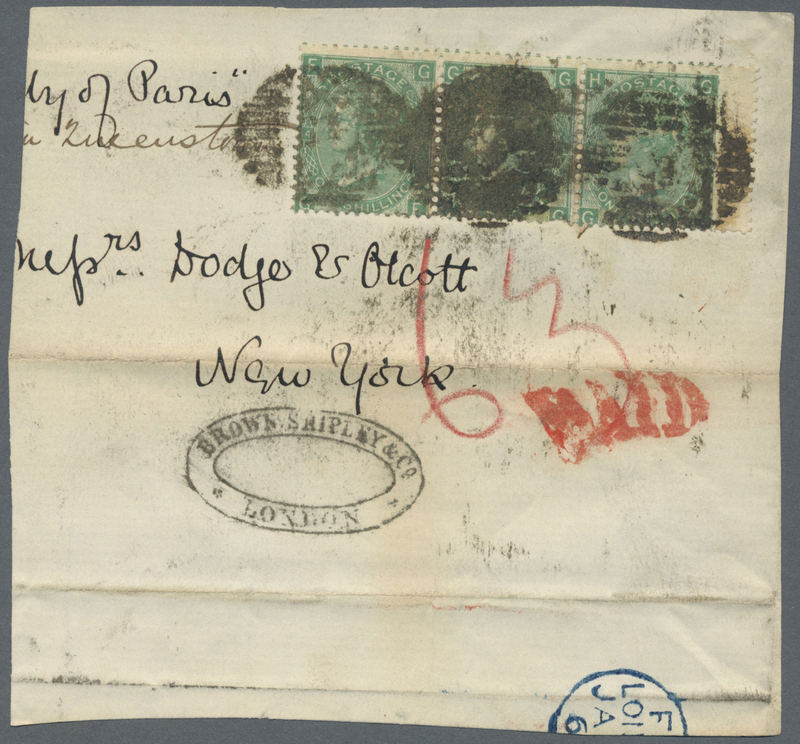 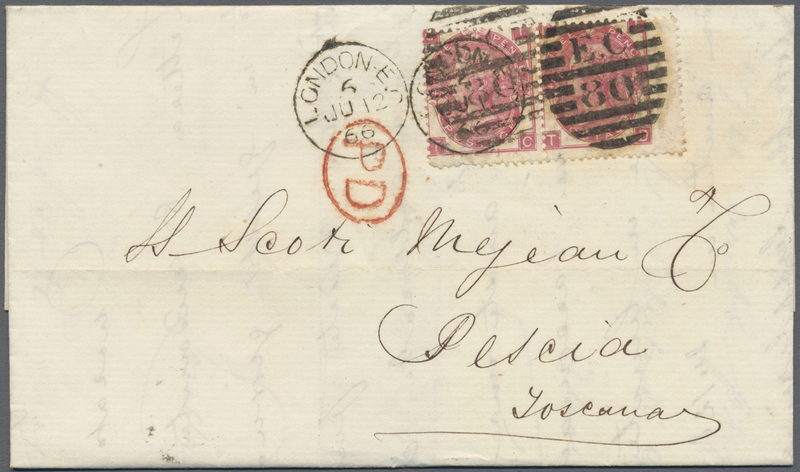 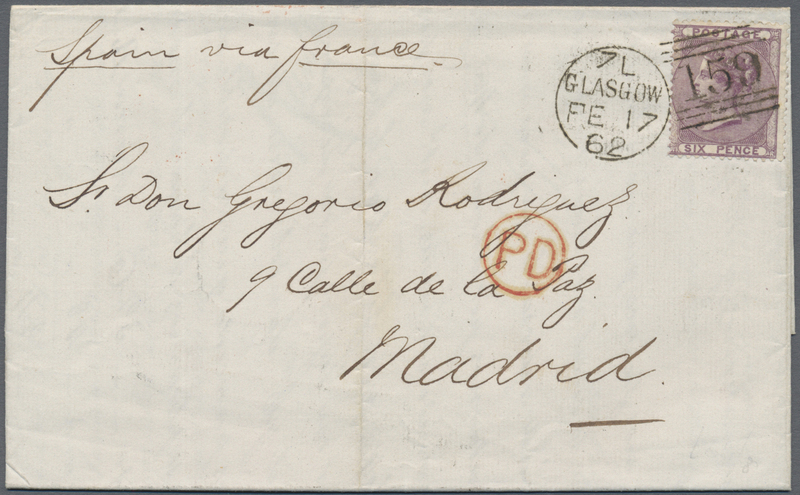 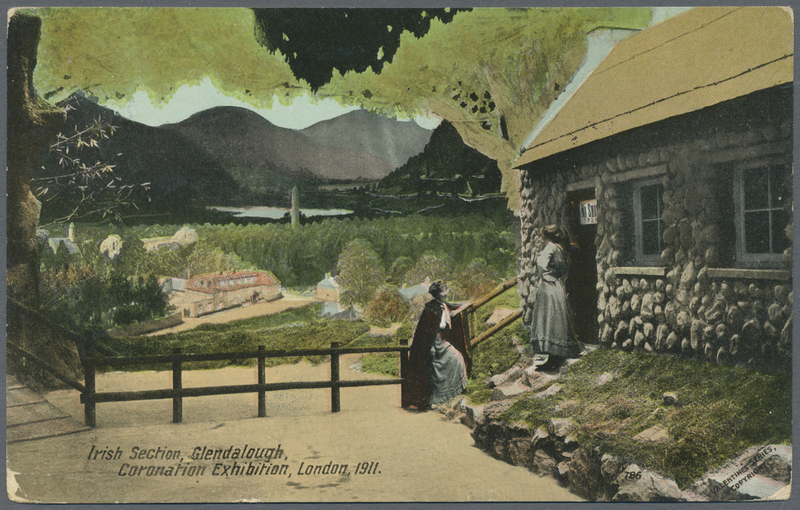 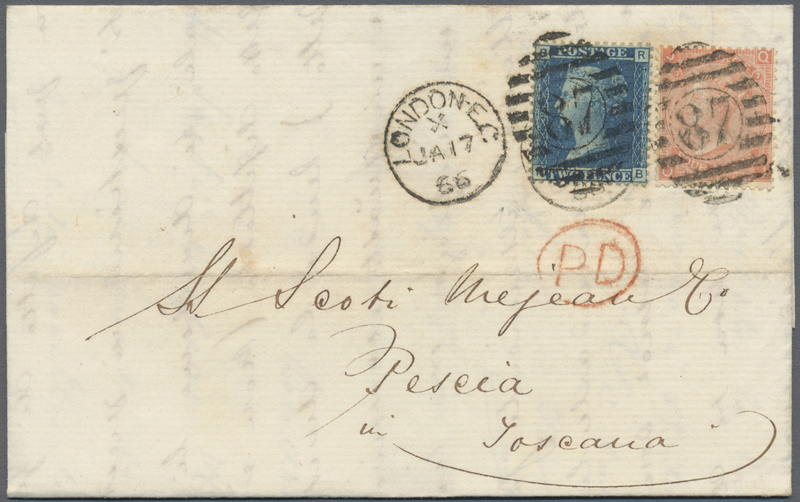 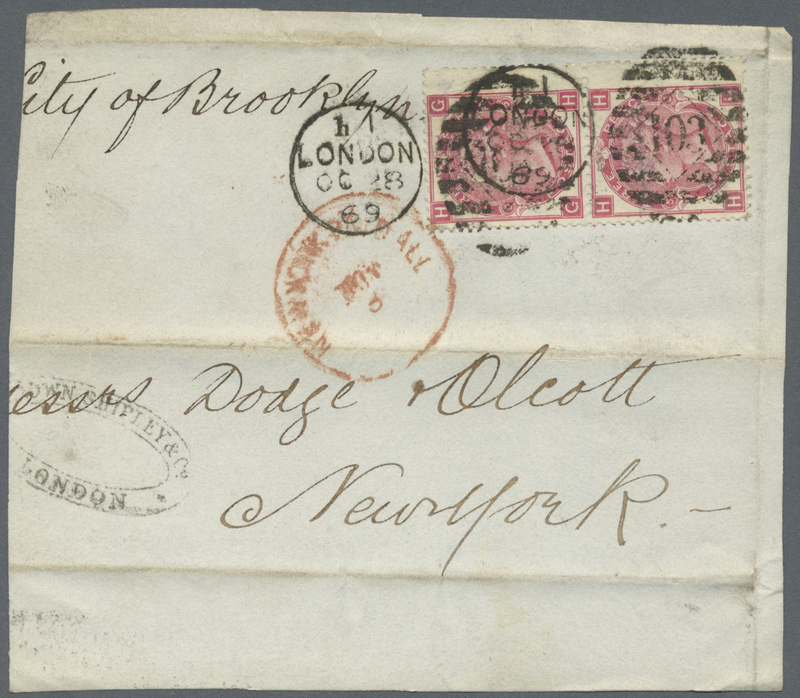 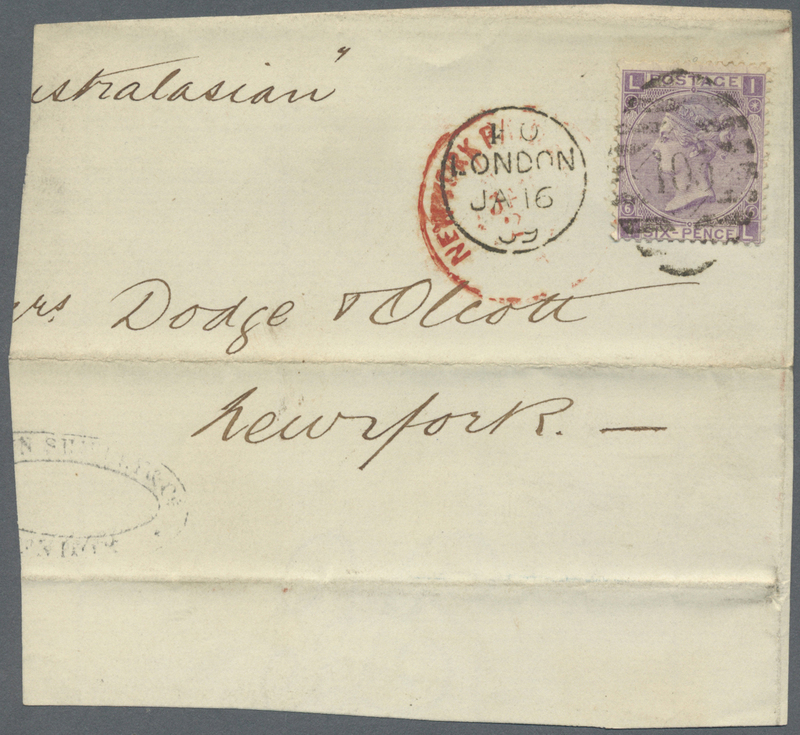 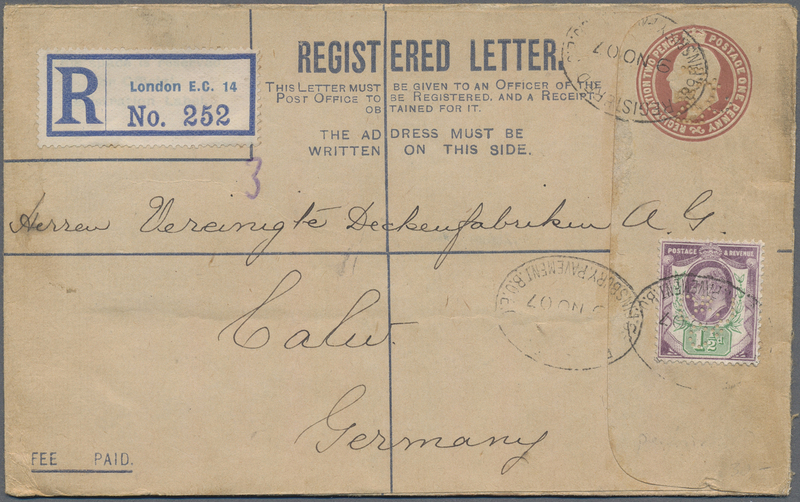 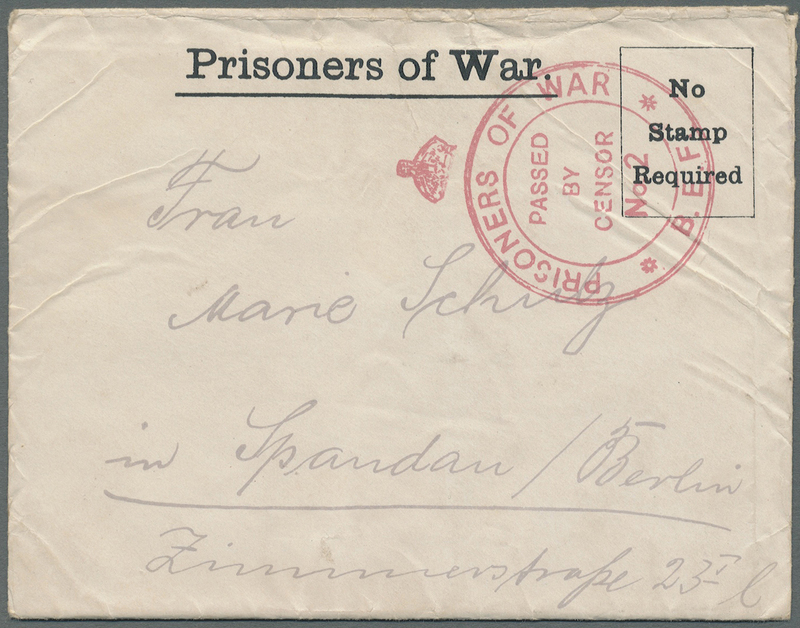 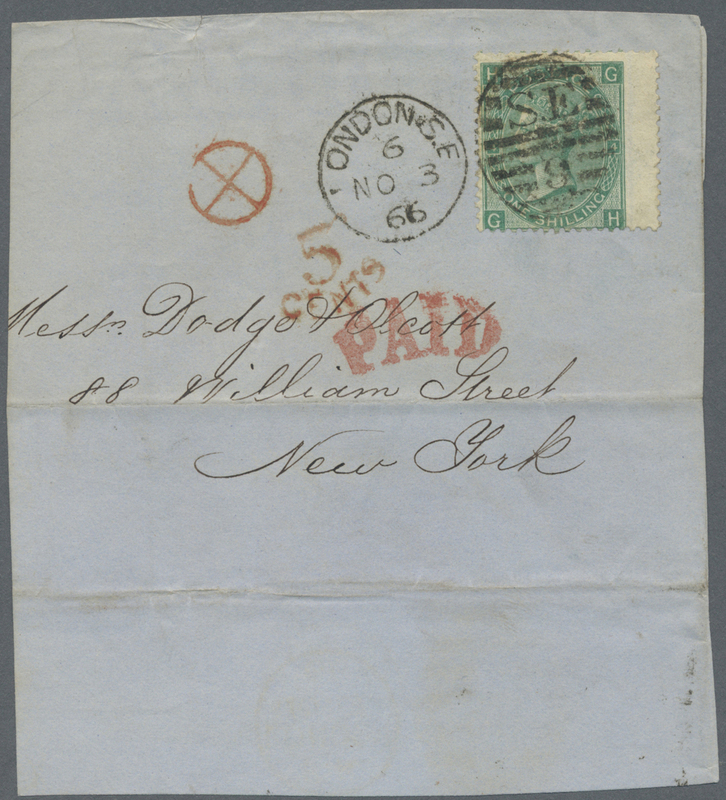 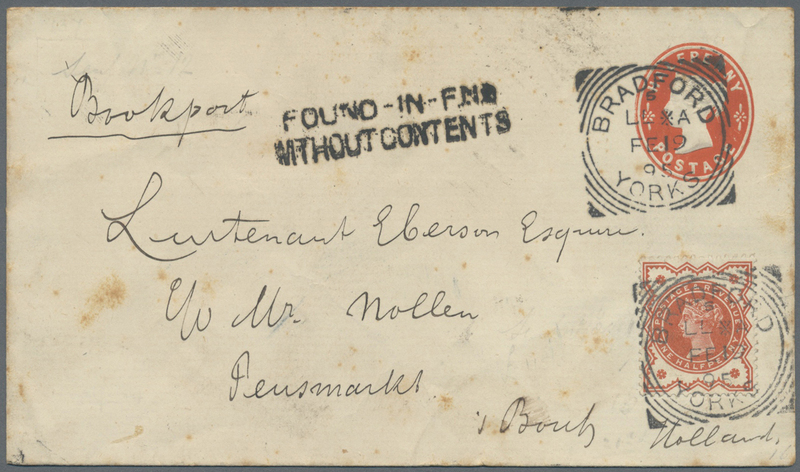 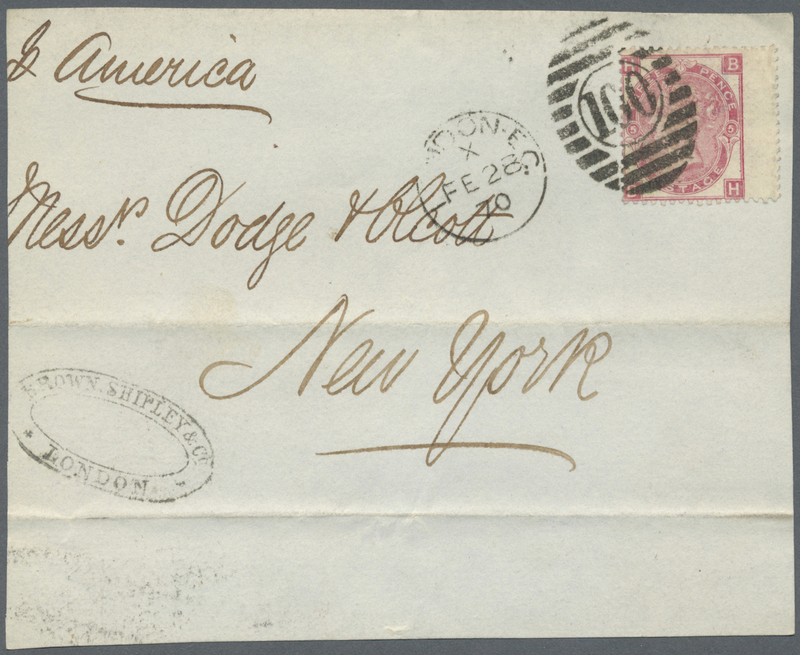 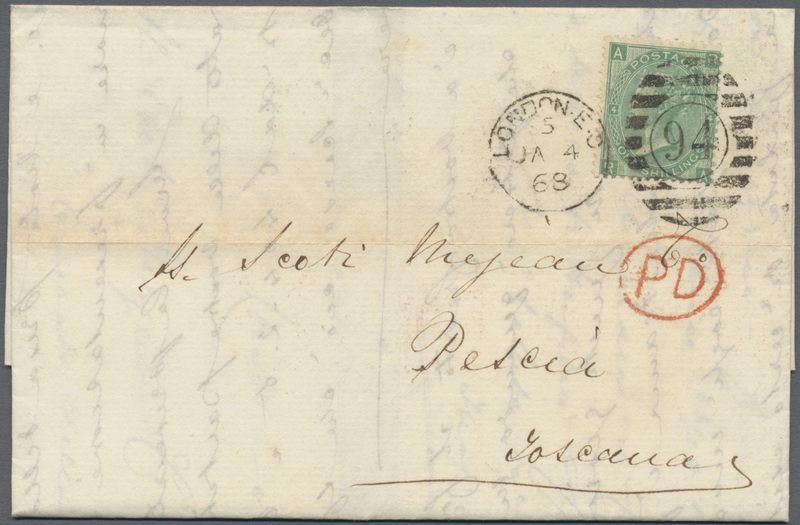 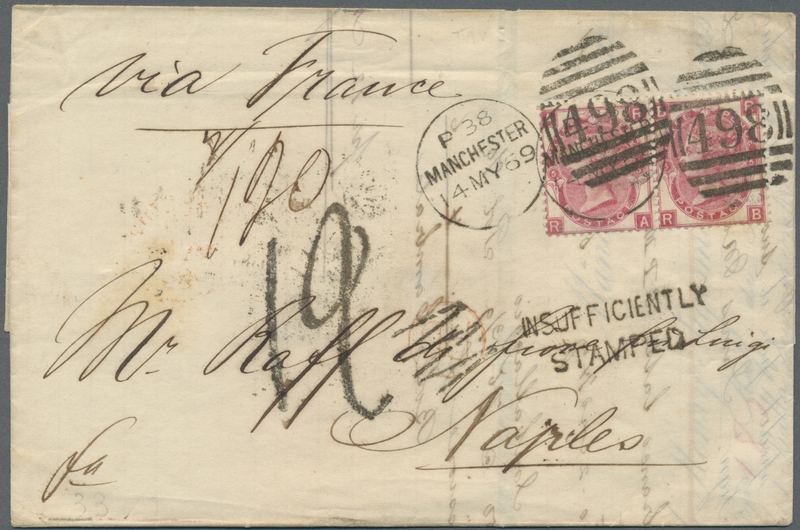 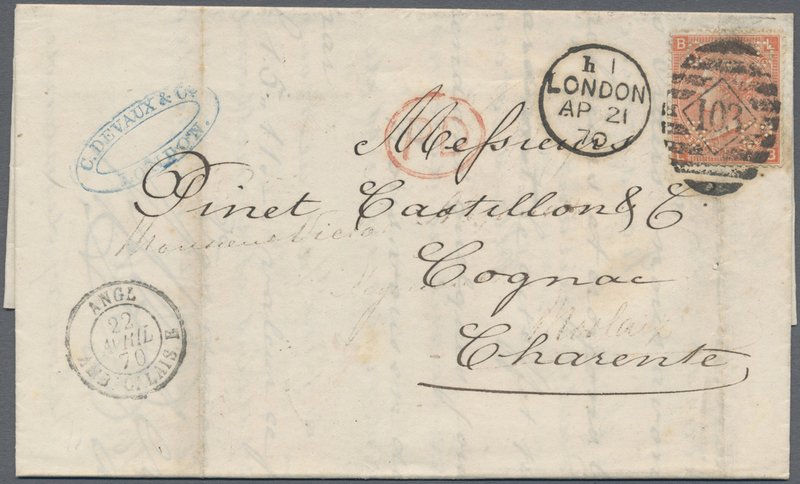 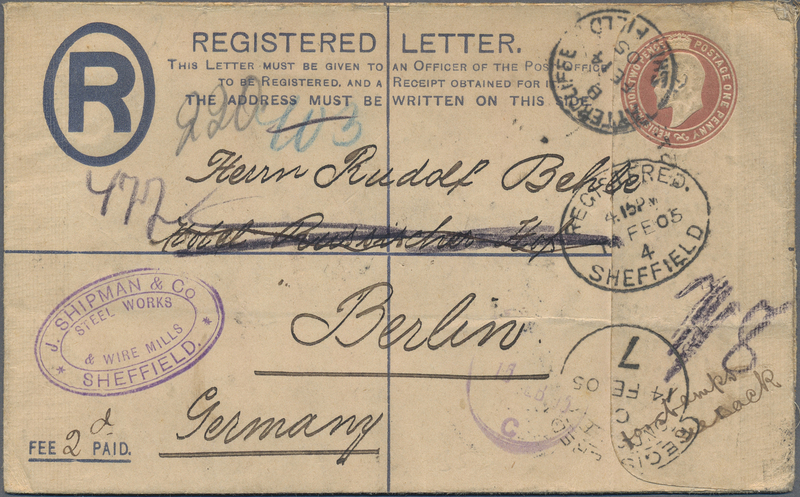 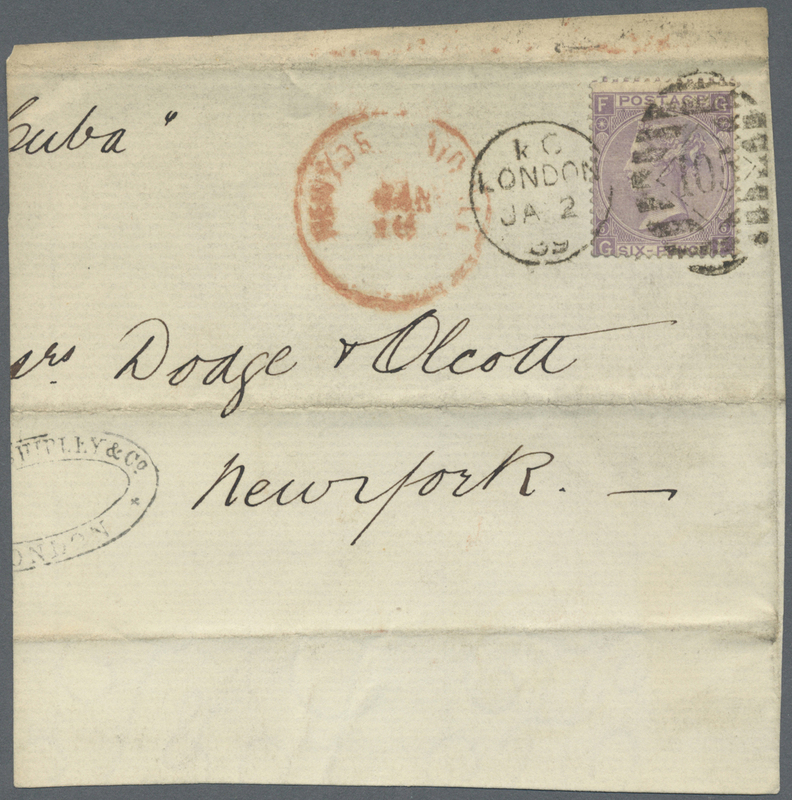 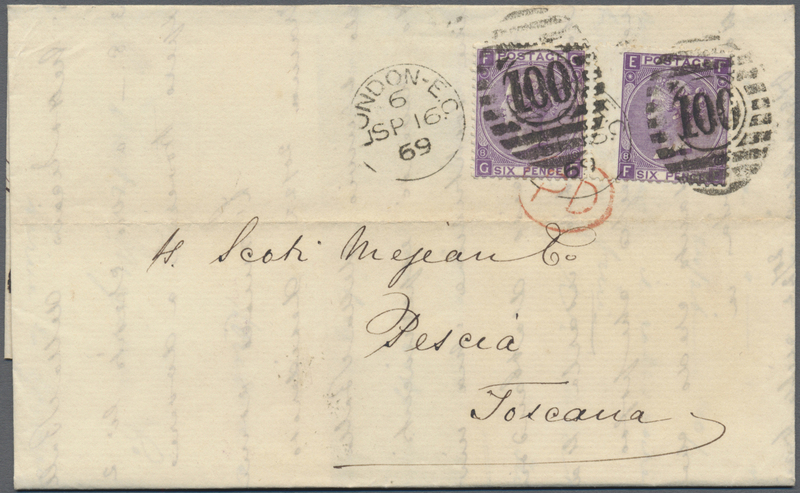 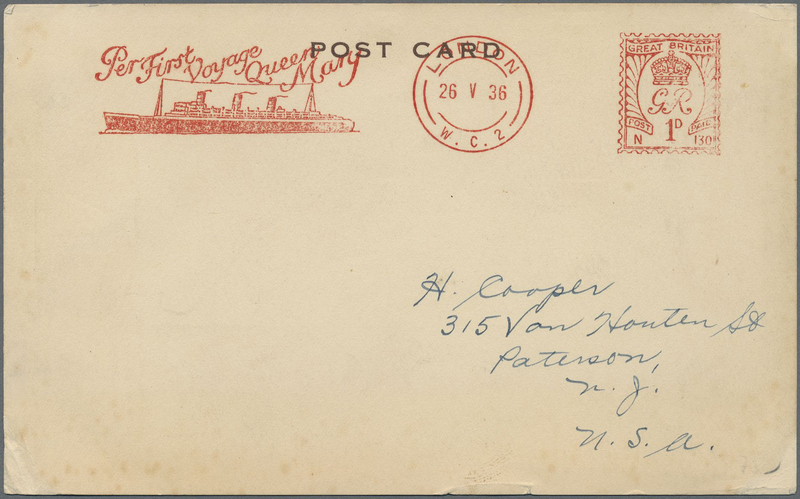 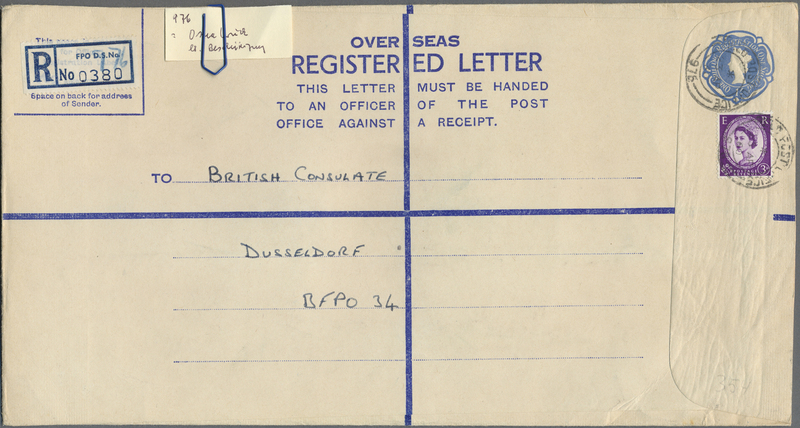 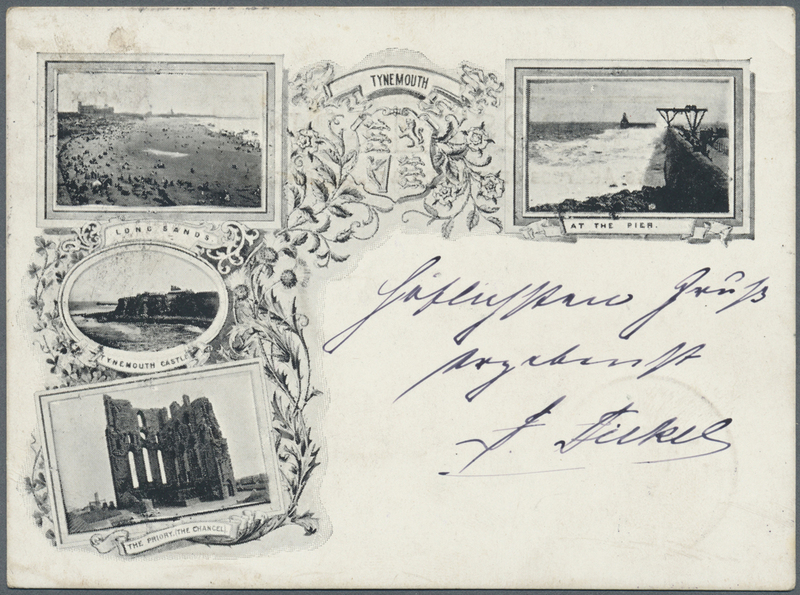 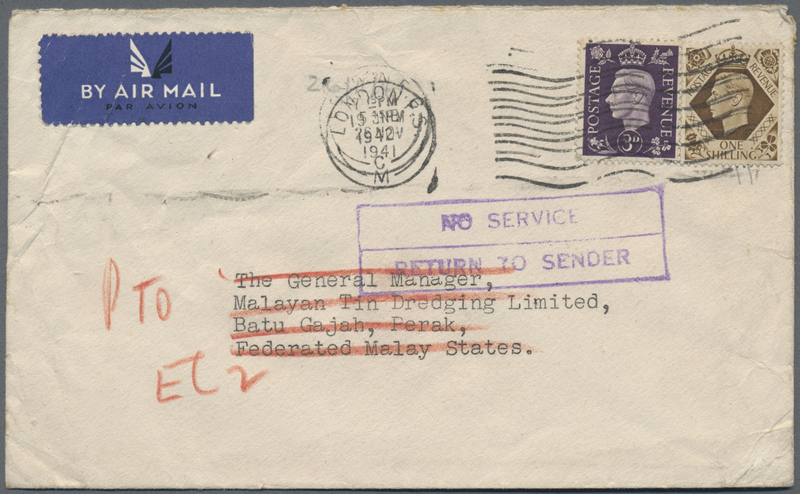 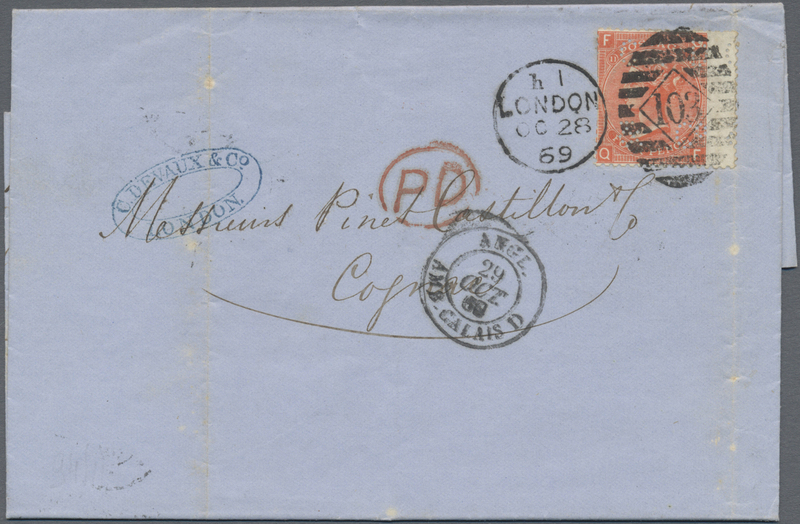 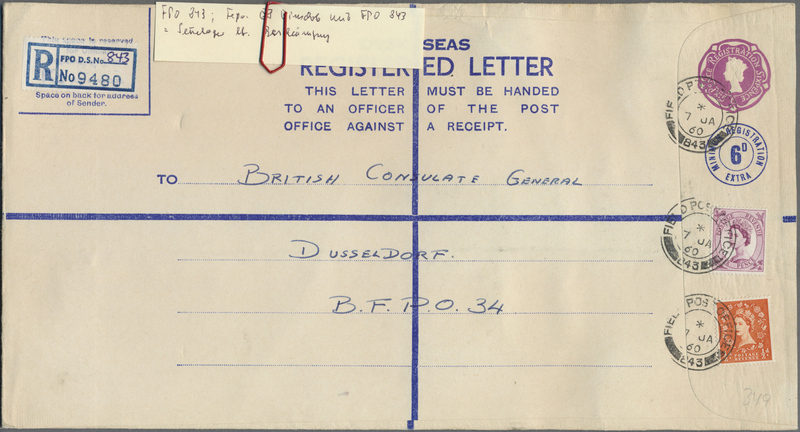 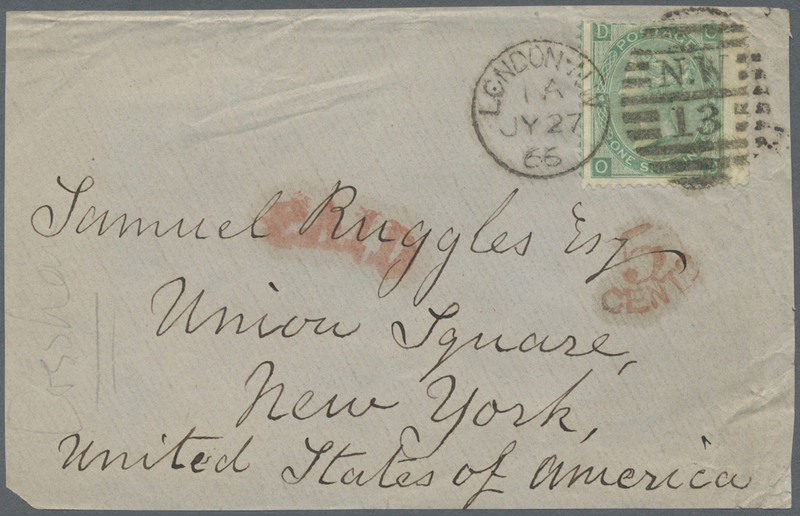 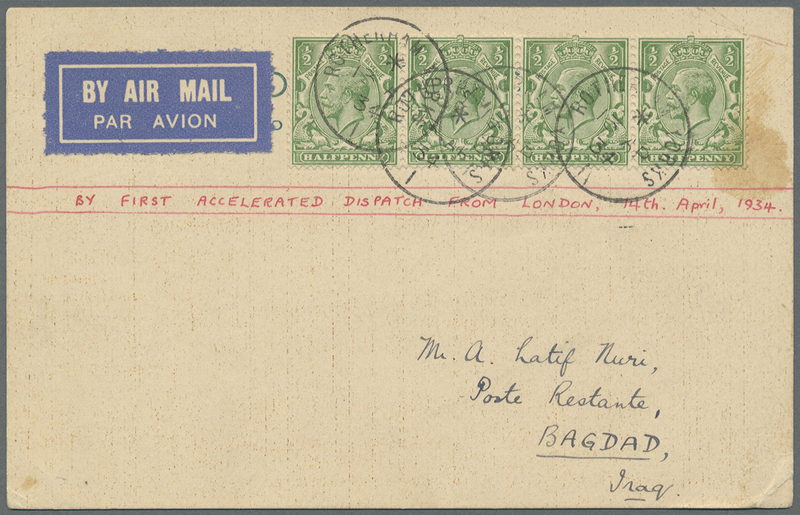 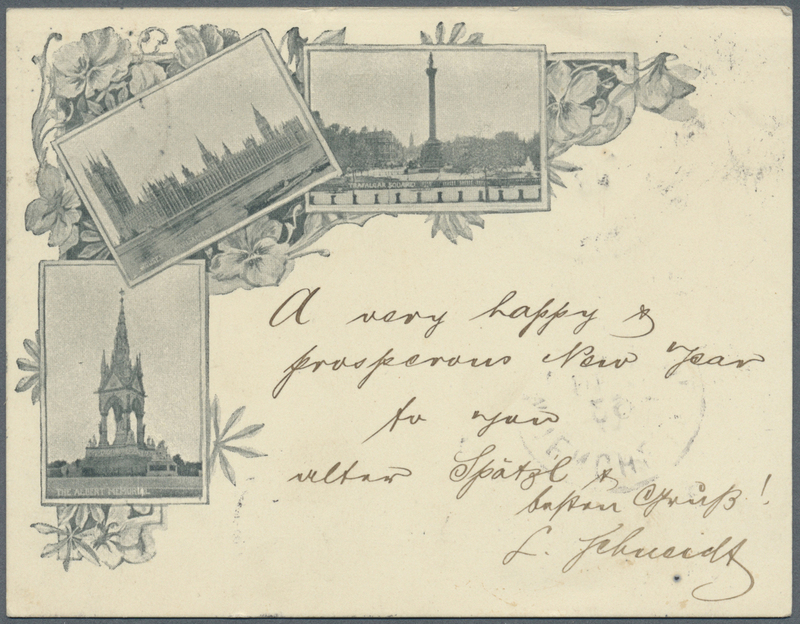 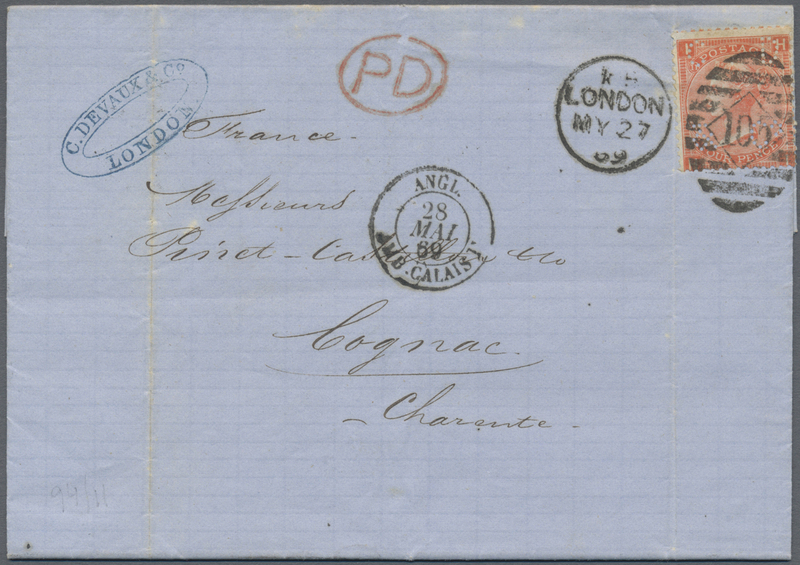 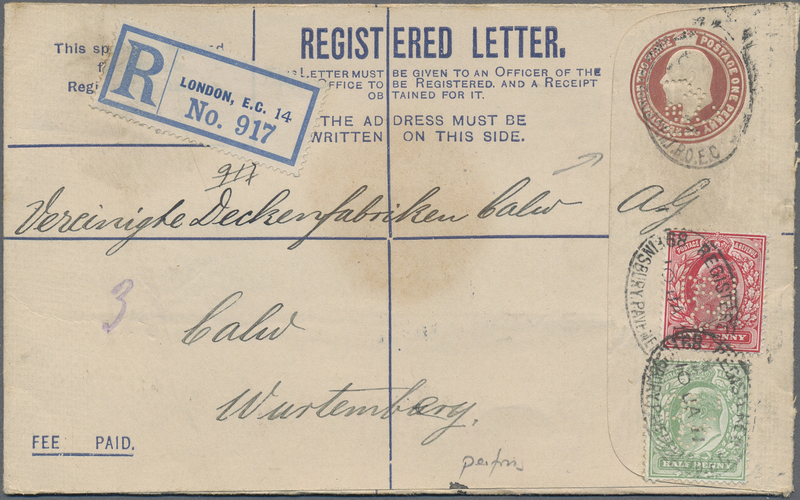 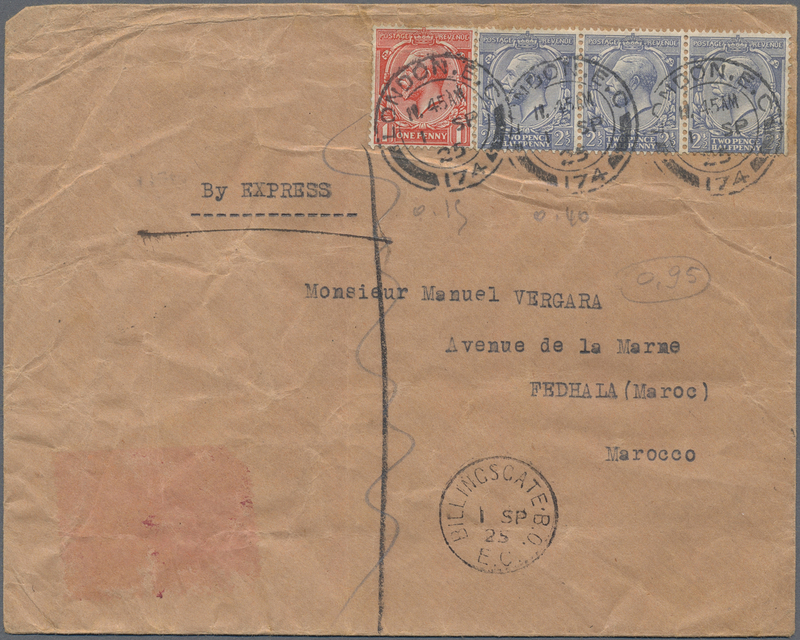 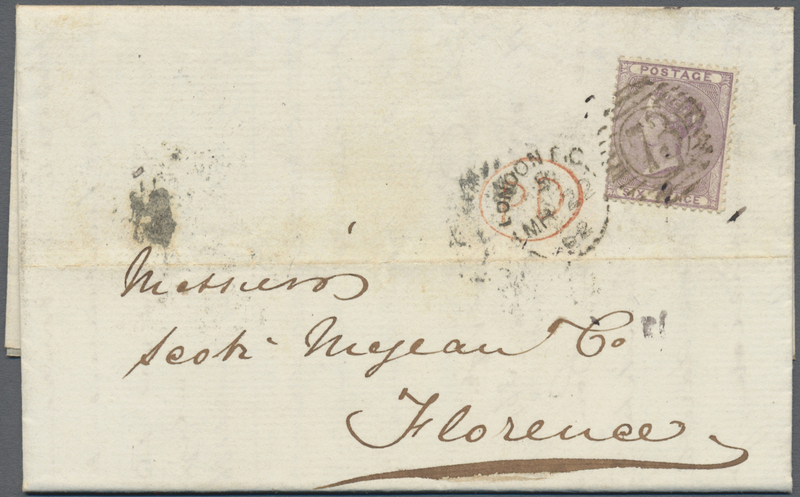 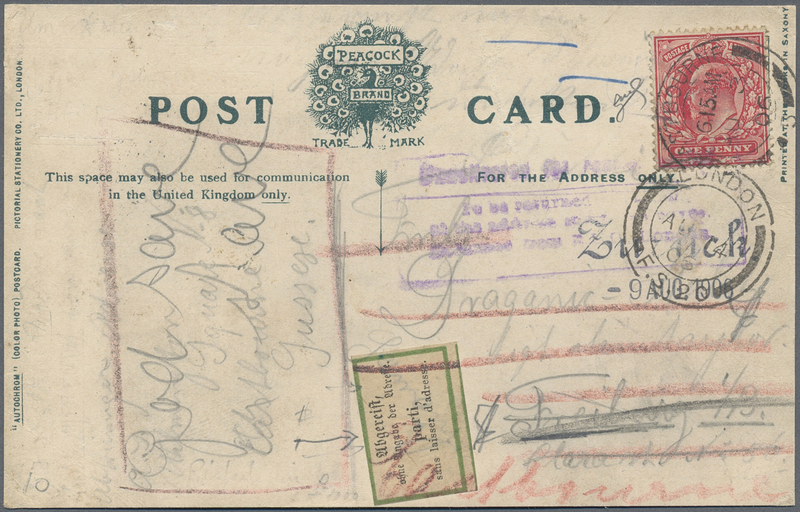 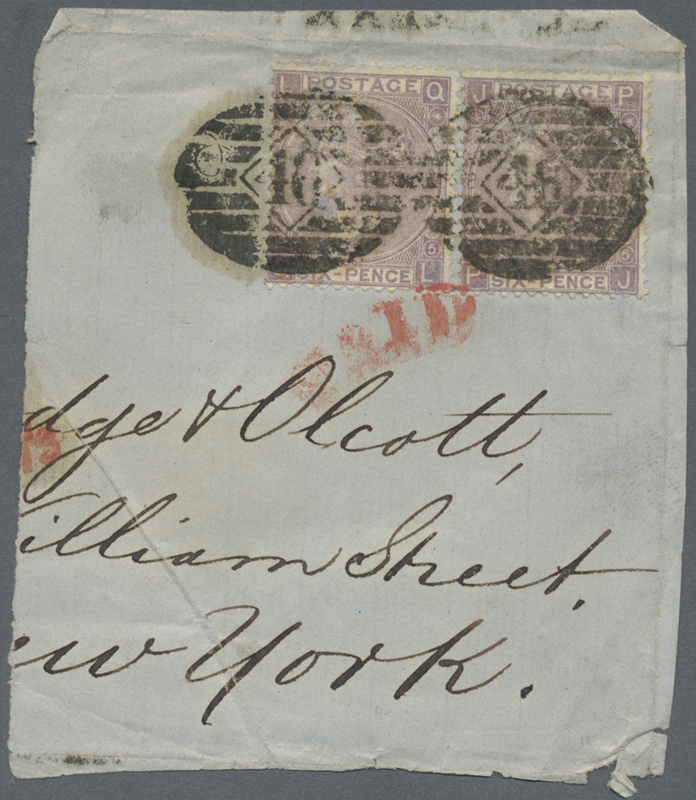 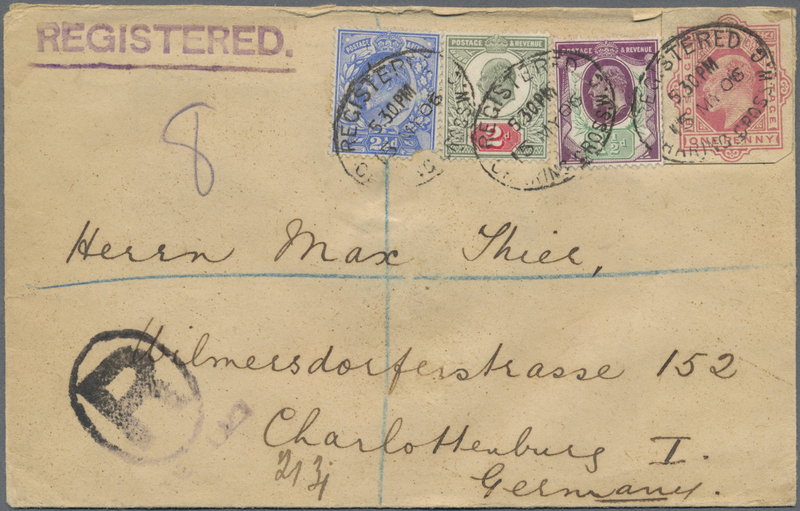 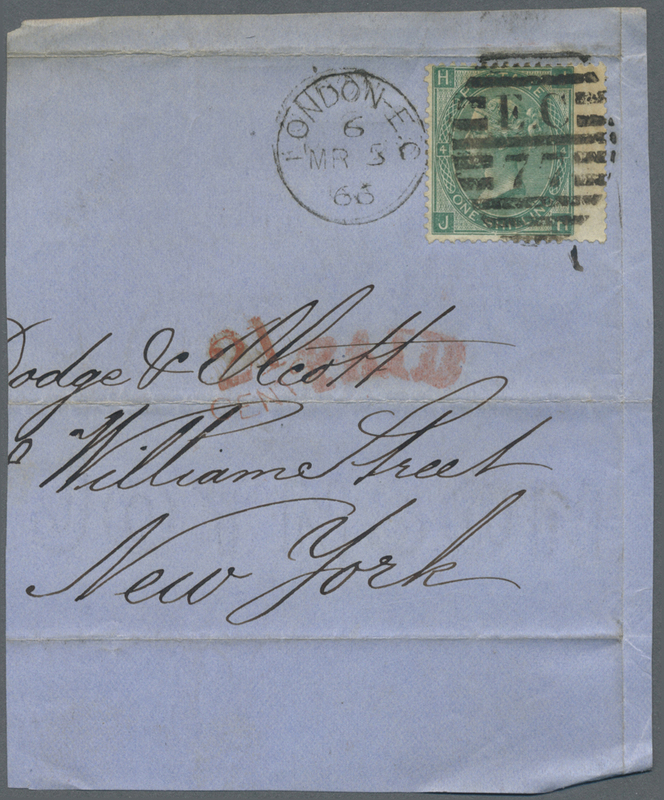 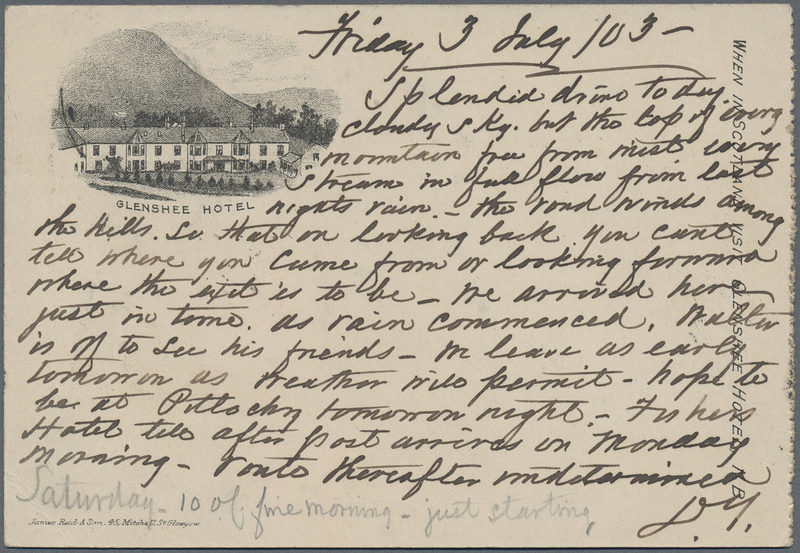 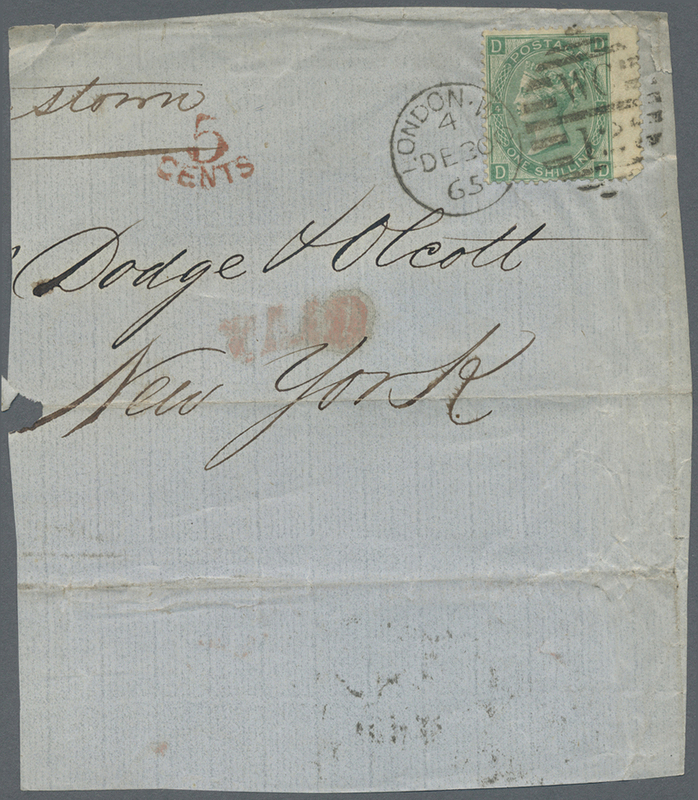 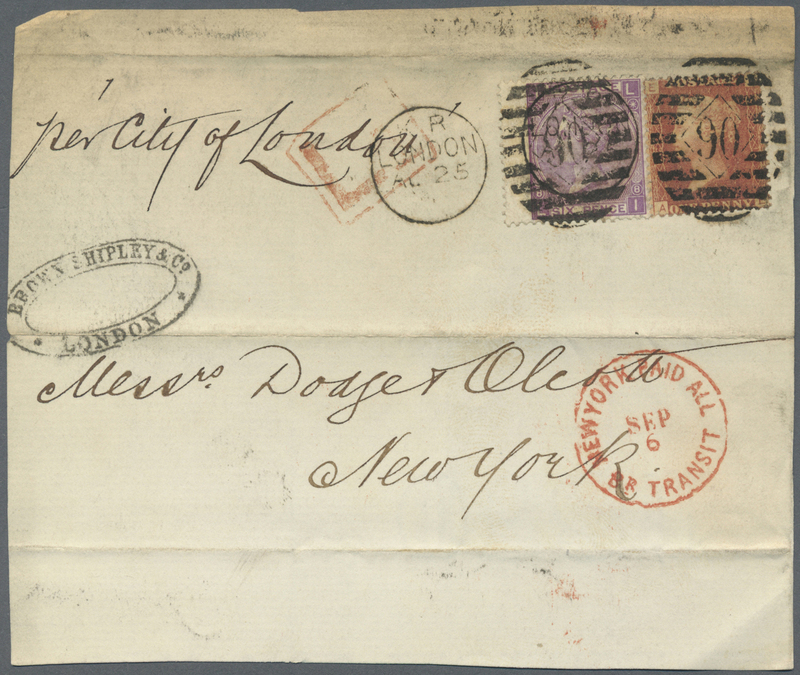 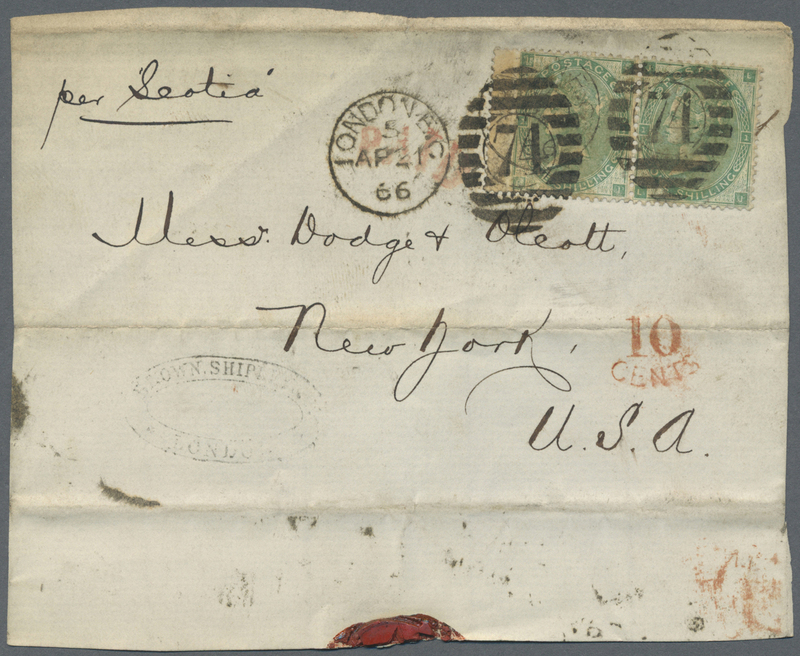 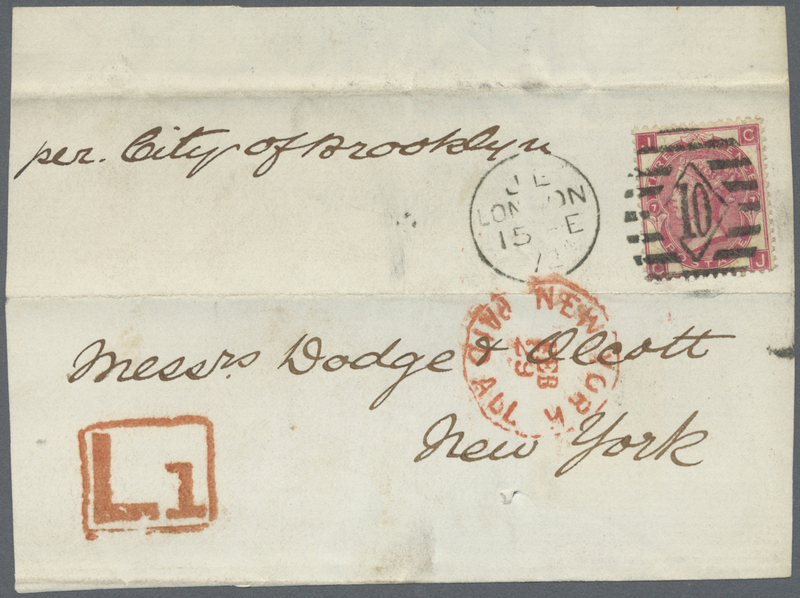 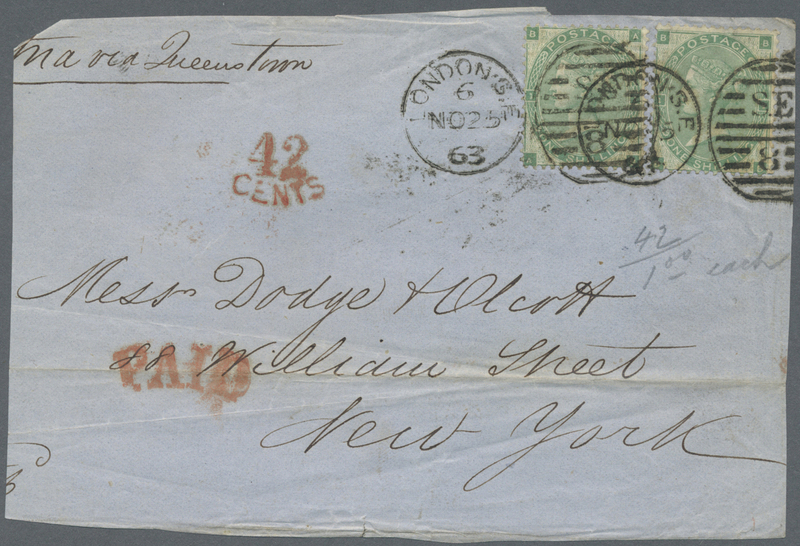 : About 50 covers and postal stationery items sent to PERSIA, with registered mail (incl. 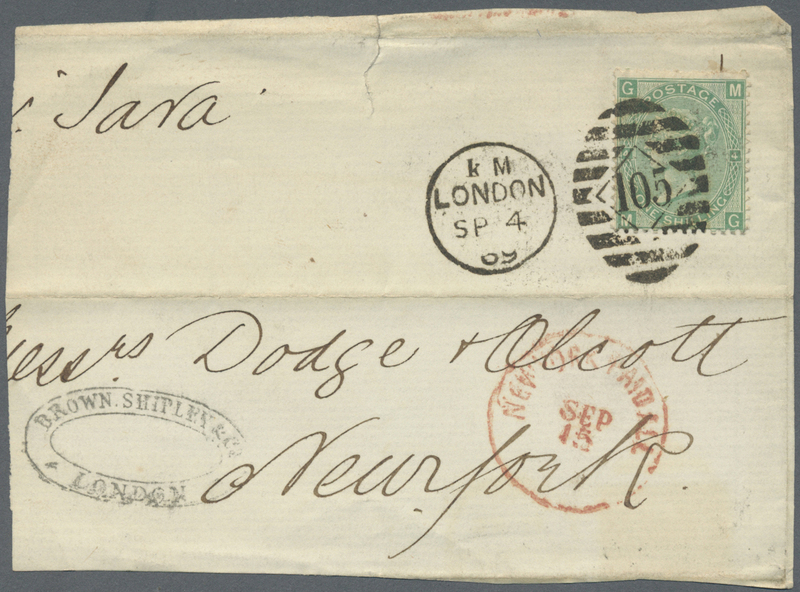 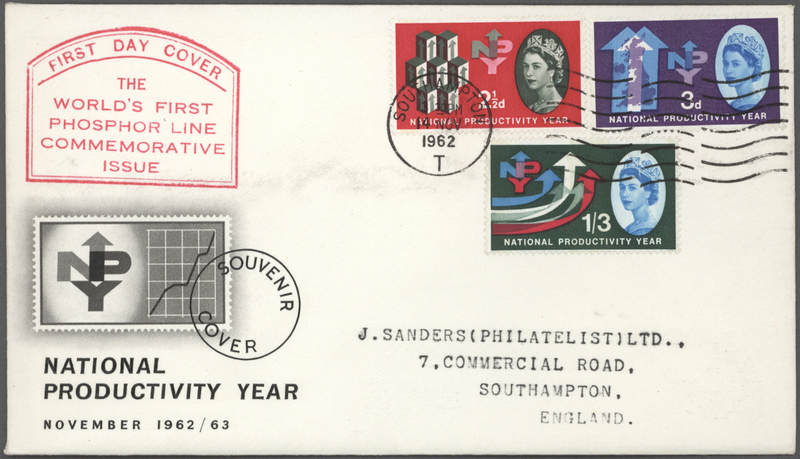 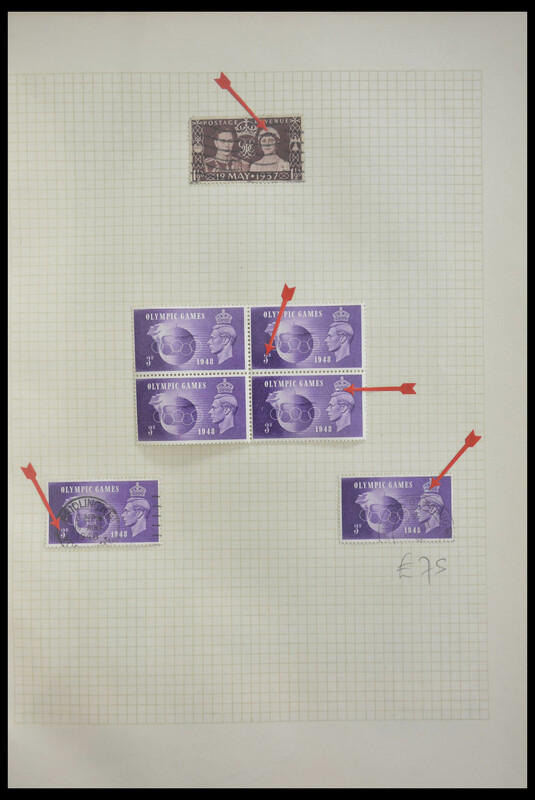 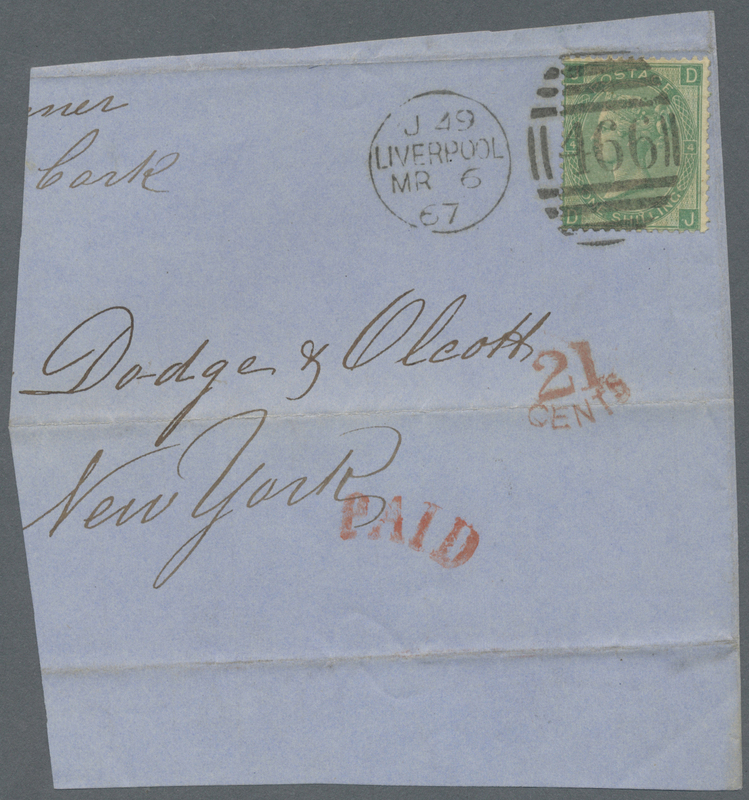 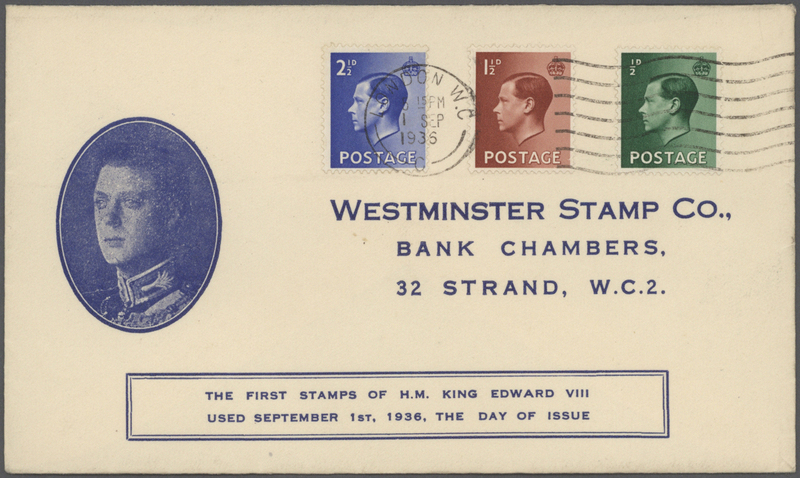 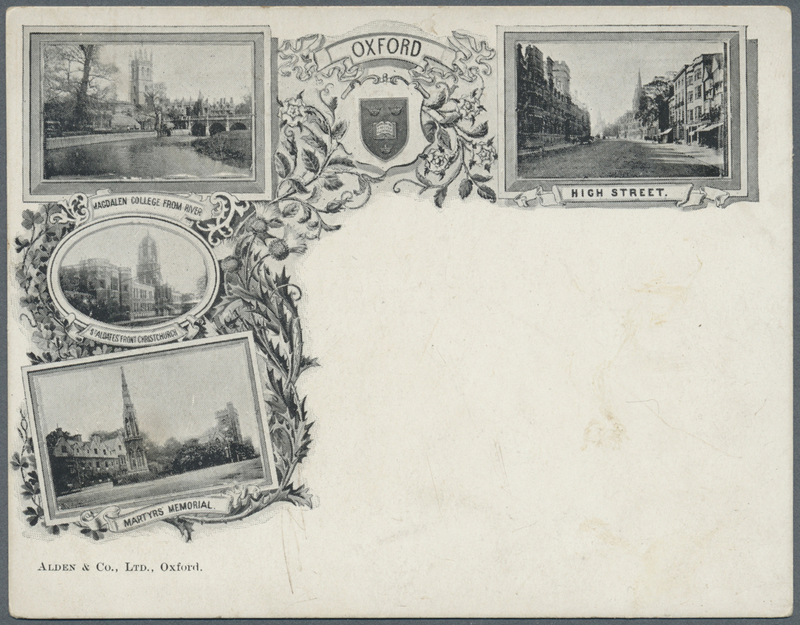 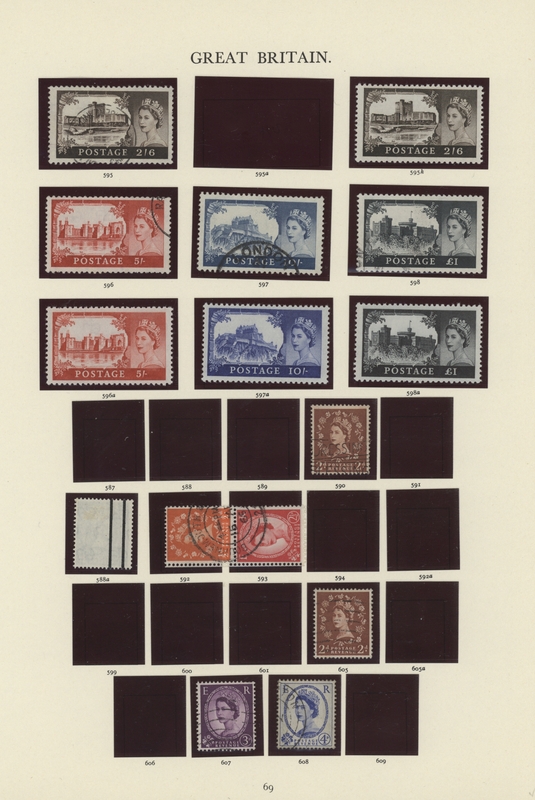 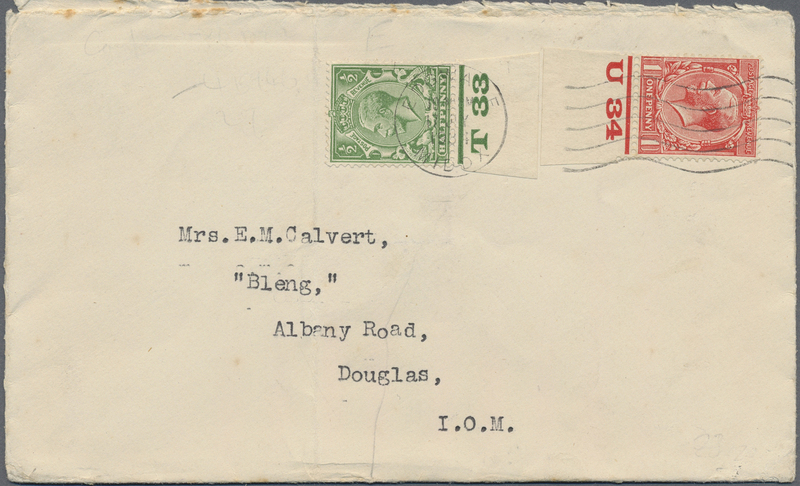 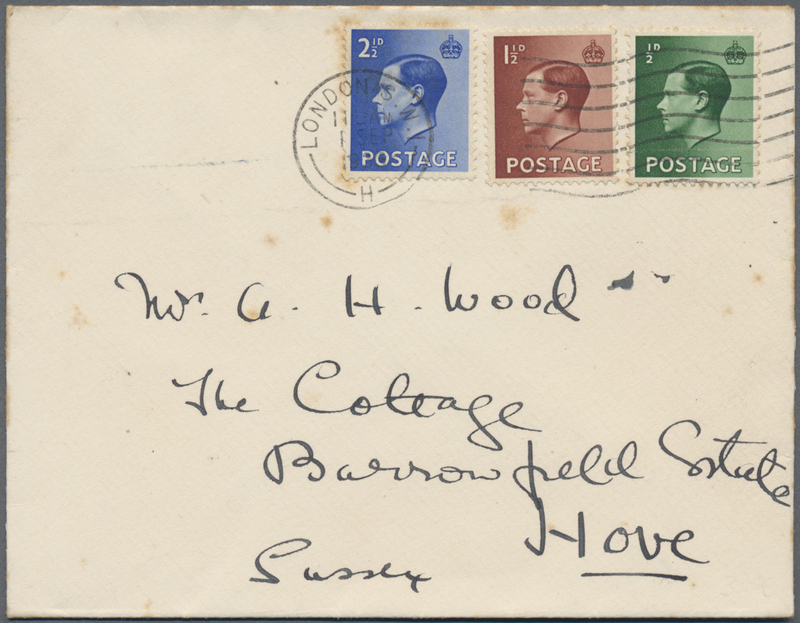 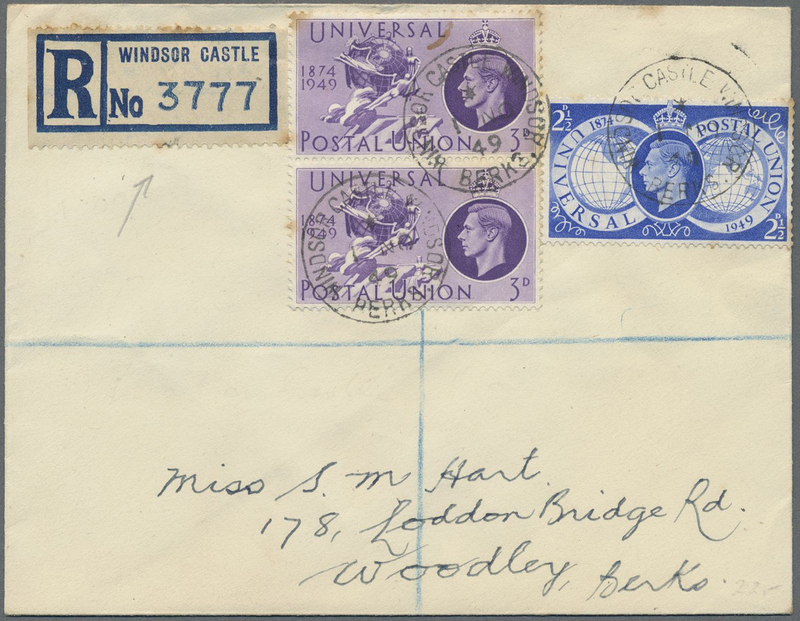 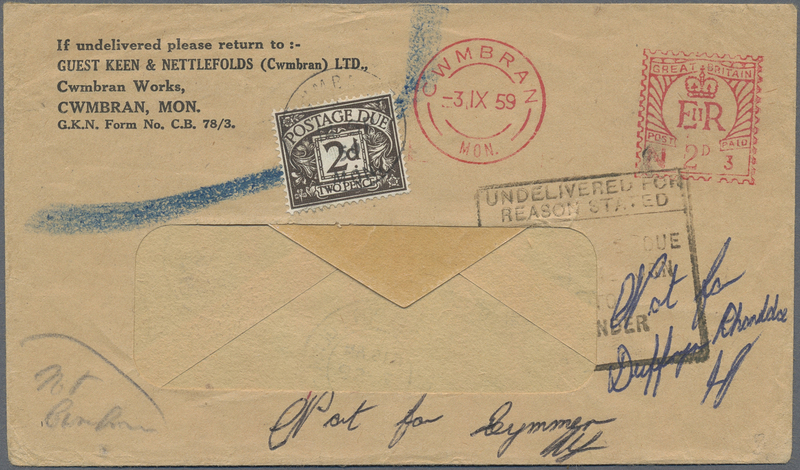 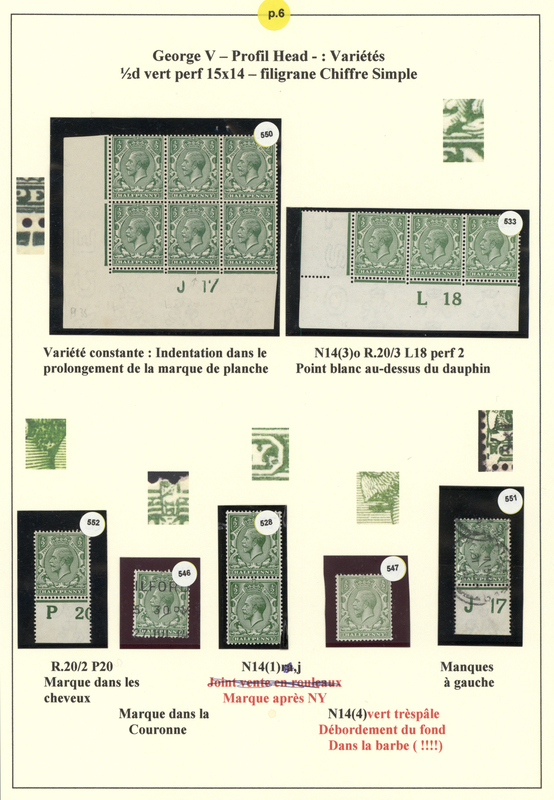 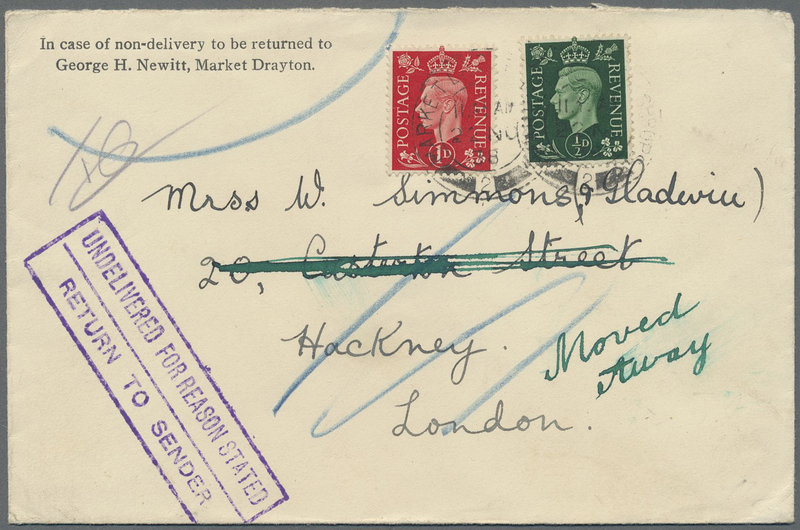 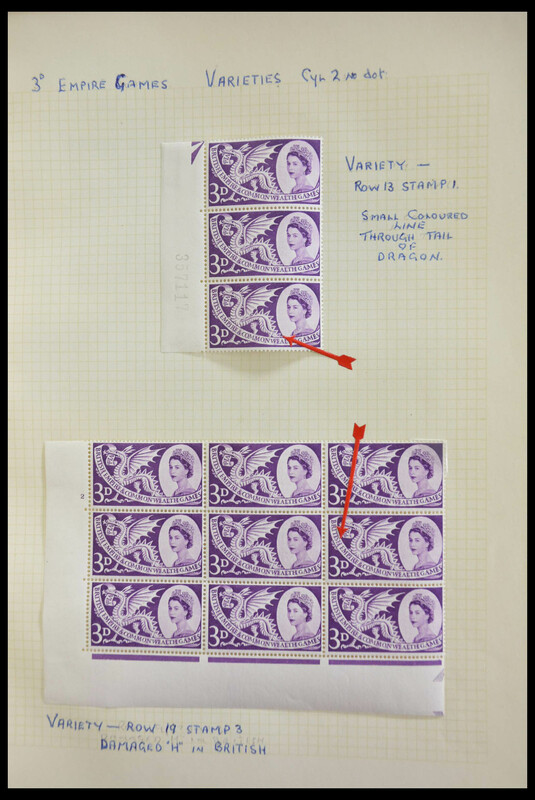 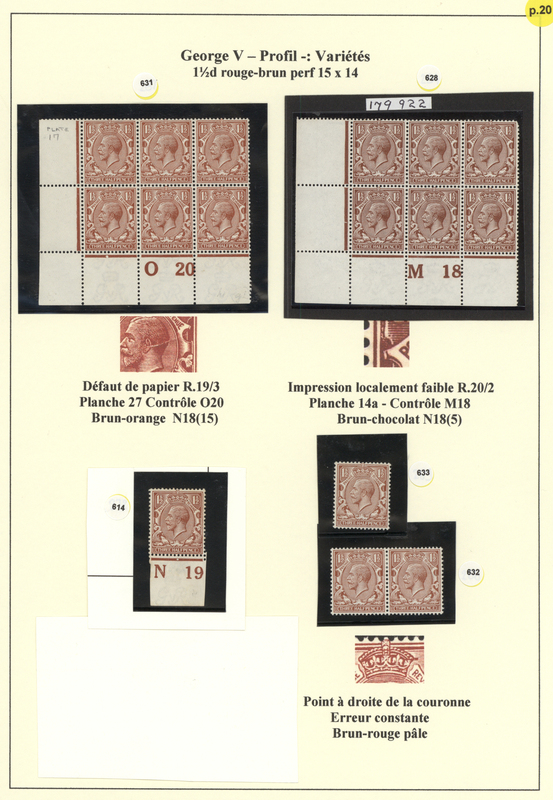 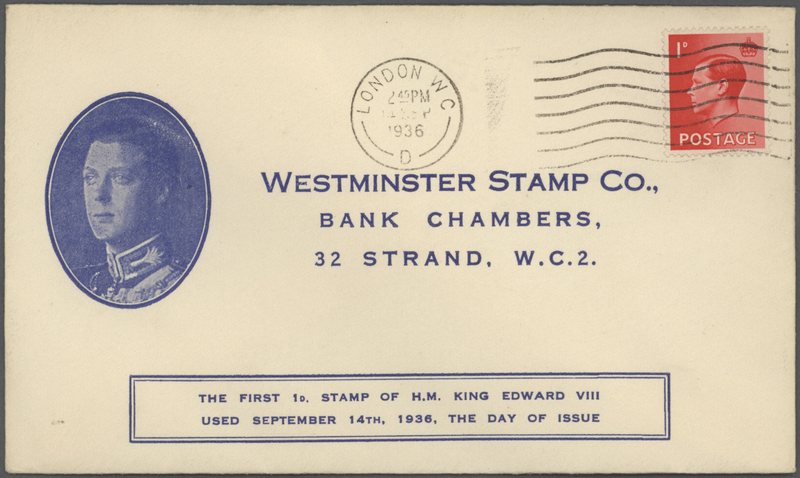 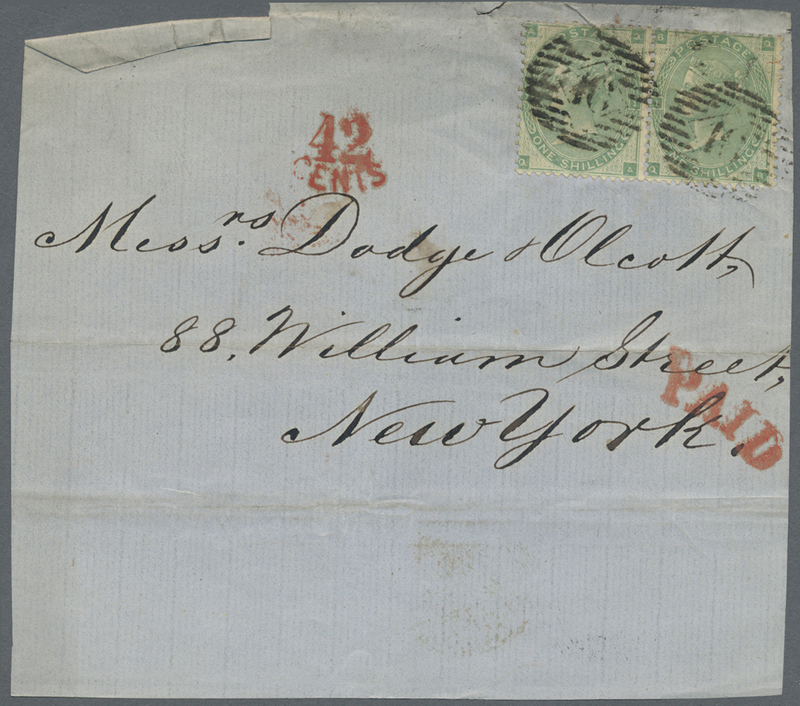 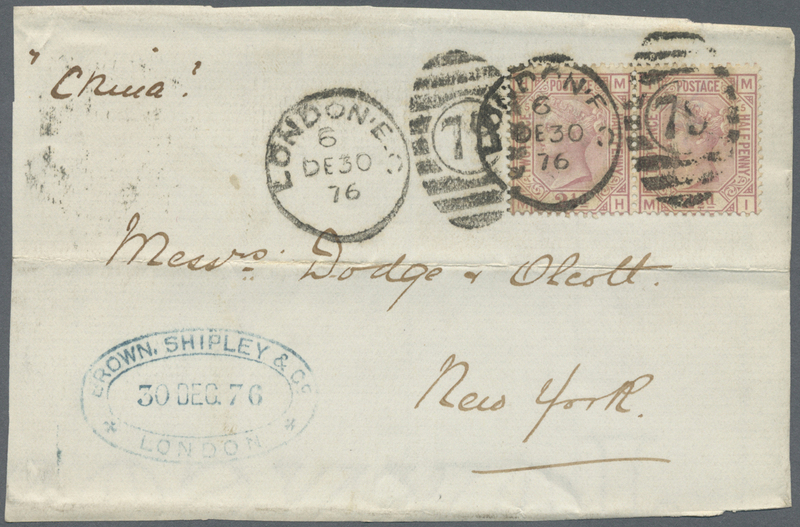 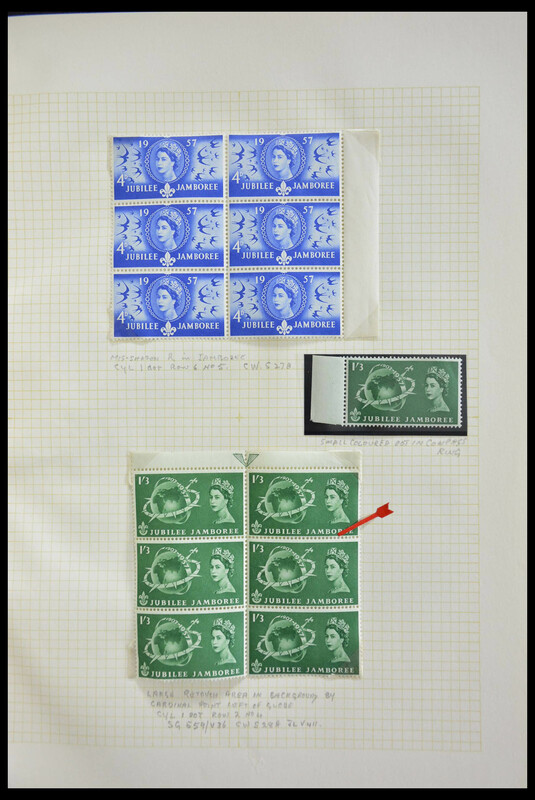 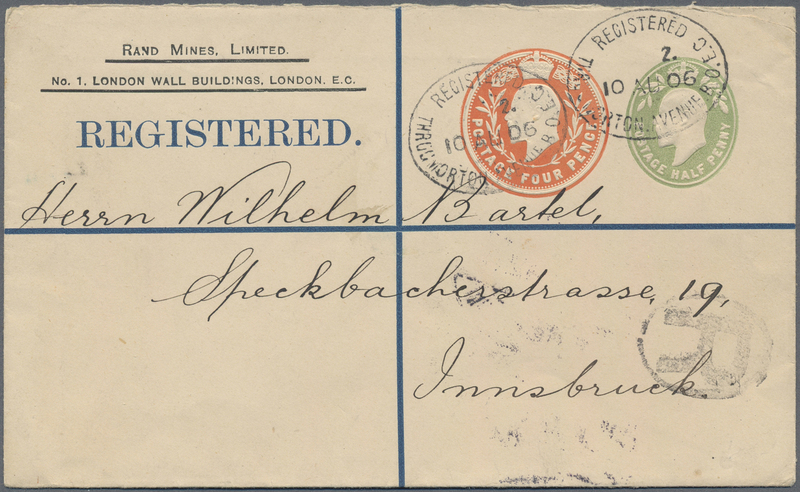 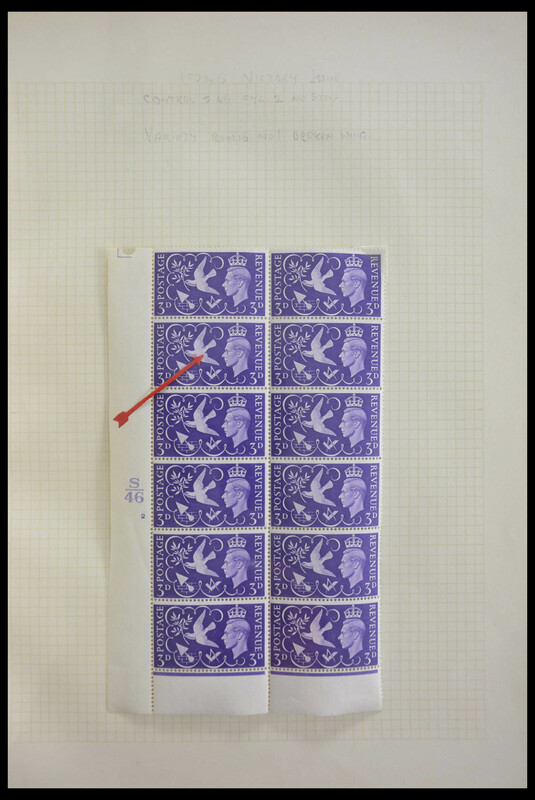 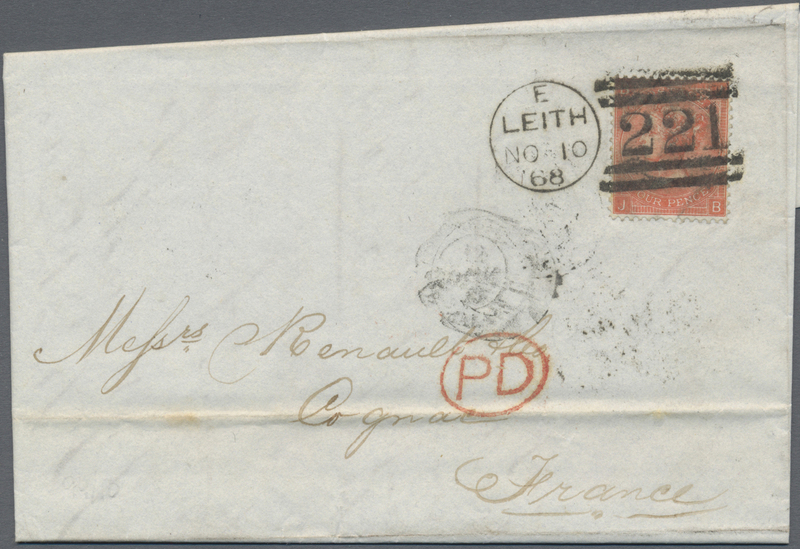 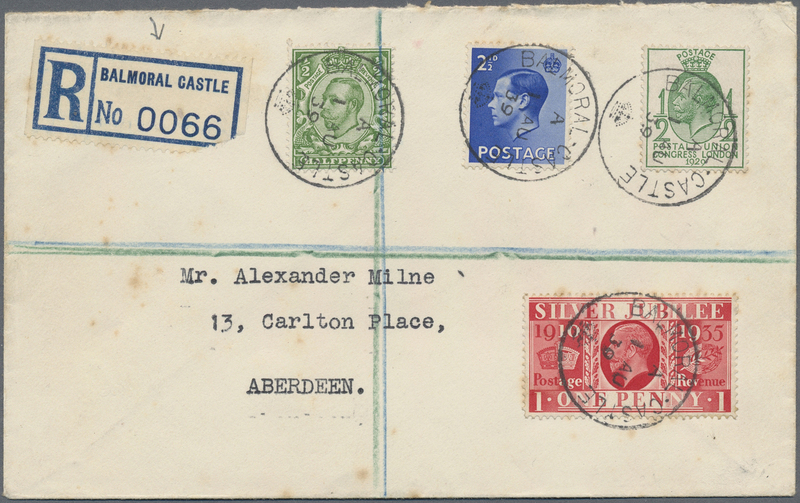 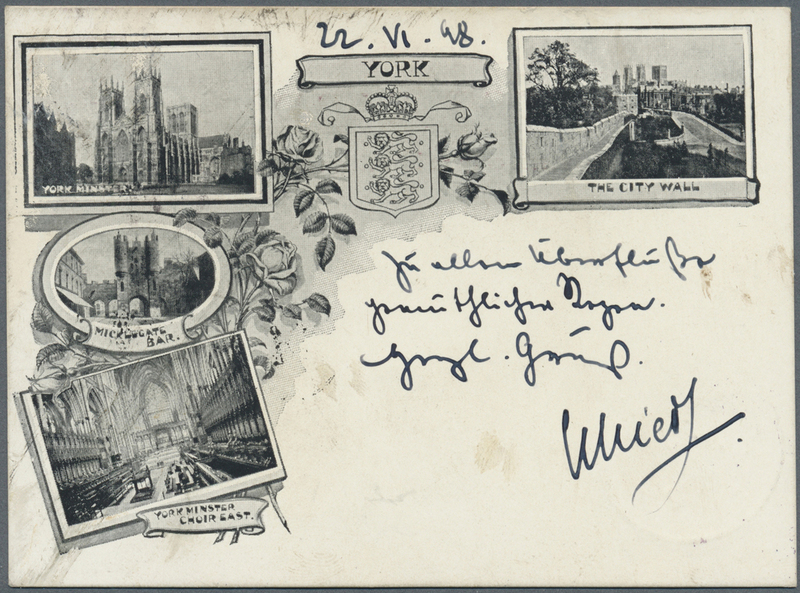 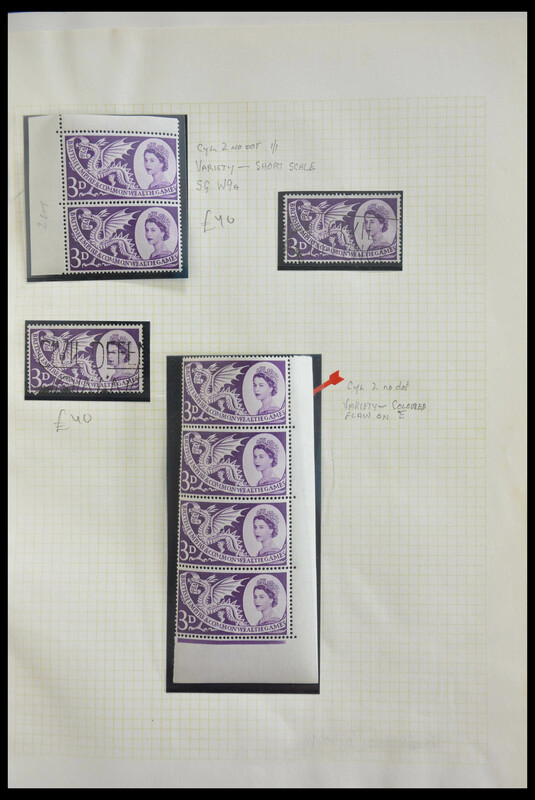 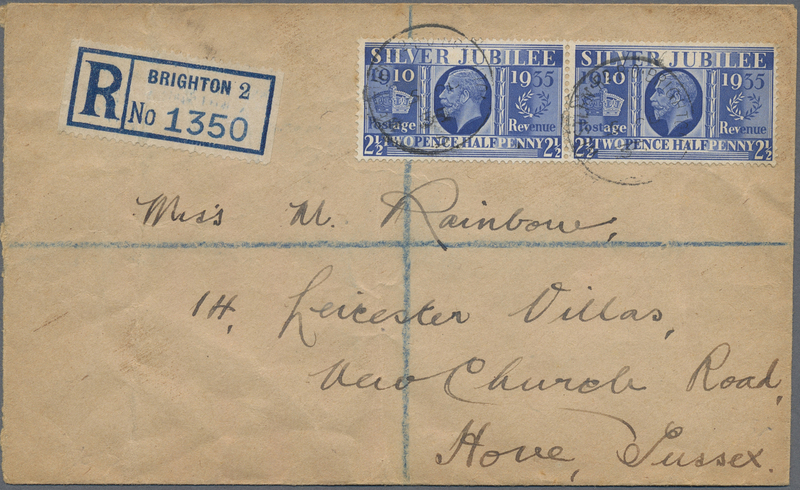 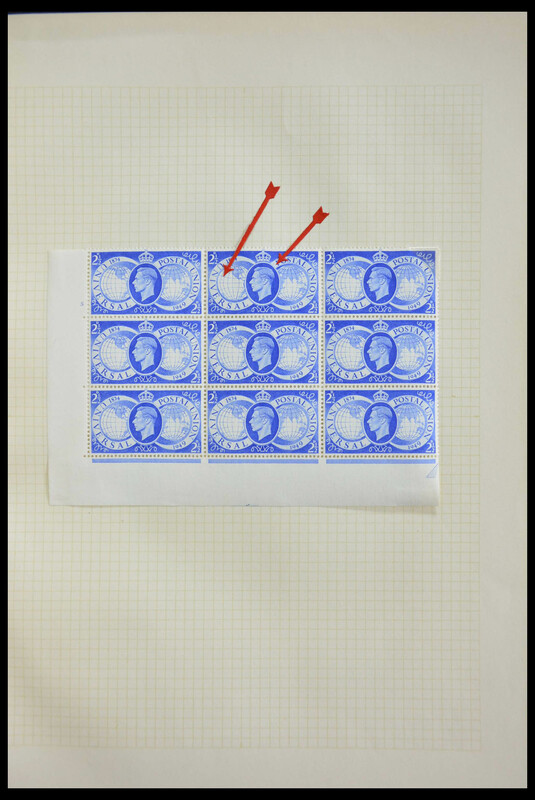 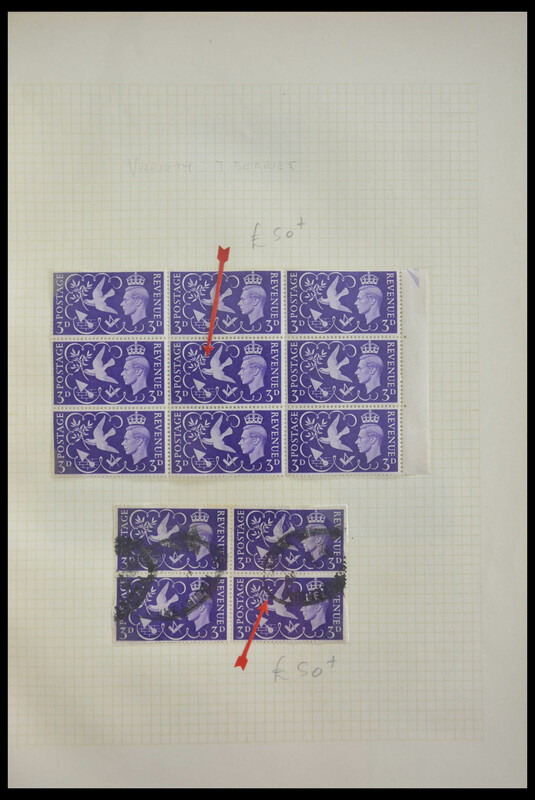 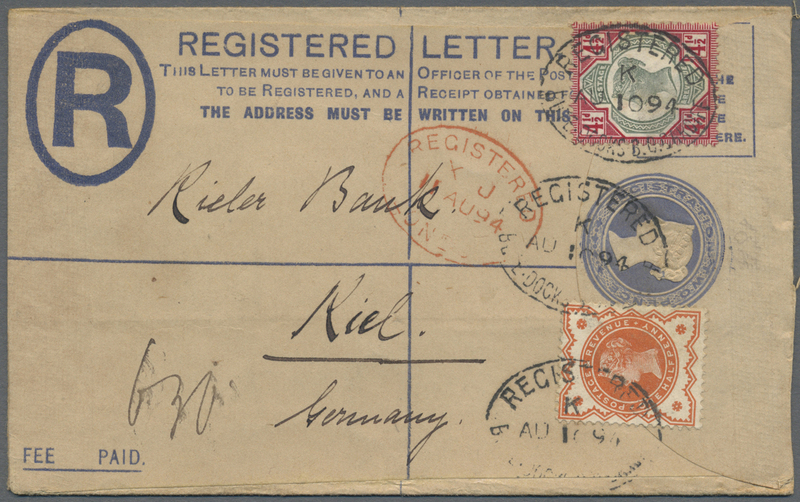 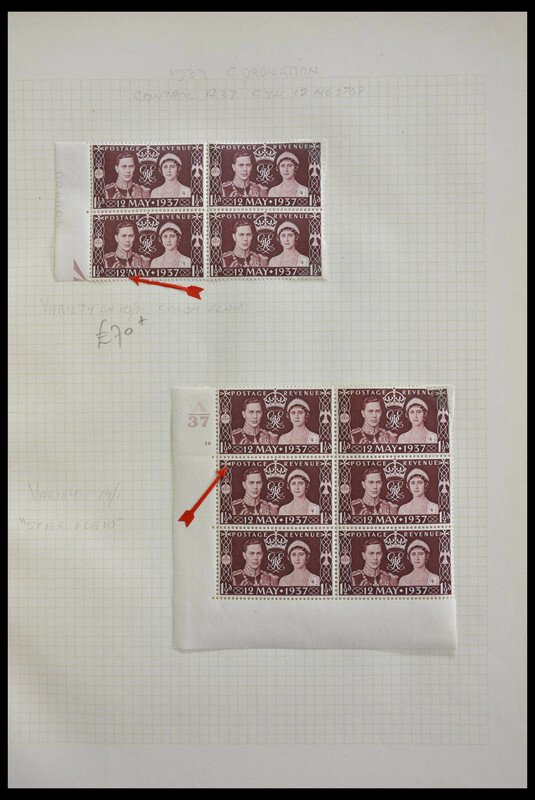 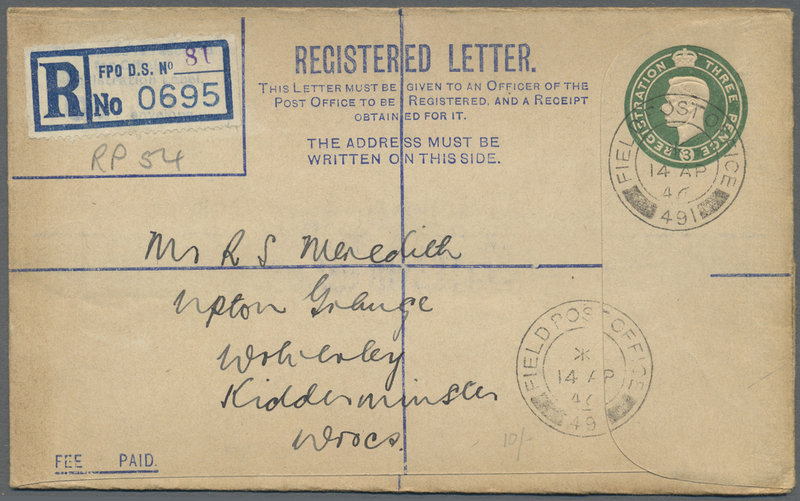 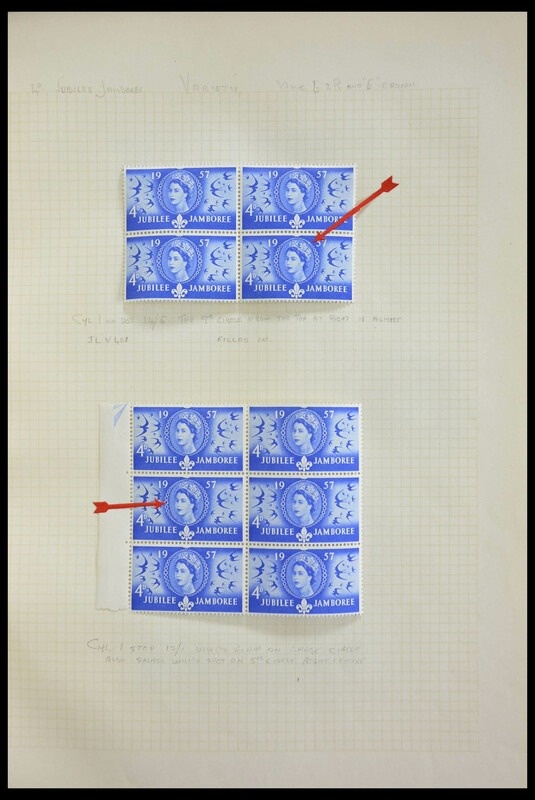 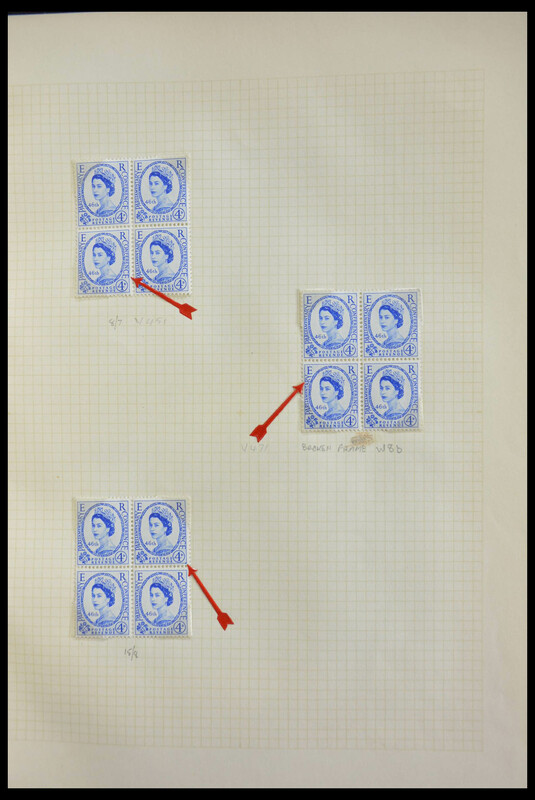 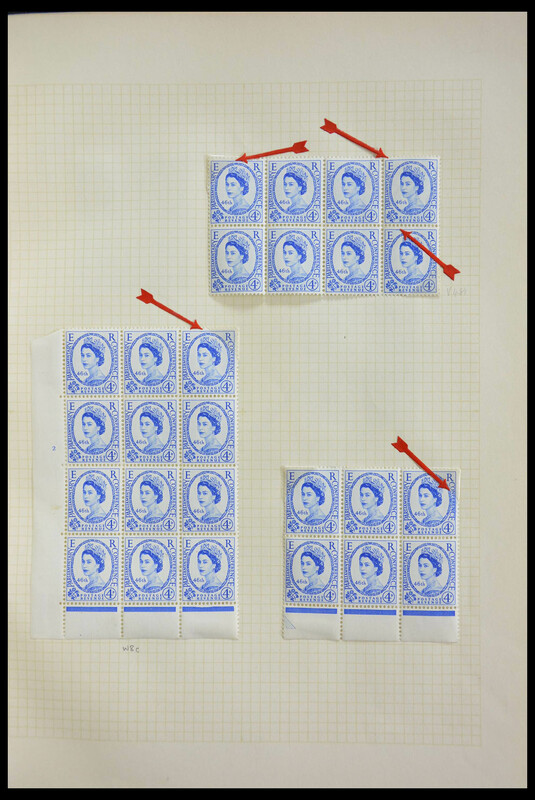 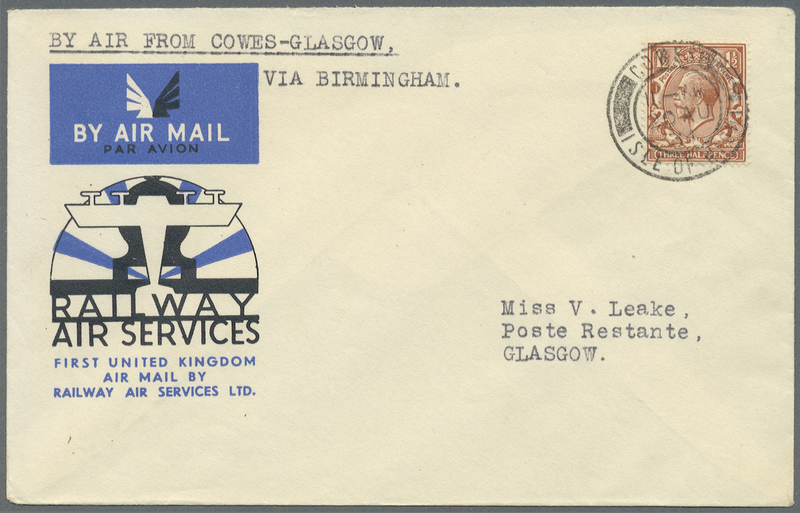 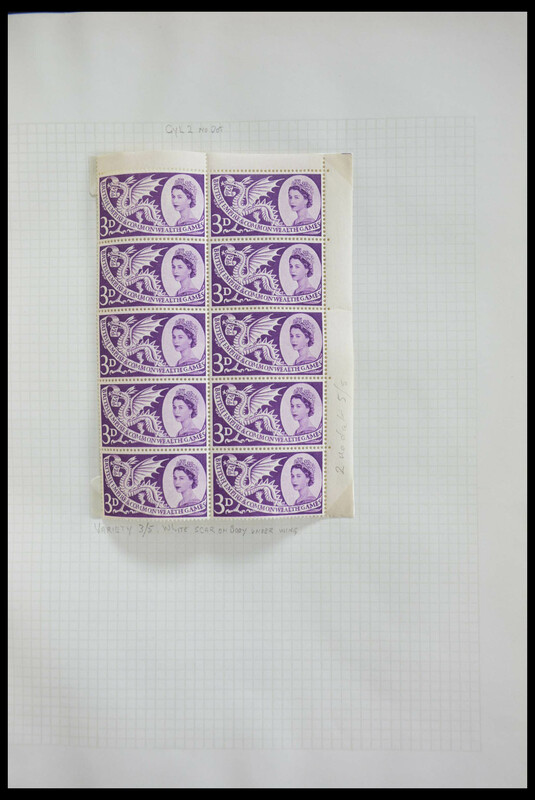 postal stationery registered envelopes), lovely frankings and interesting postmarks etc. 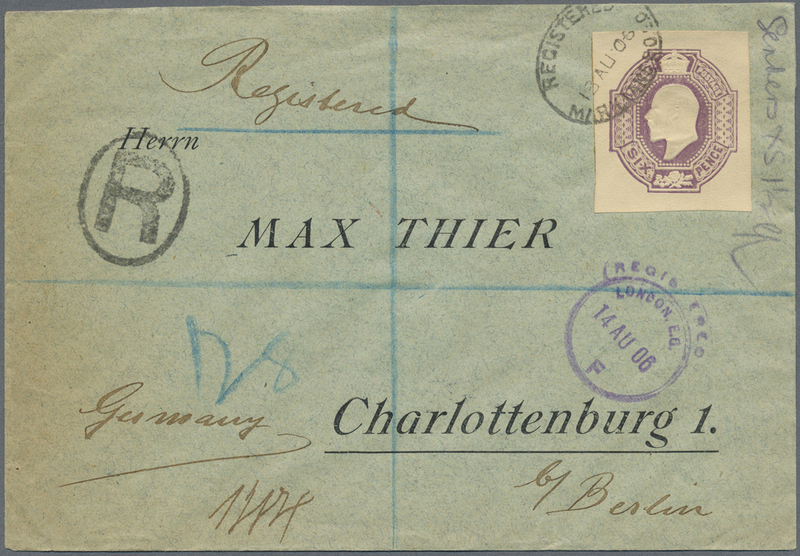 34974 Brief (cover) Ganzsache (Complete) 1905/1914. 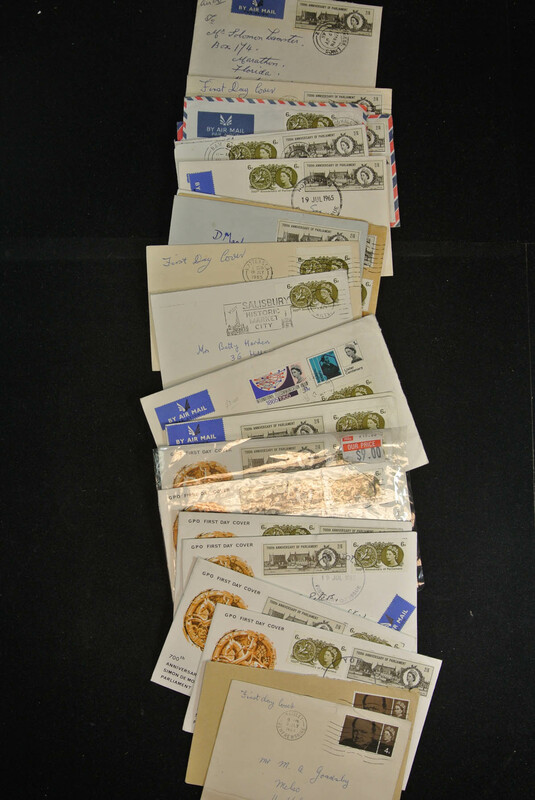 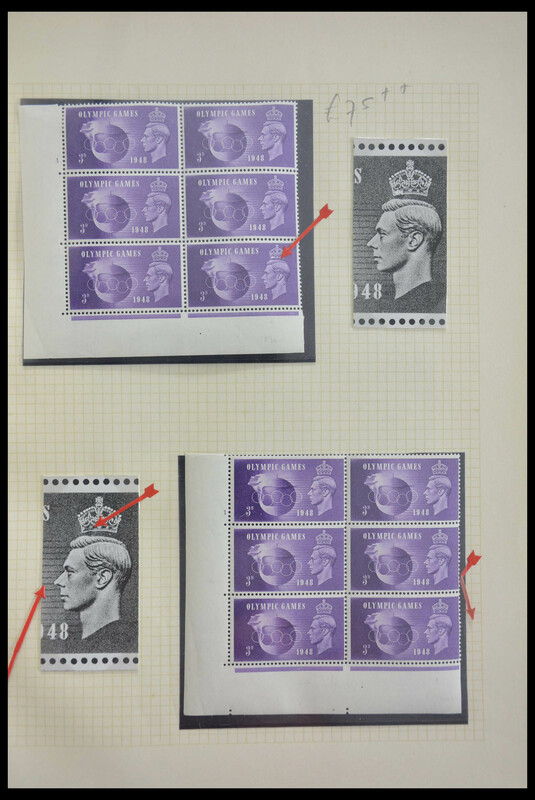 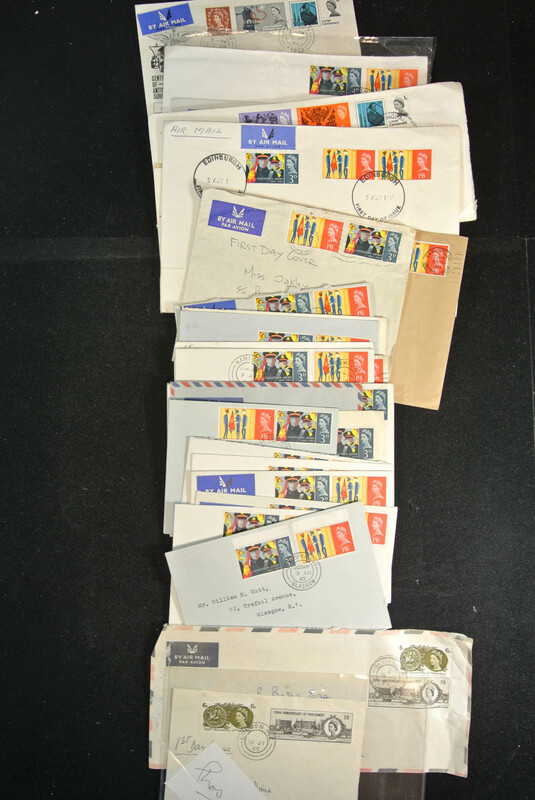 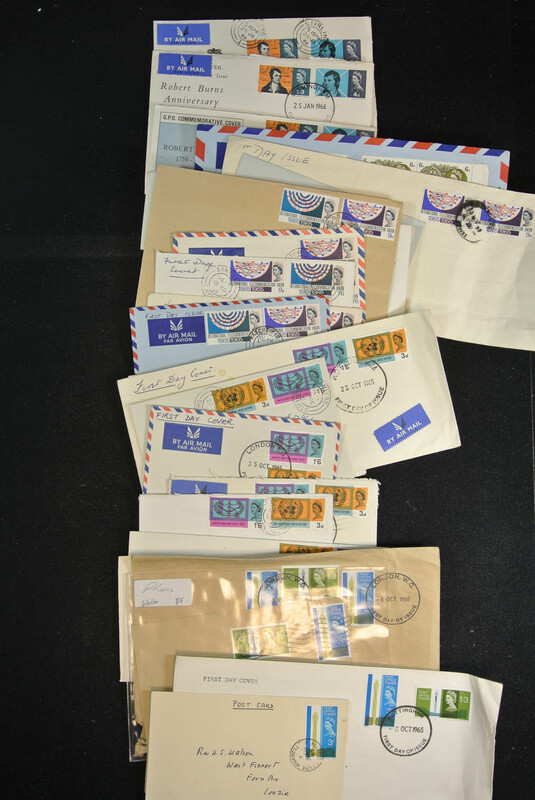 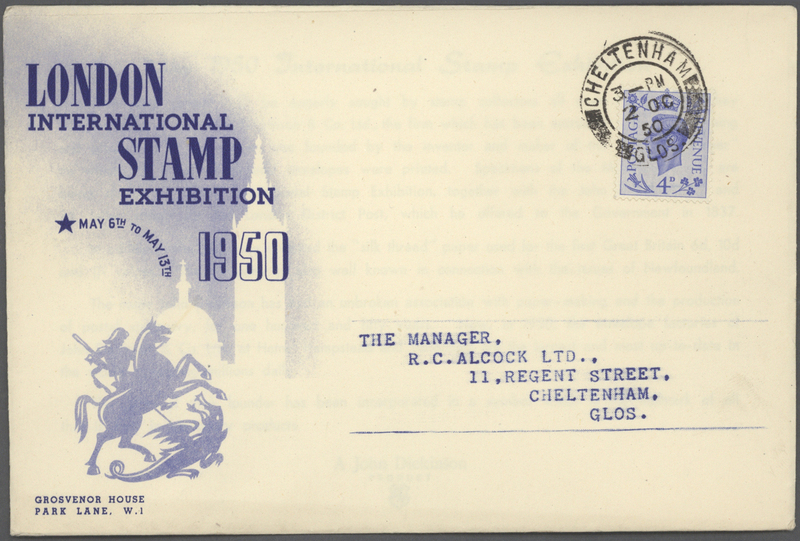 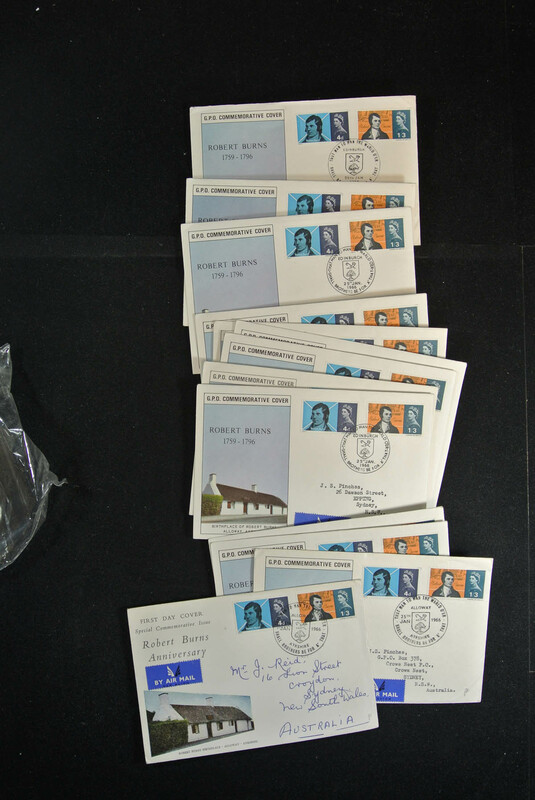 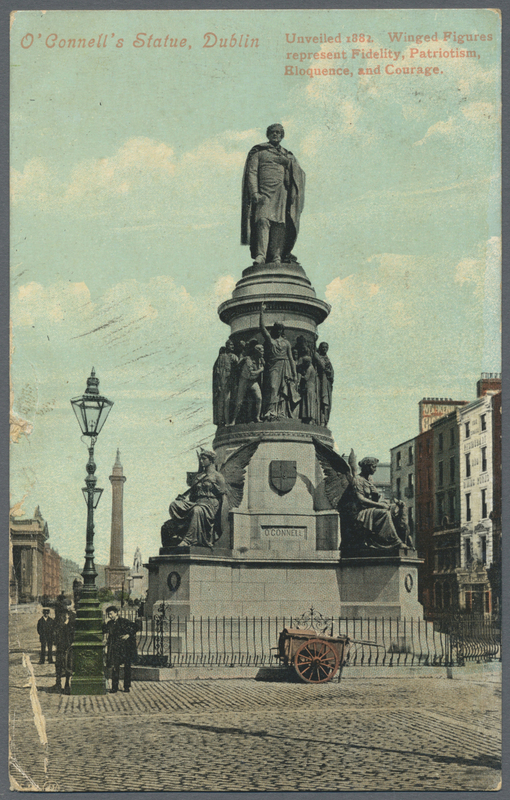 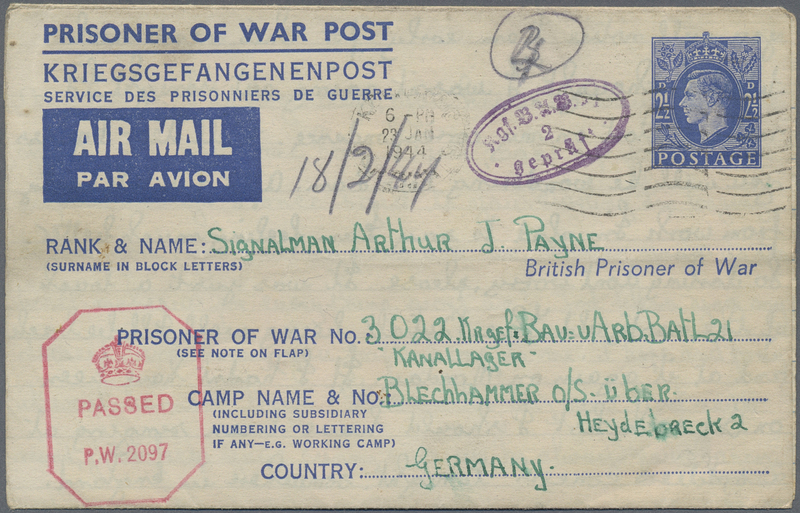 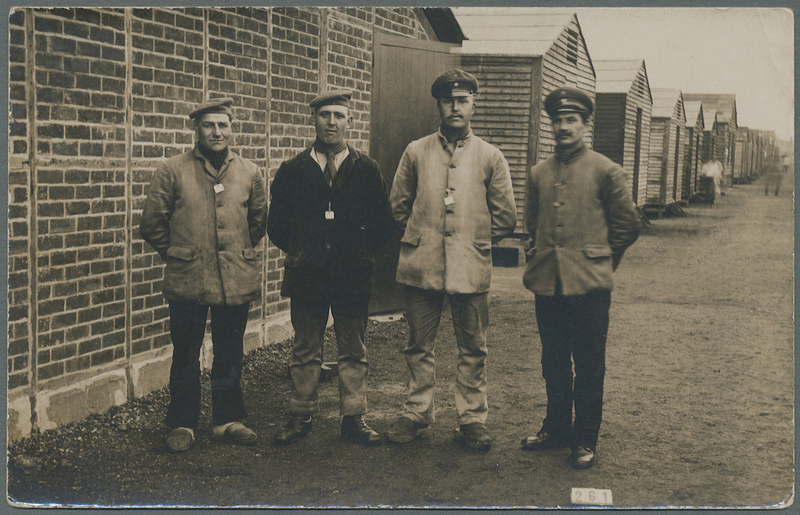 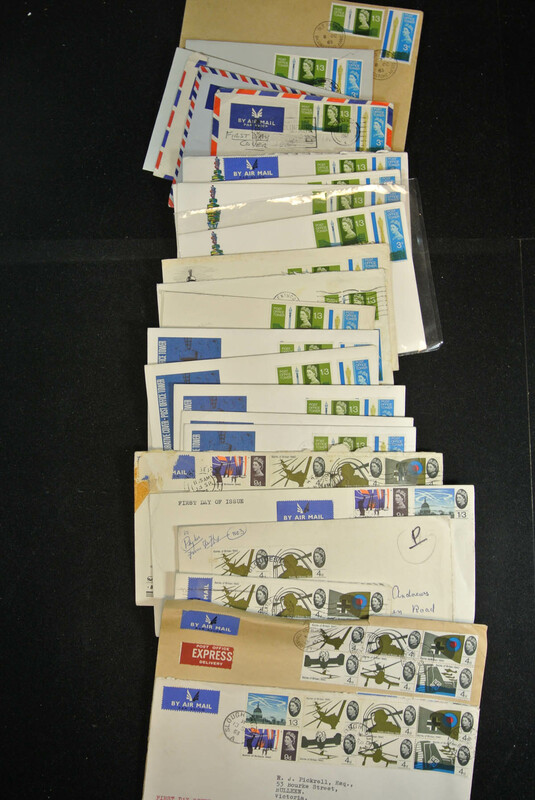 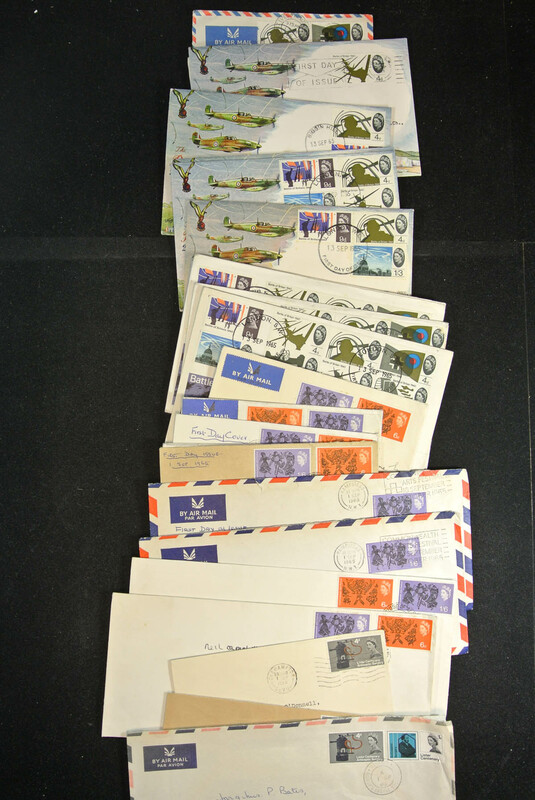 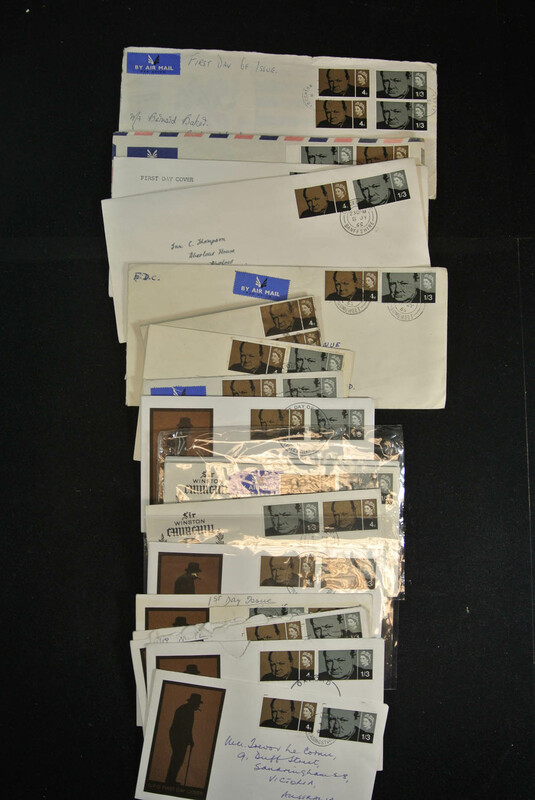 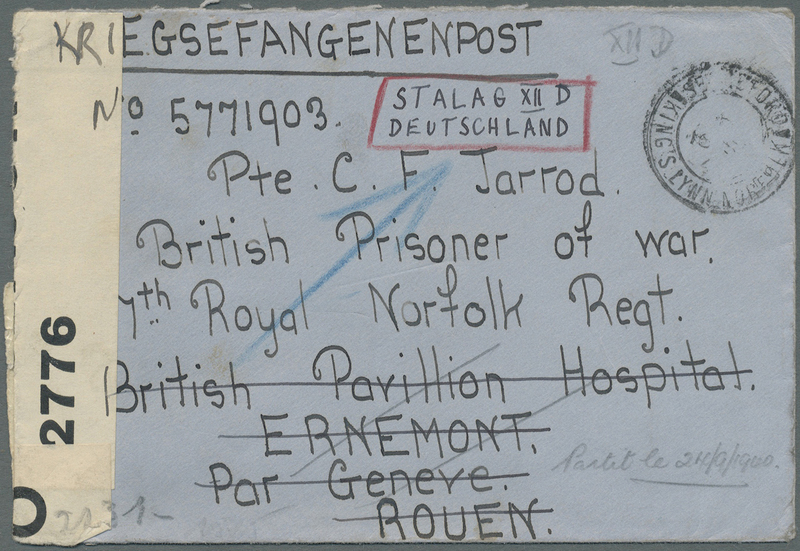 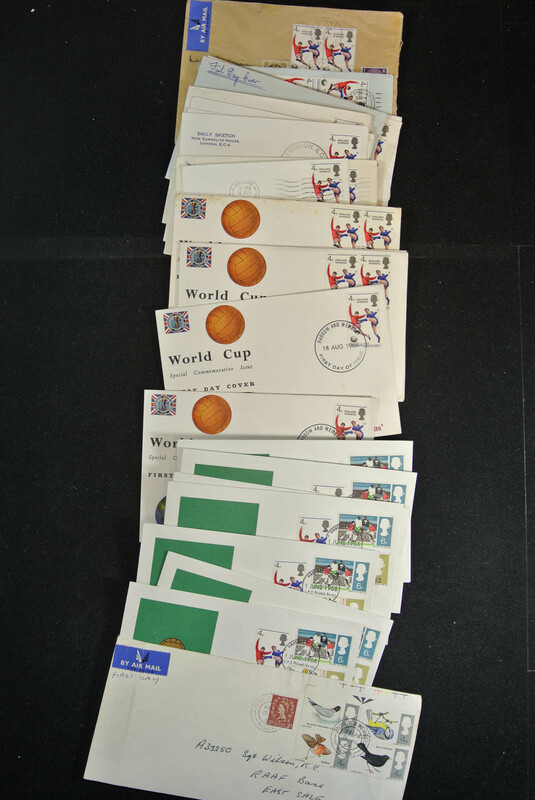 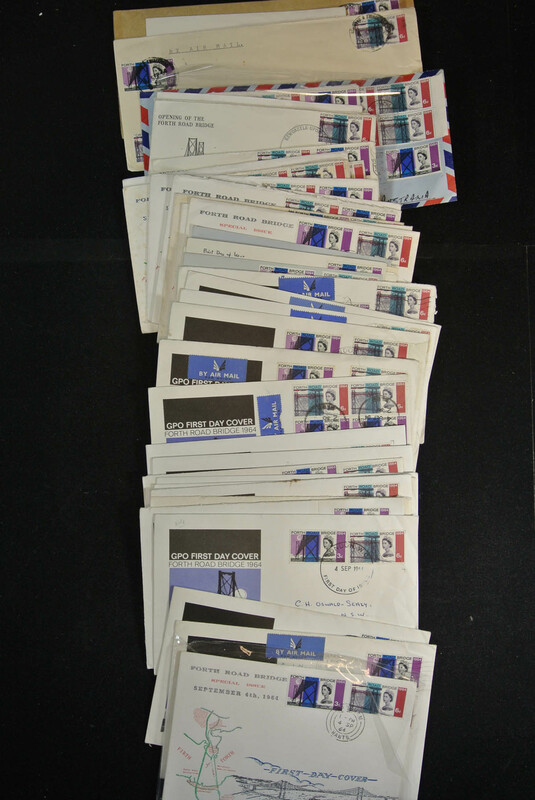 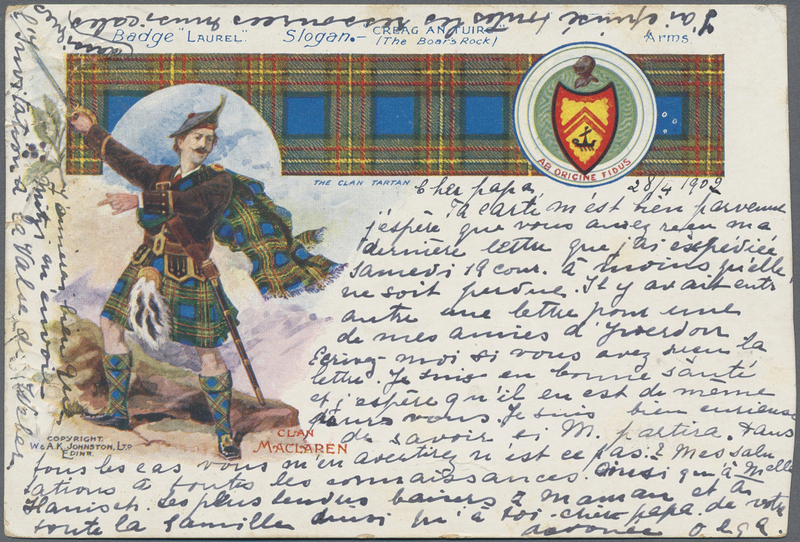 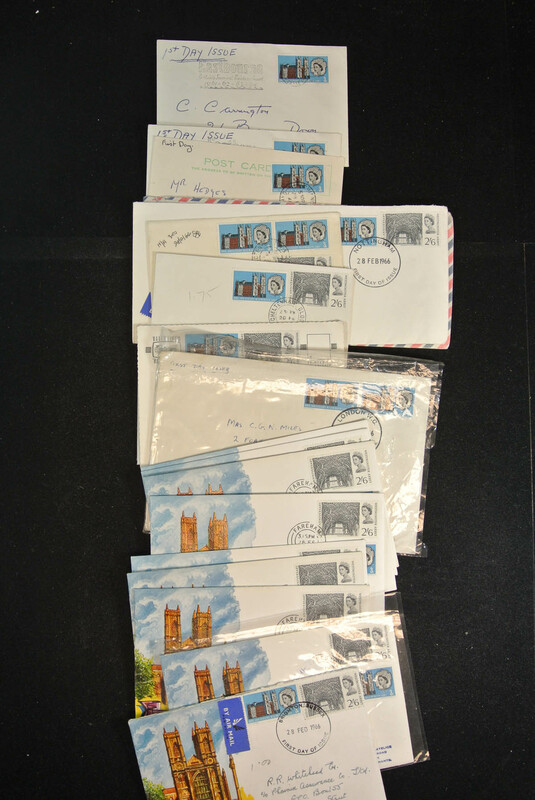 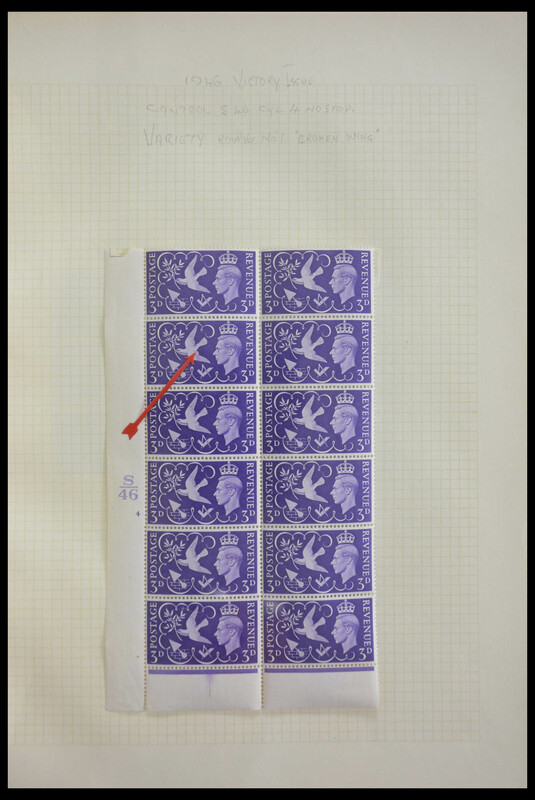 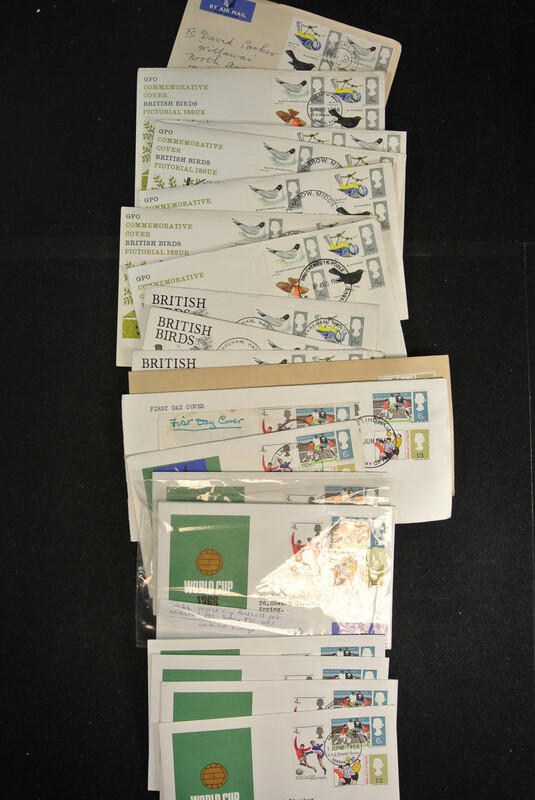 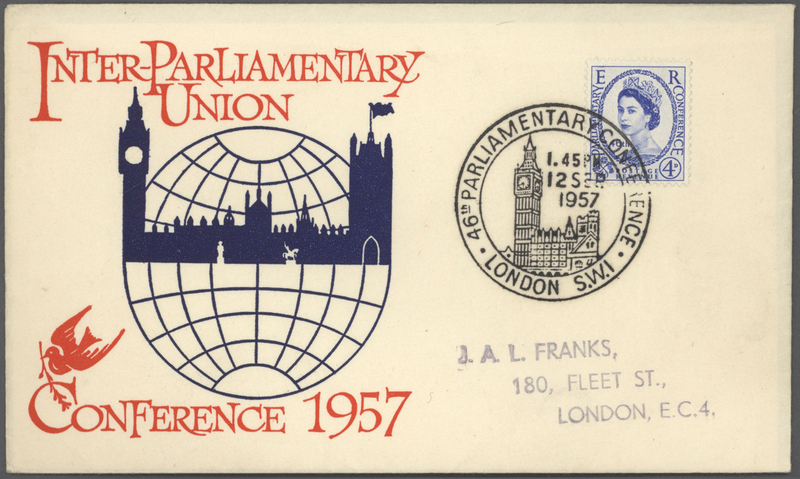 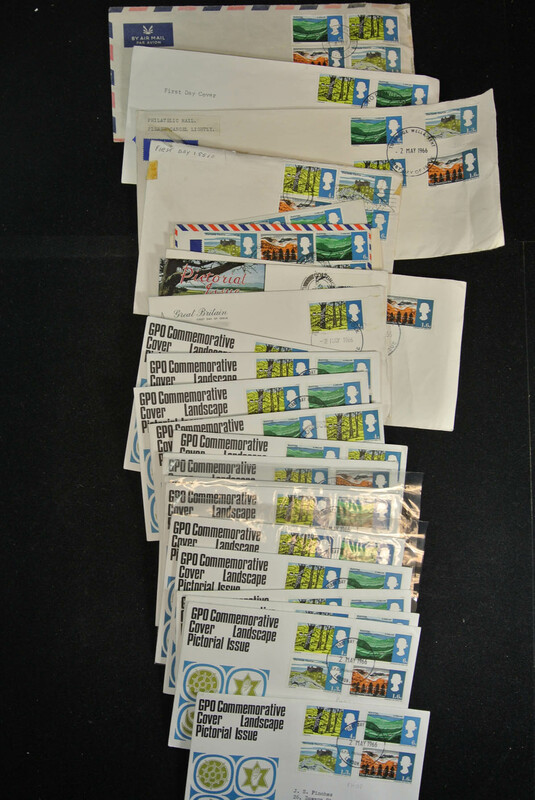 Interesting collection containing 30 registered letters, but one, each franked with stamps and ENTIRE CUT-OUTS. 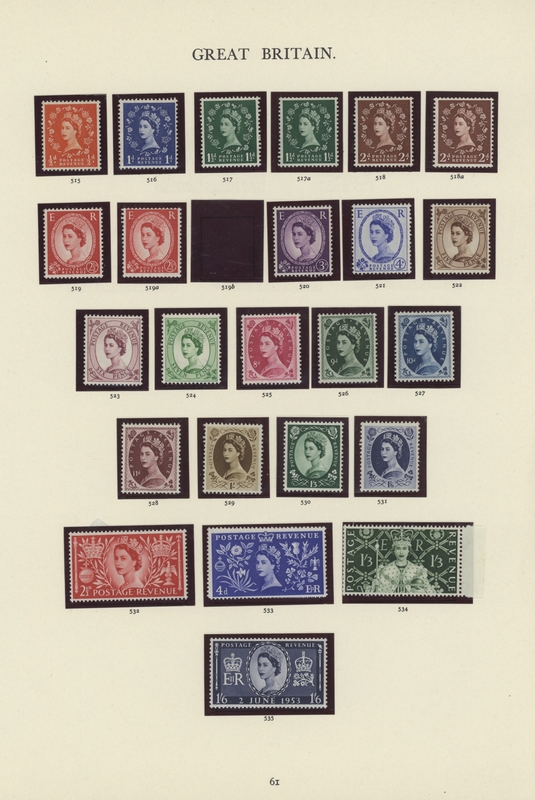 Wide range of varieties. 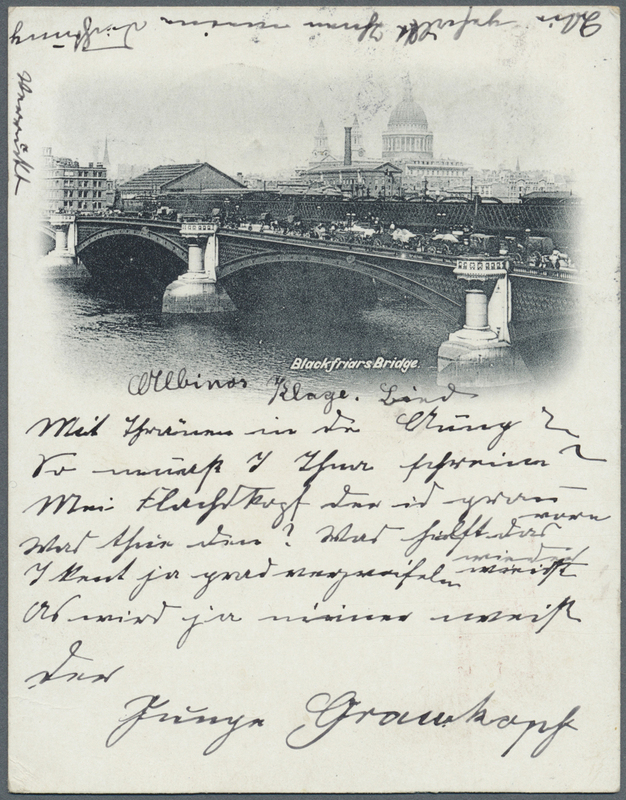 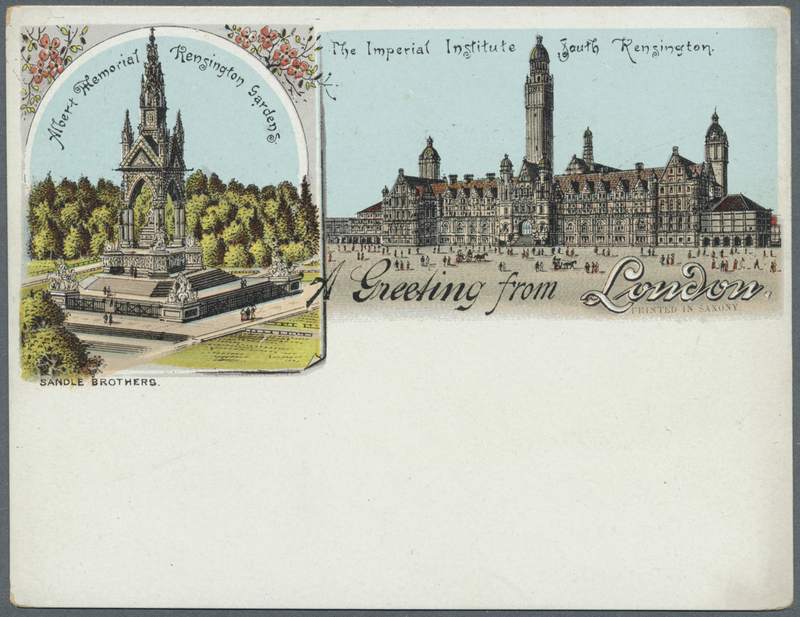 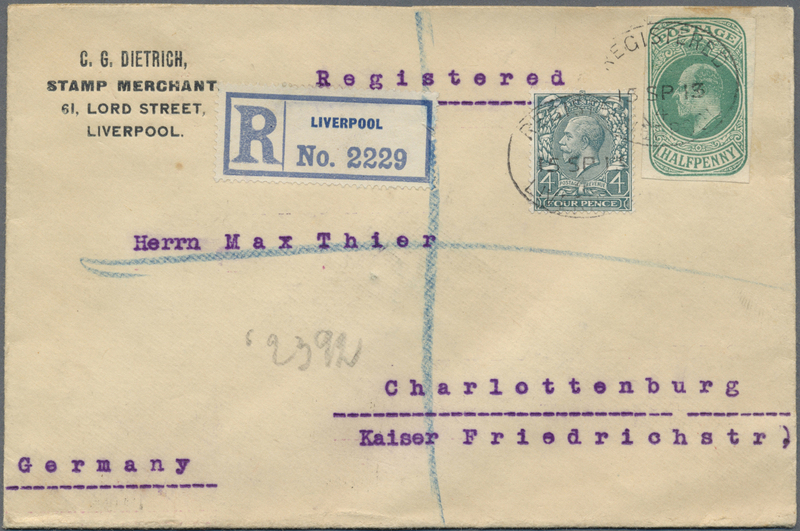 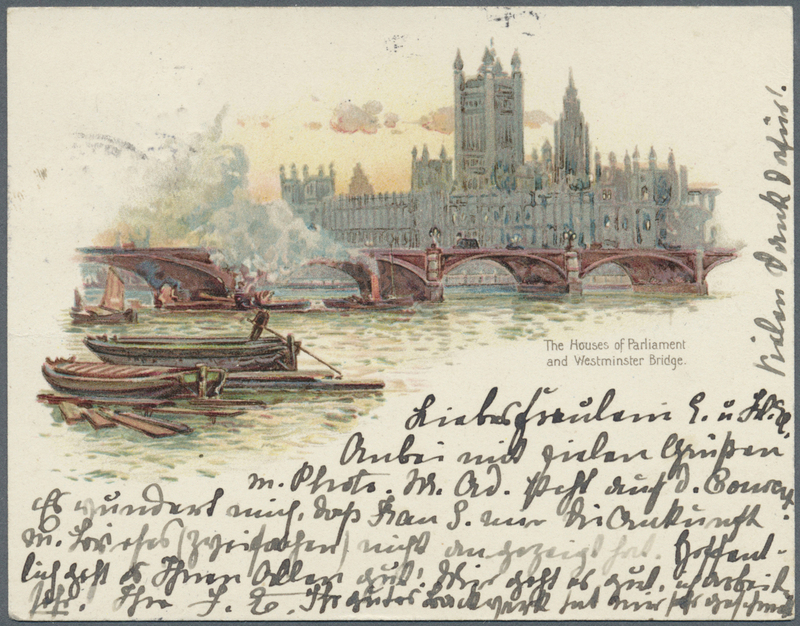 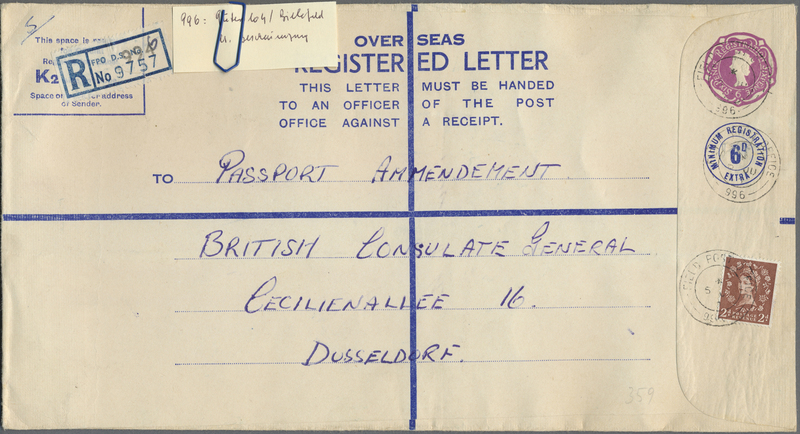 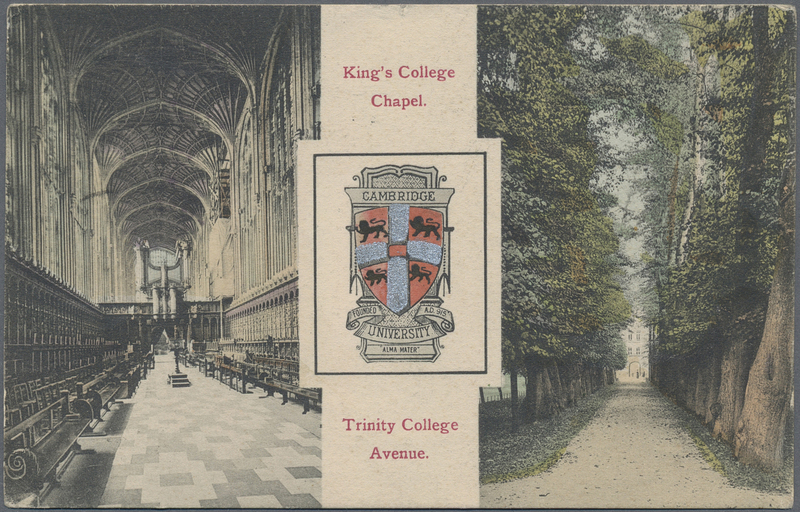 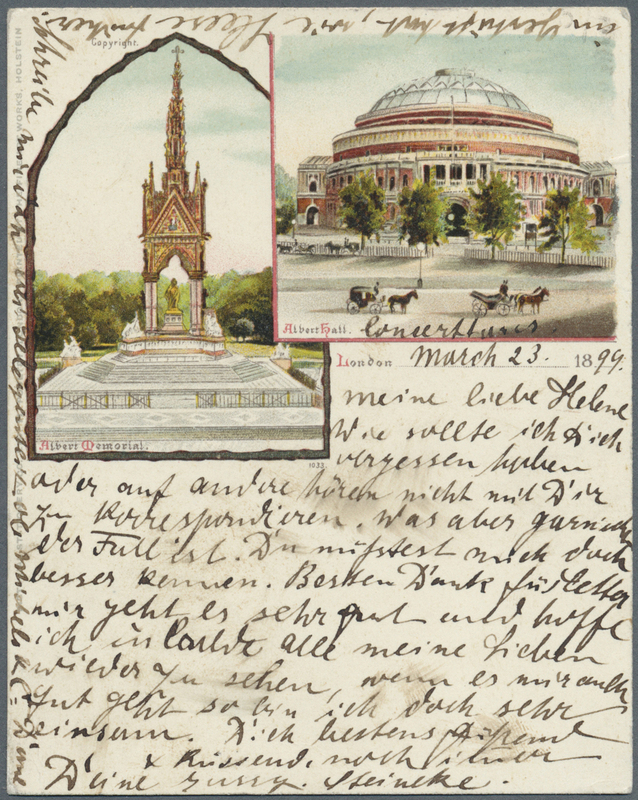 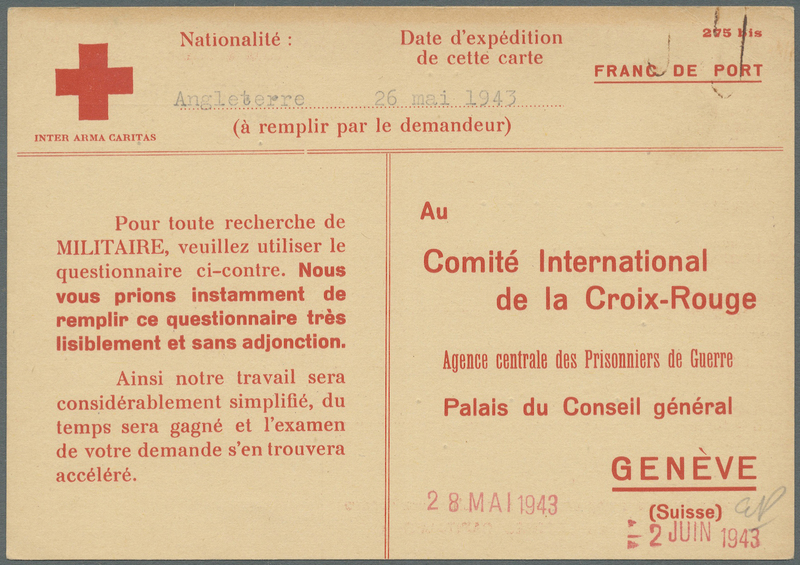 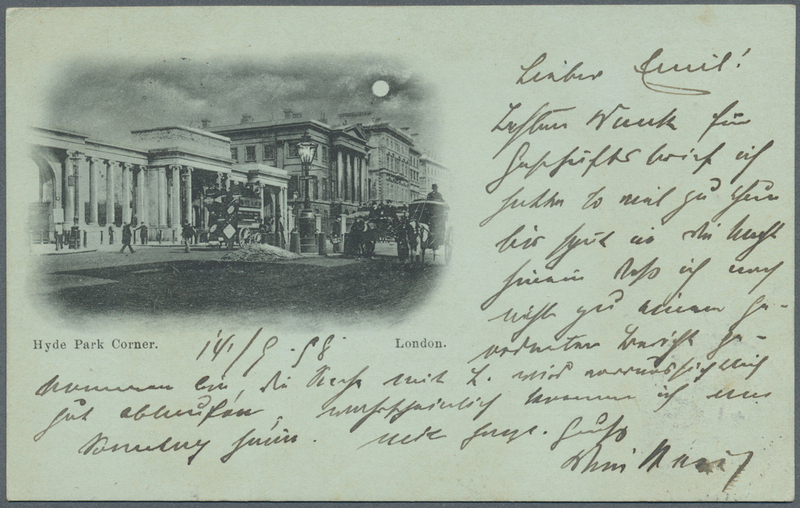 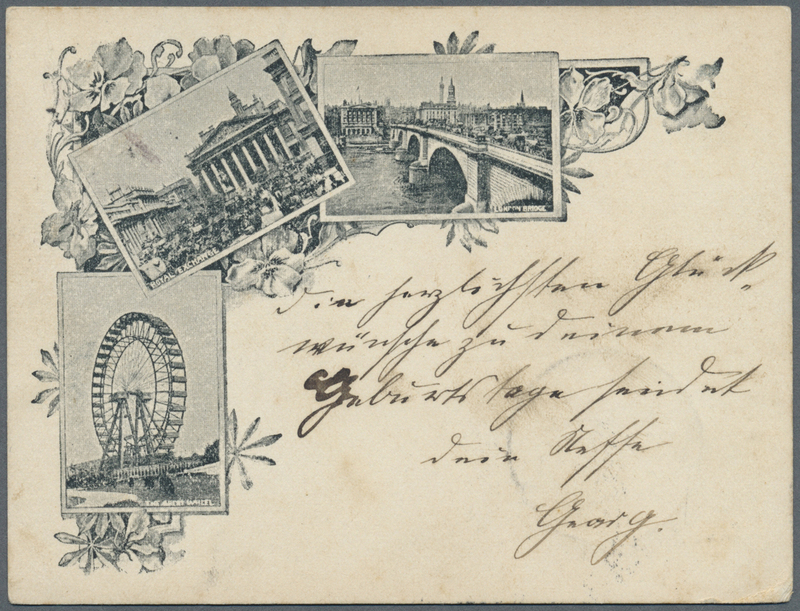 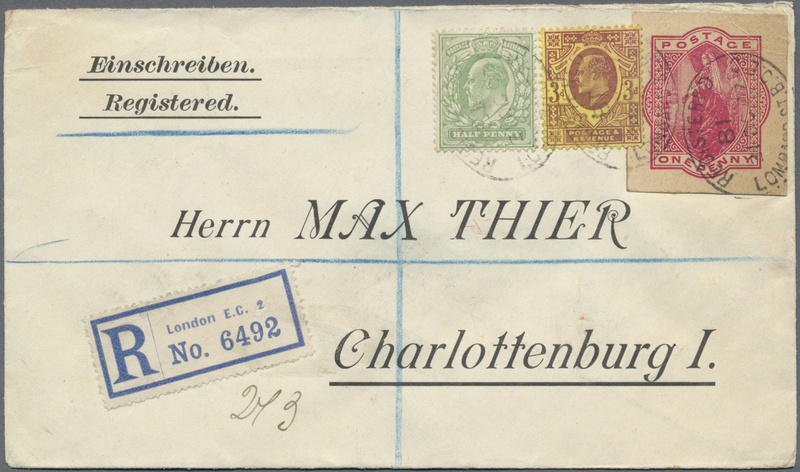 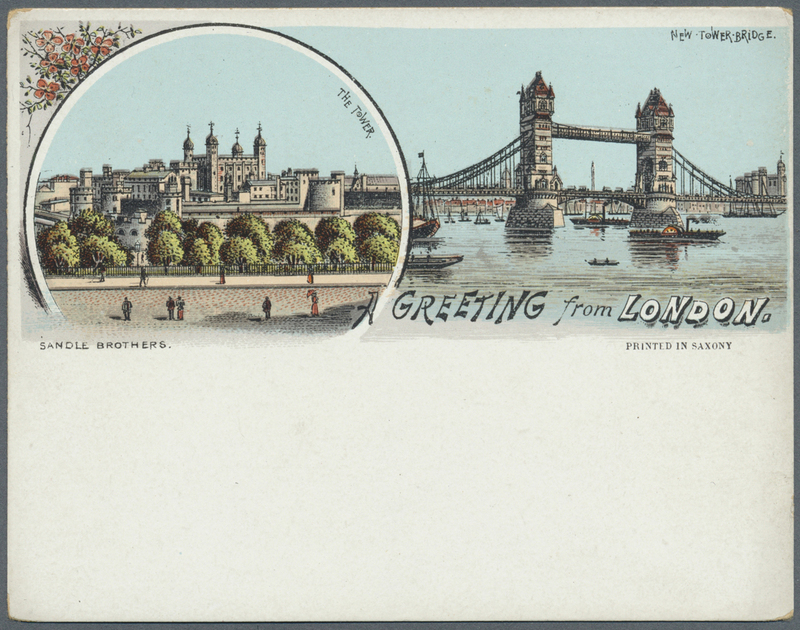 From various places in England to a specific address in Berlin-Charlottenburg. 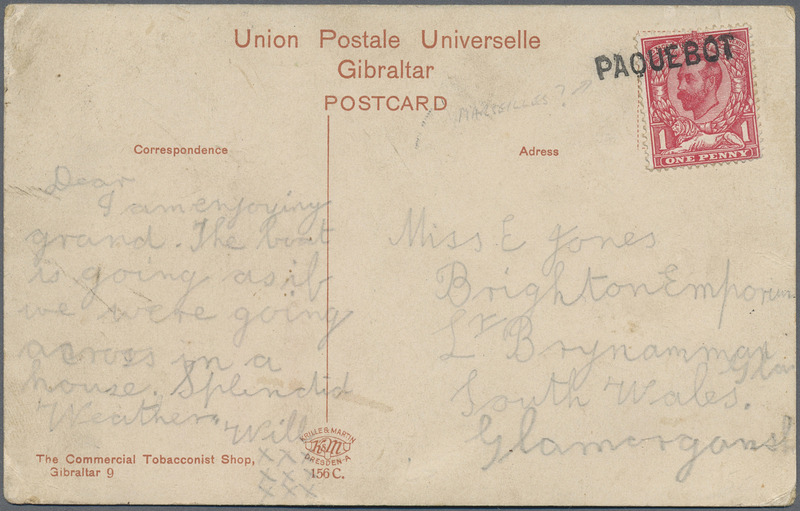 Conditions somewhat different. 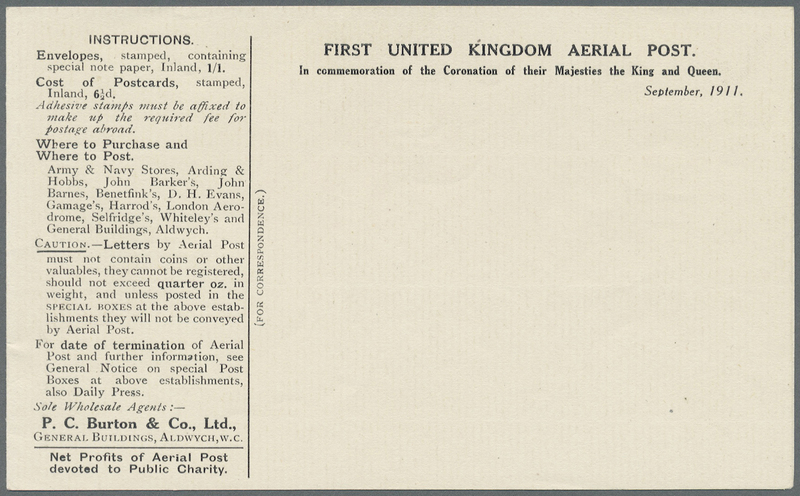 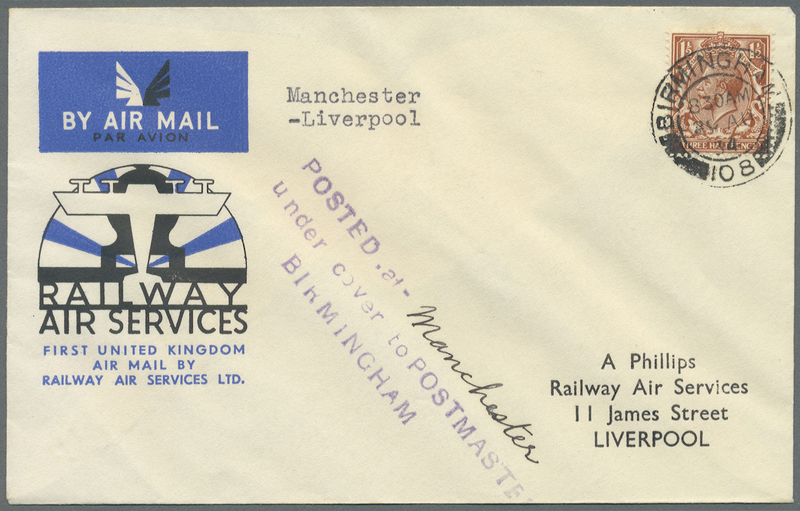 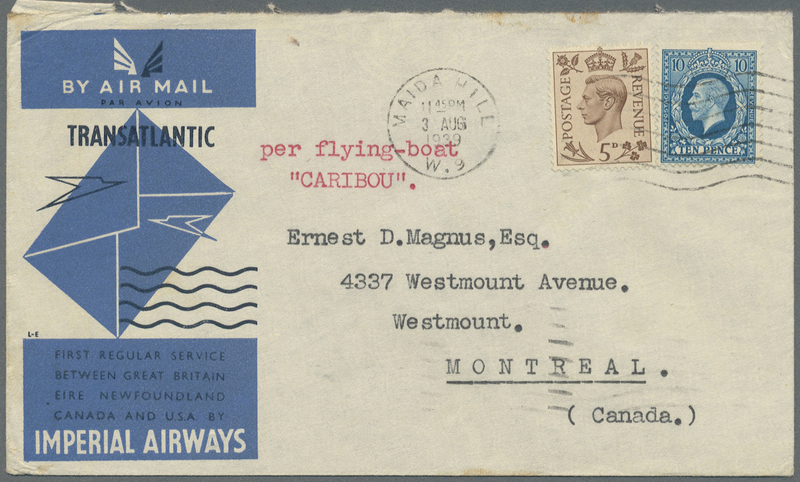 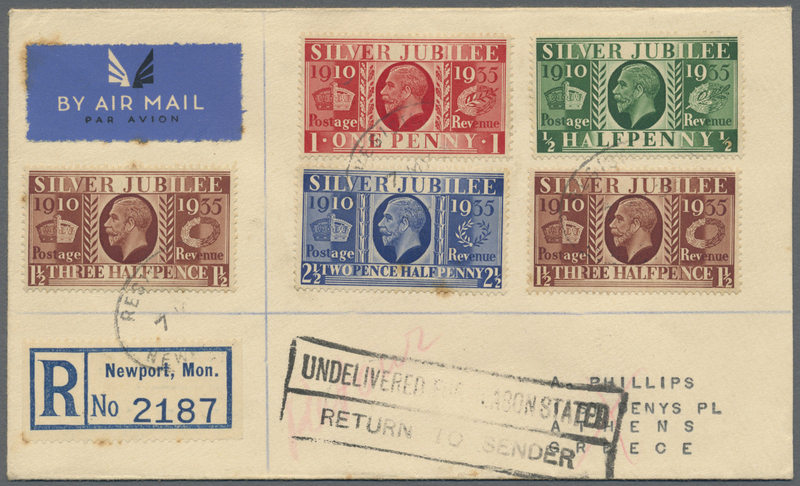 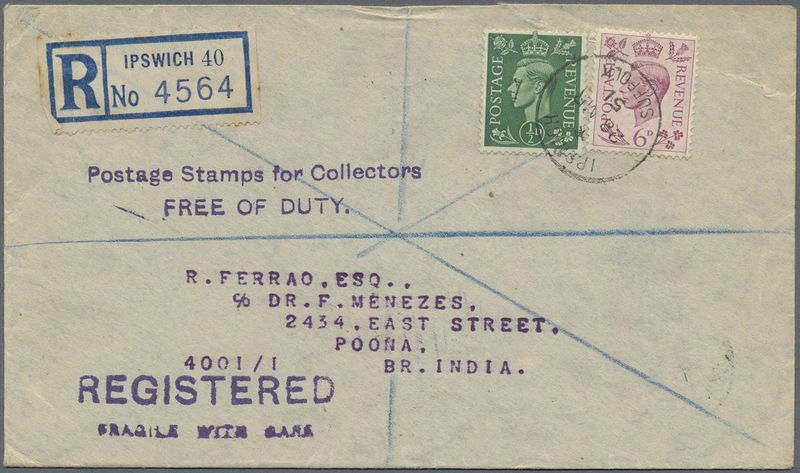 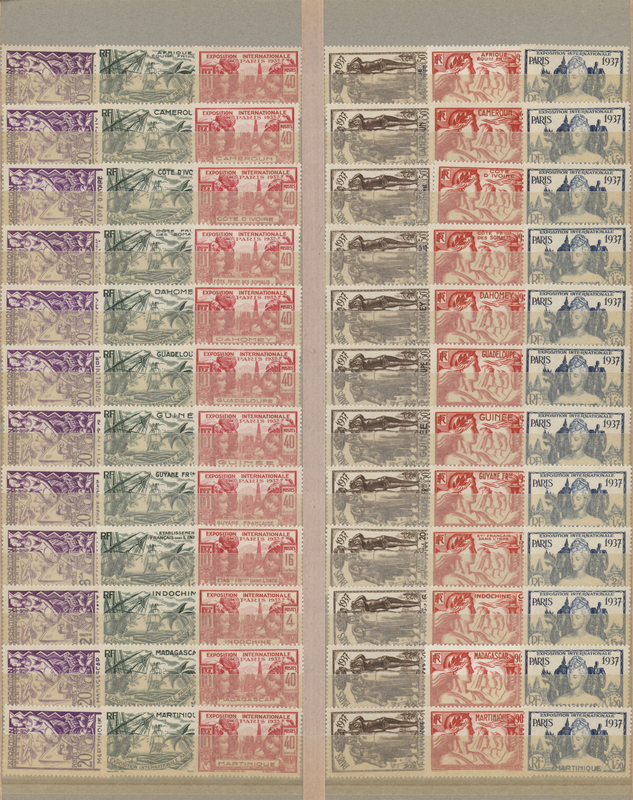 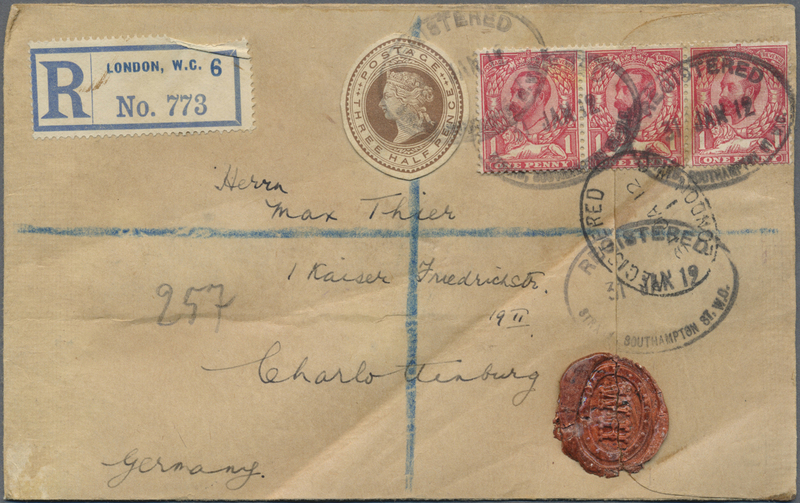 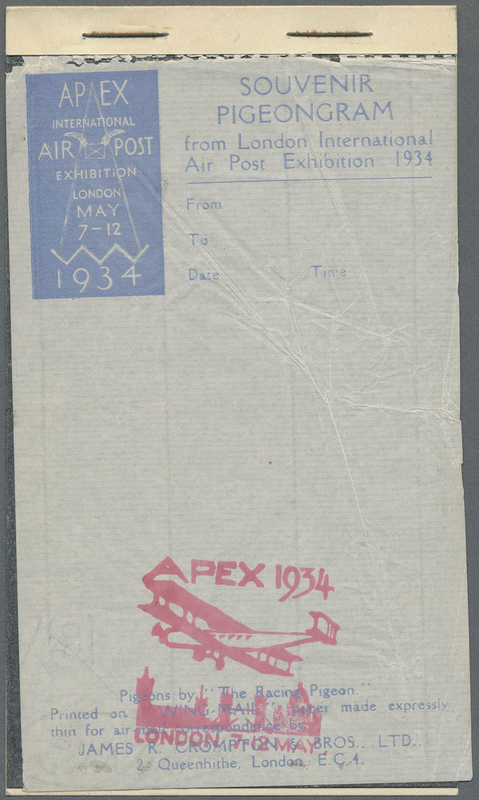 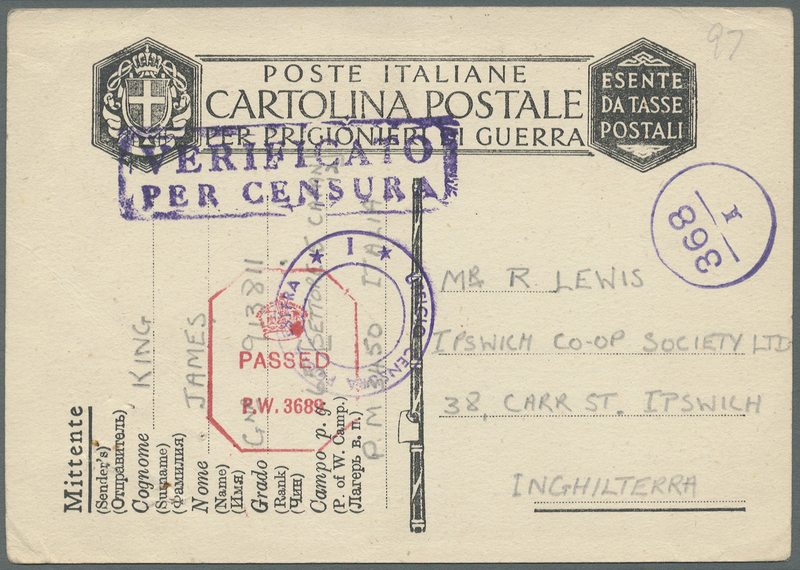 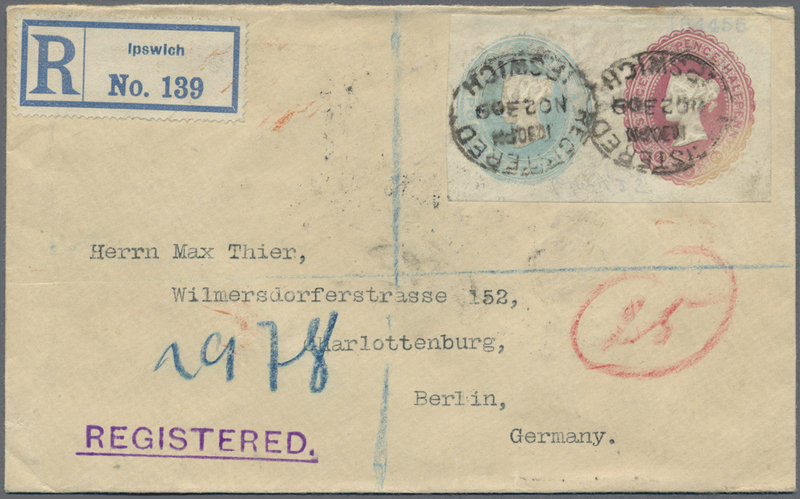 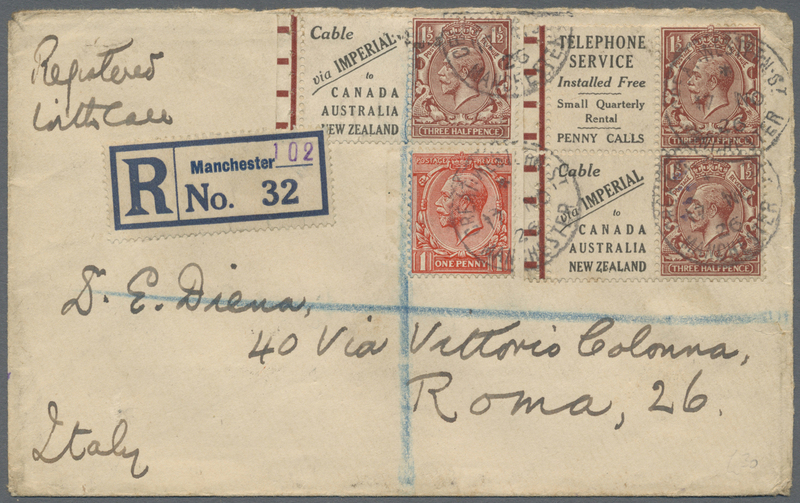 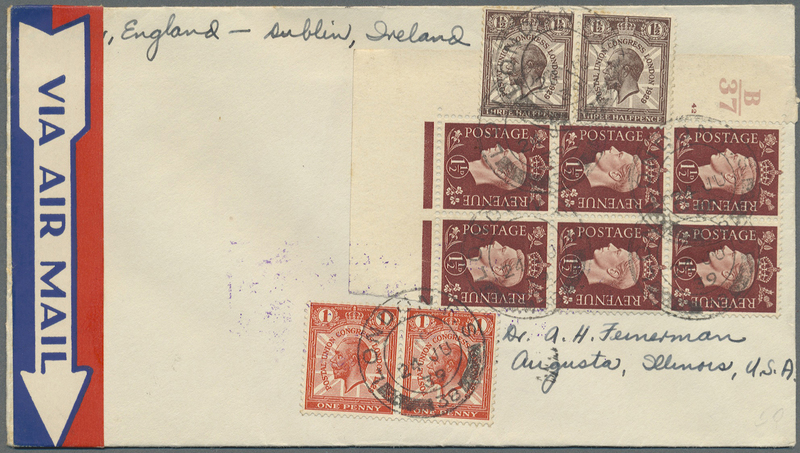 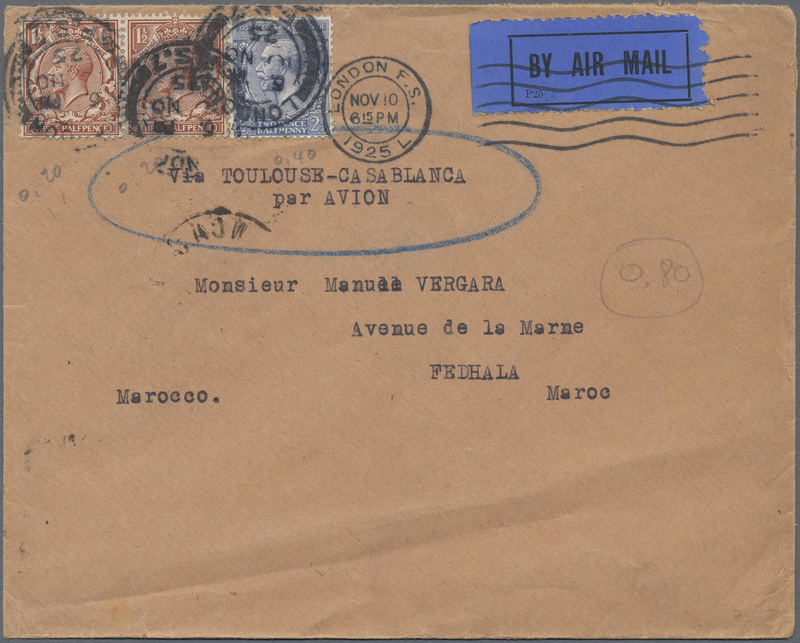 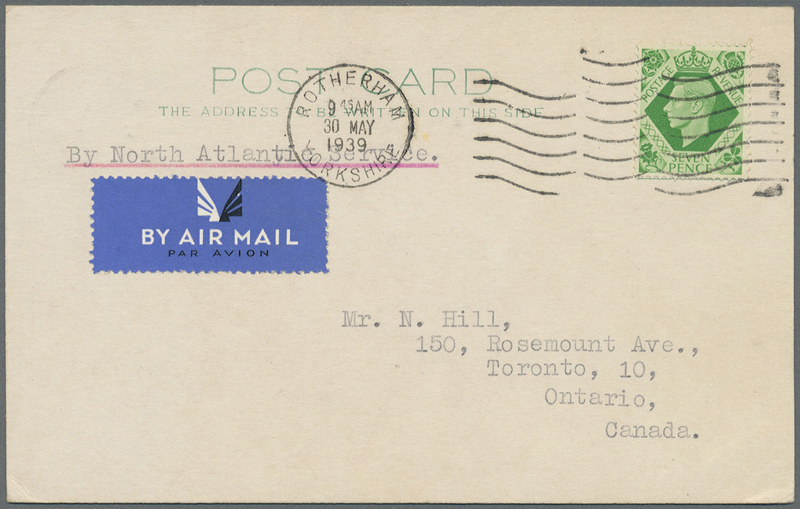 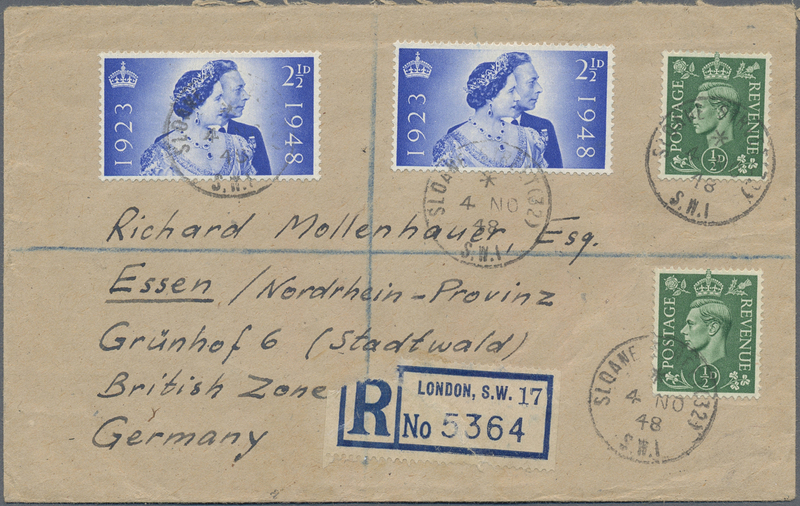 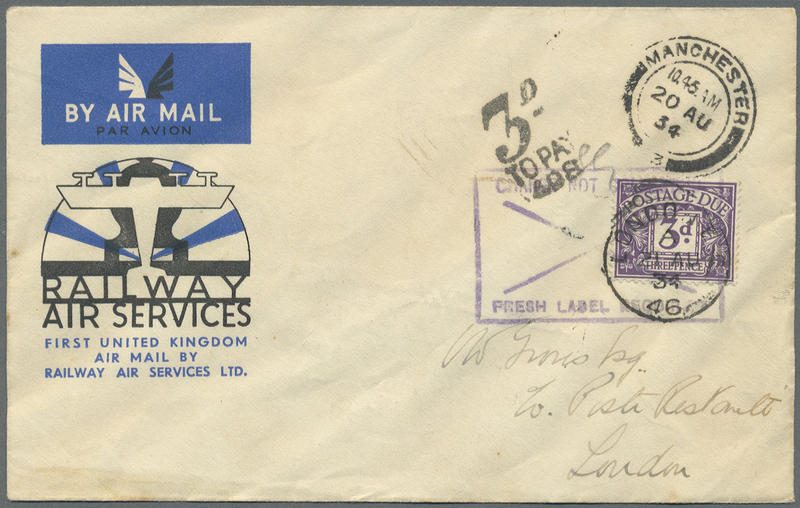 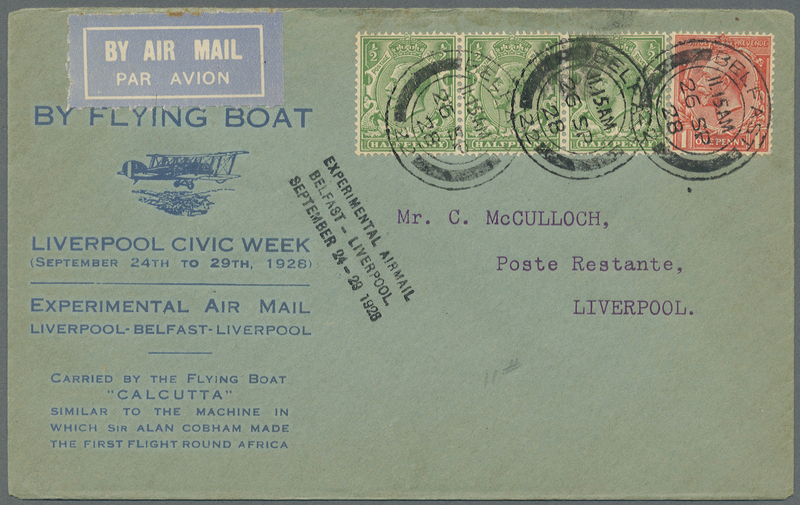 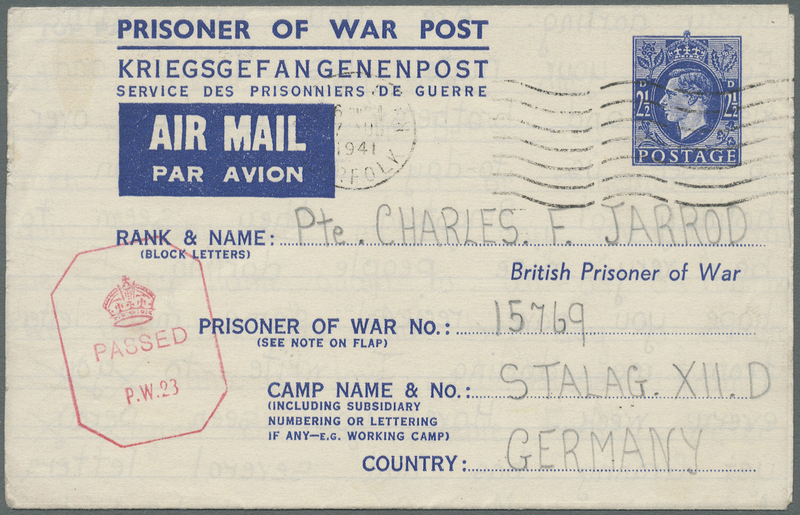 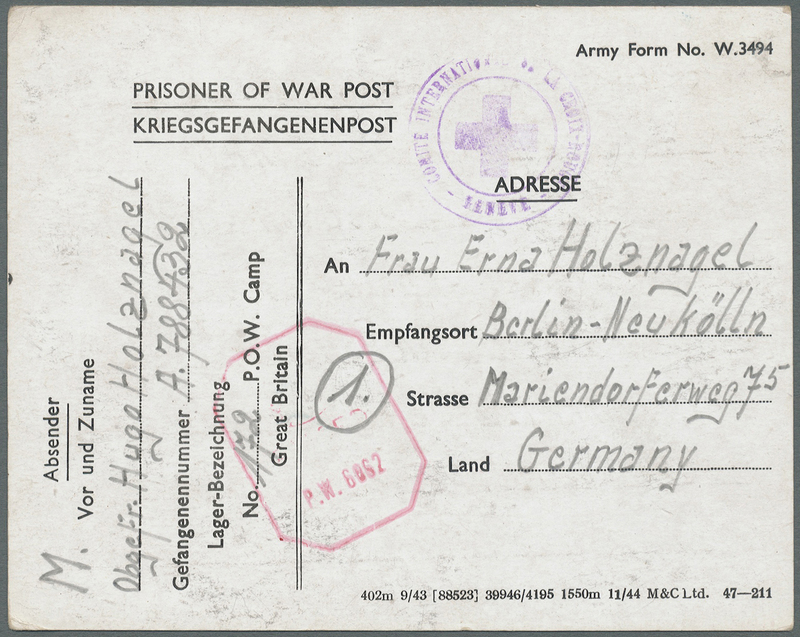 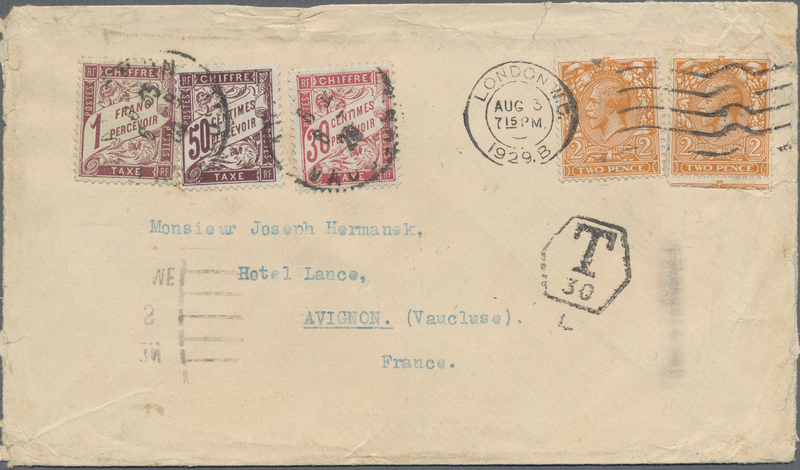 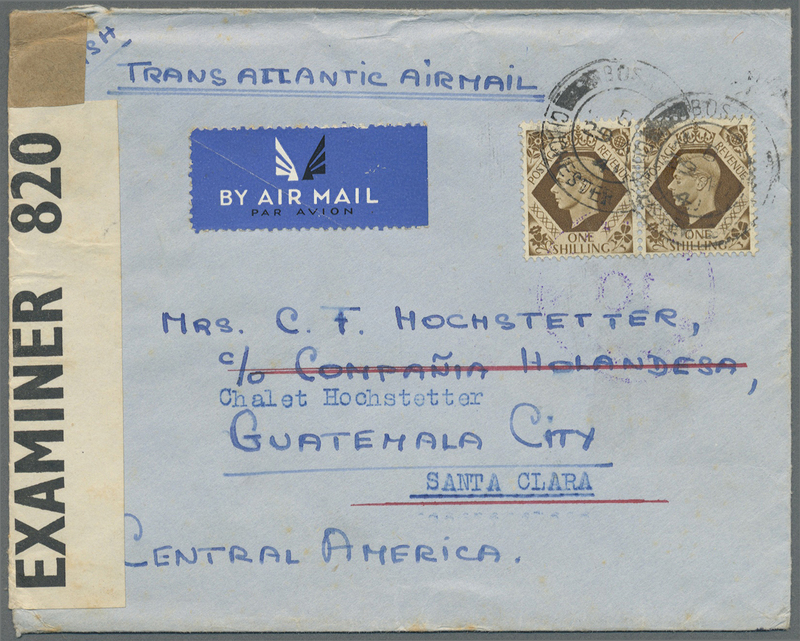 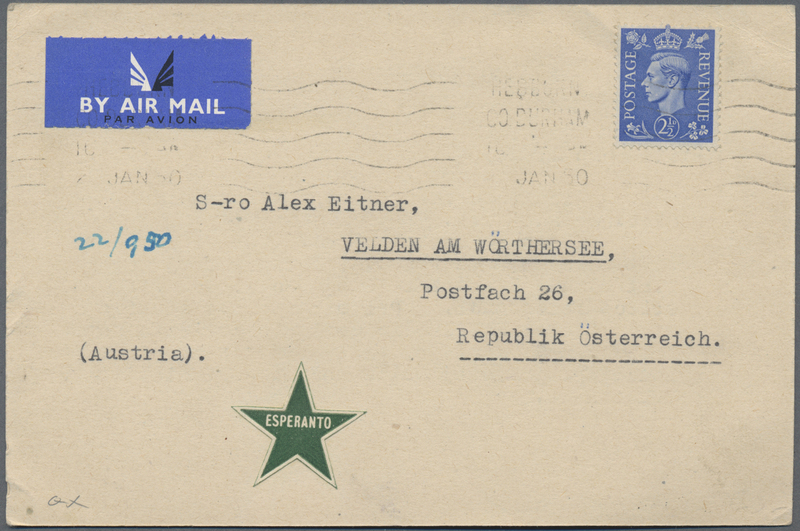 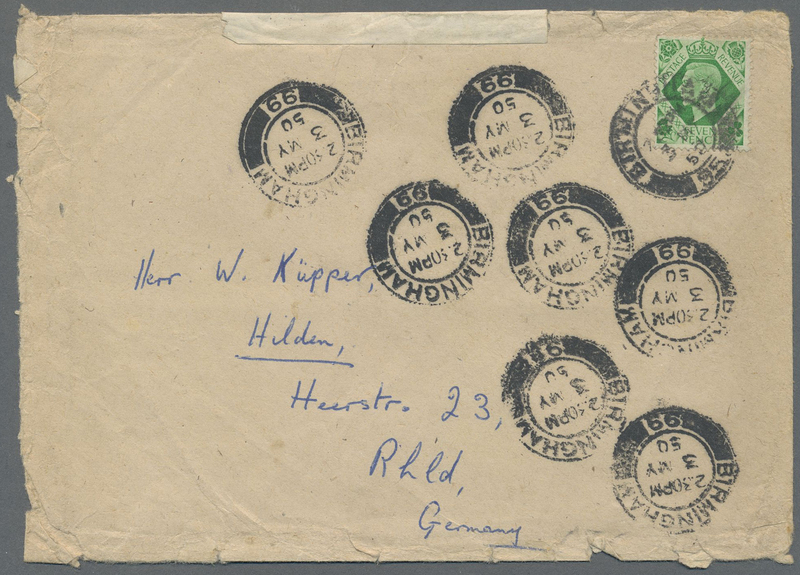 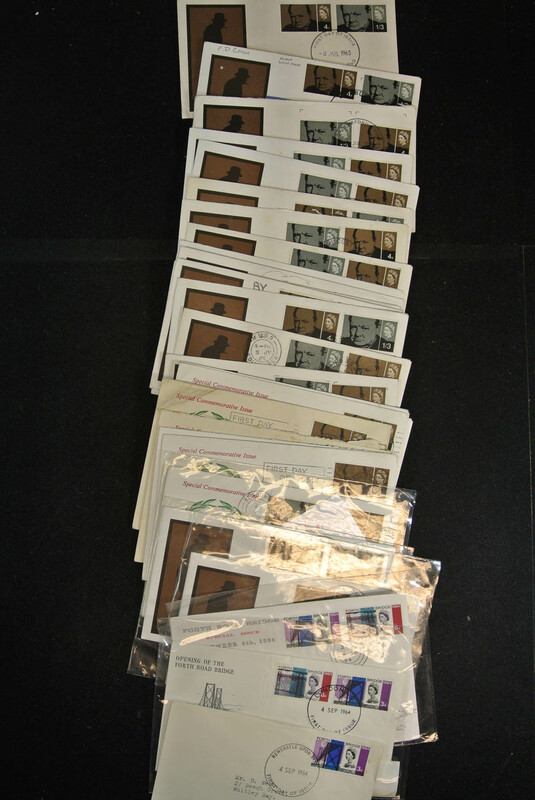 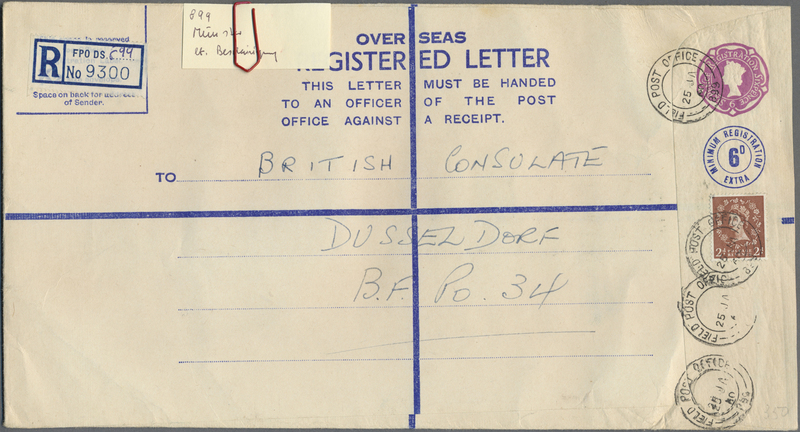 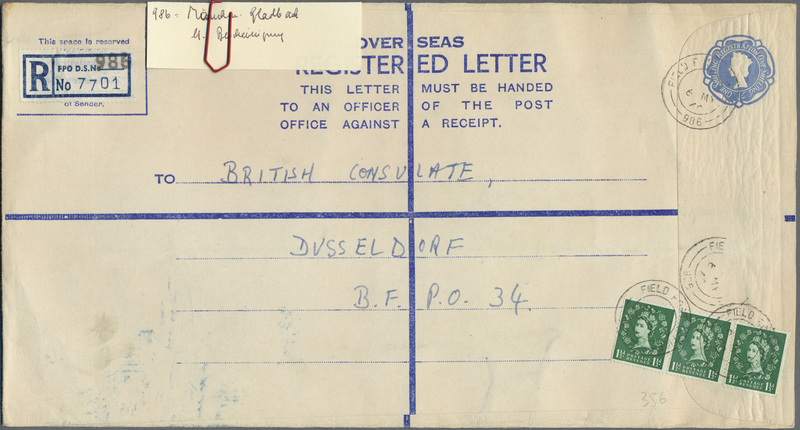 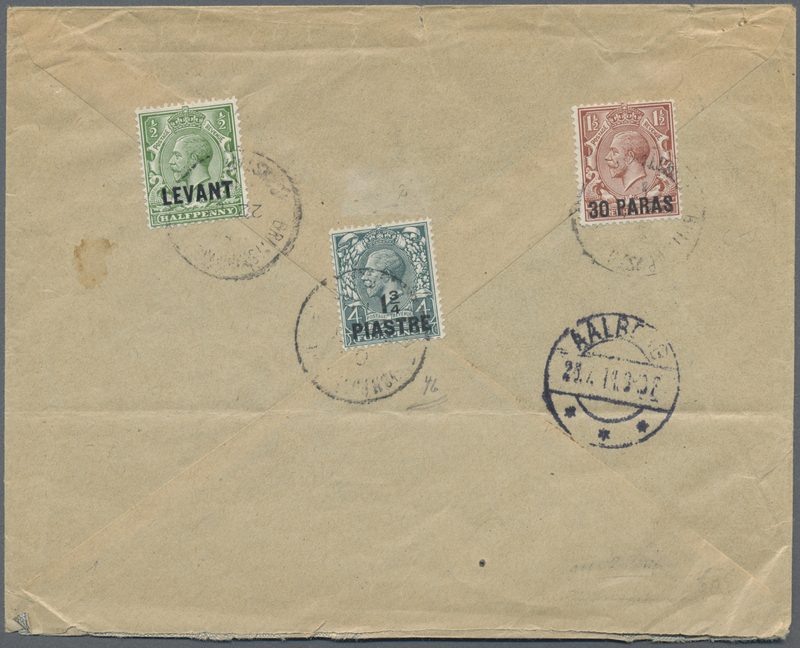 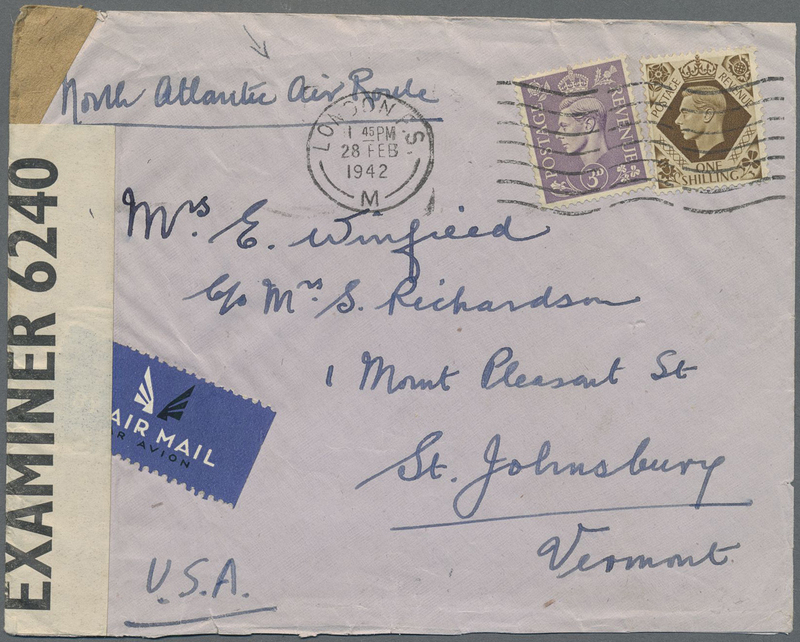 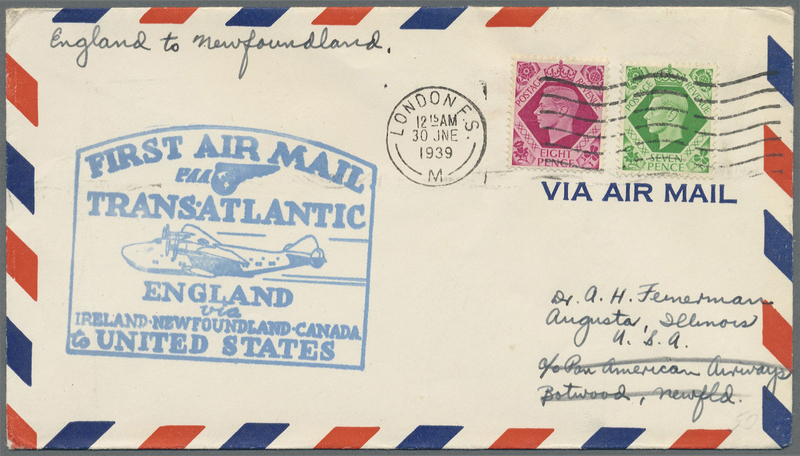 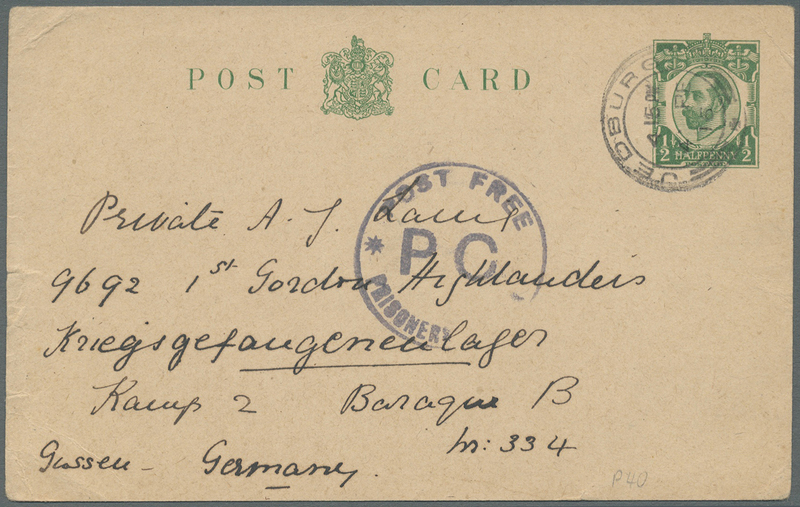 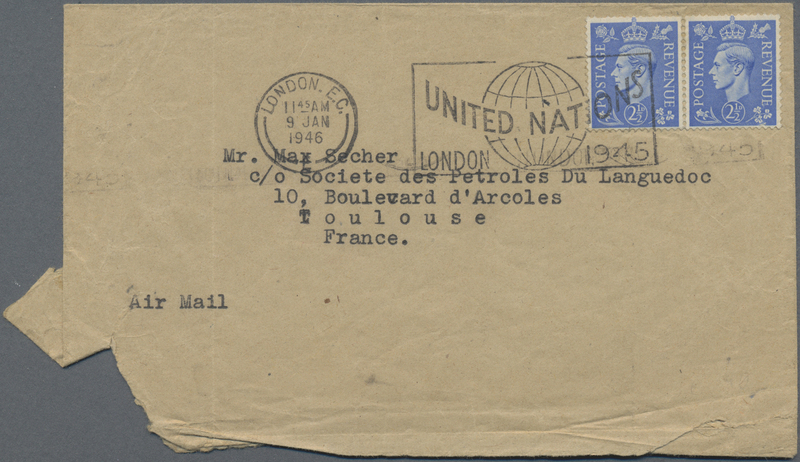 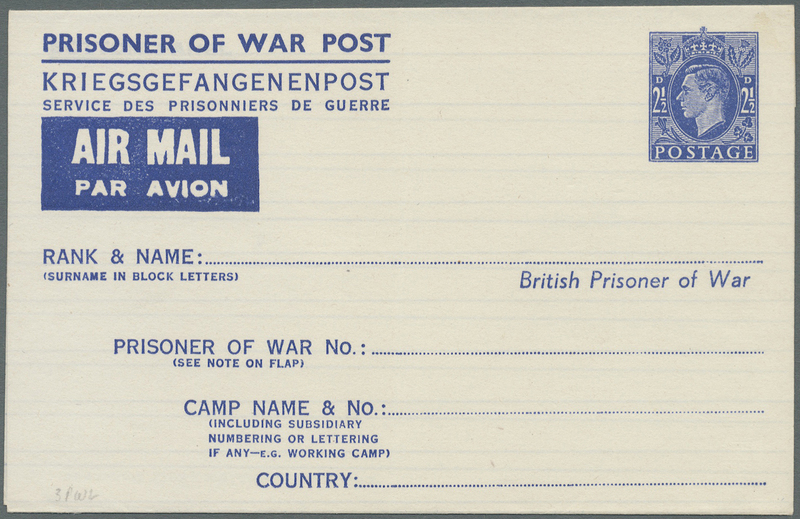 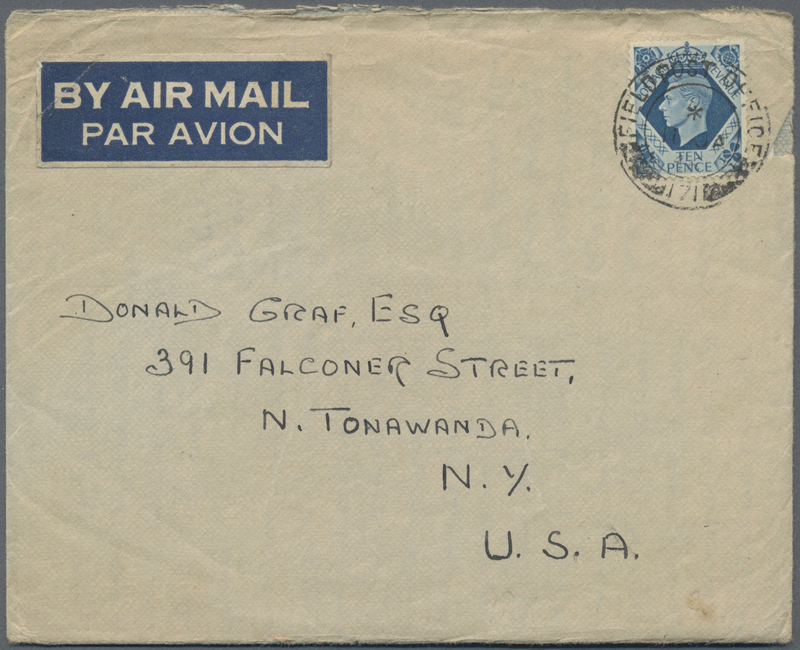 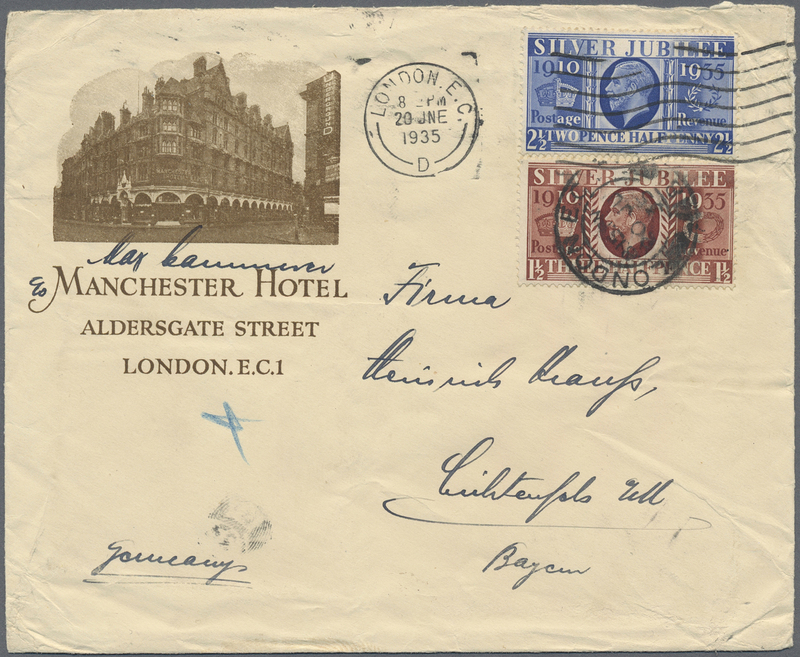 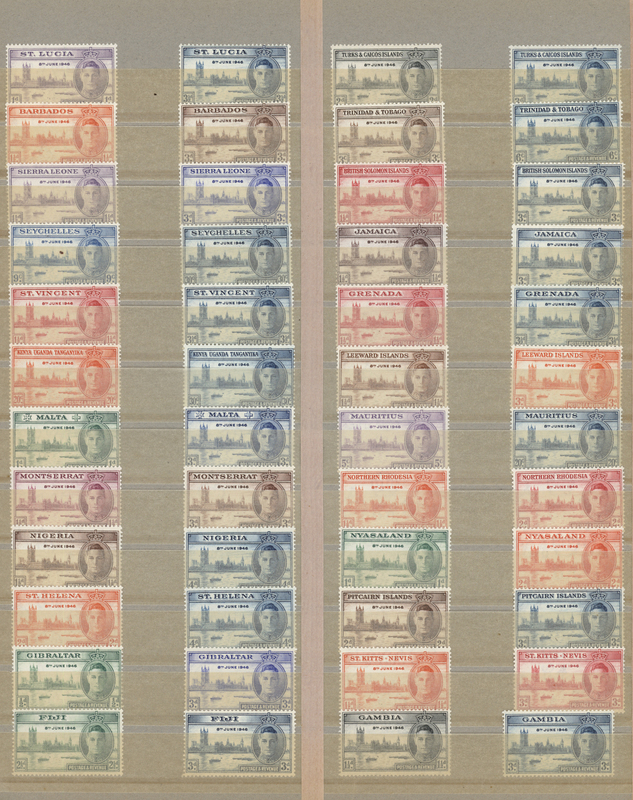 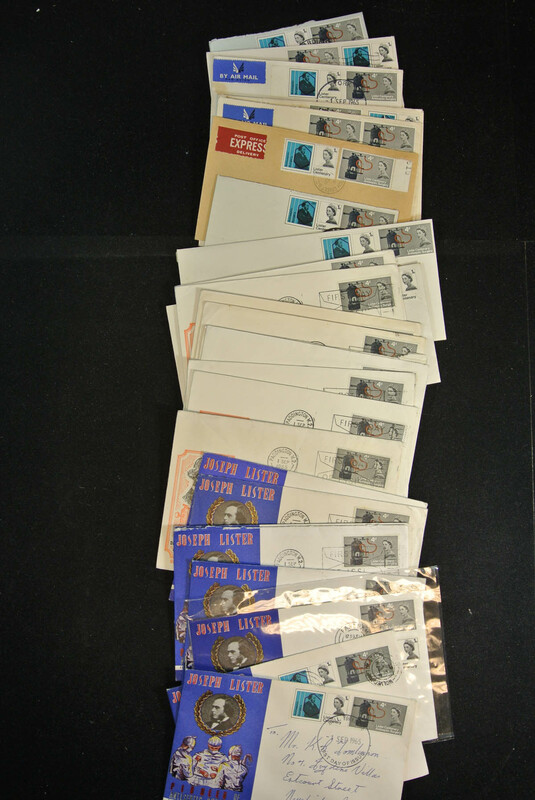 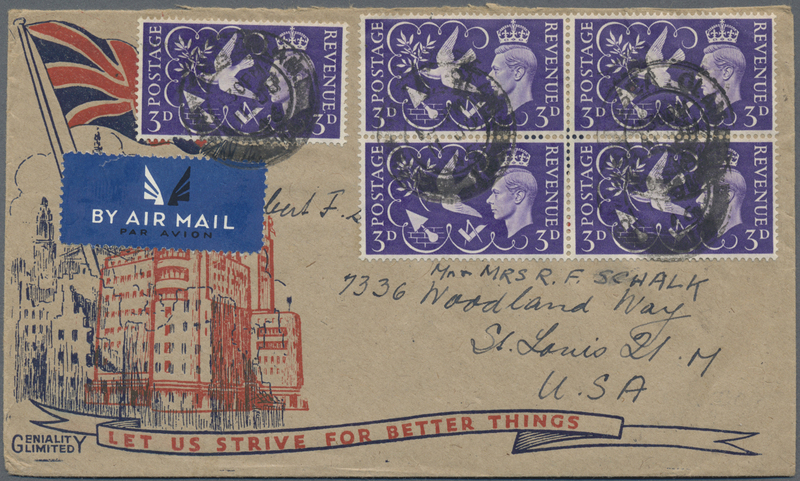 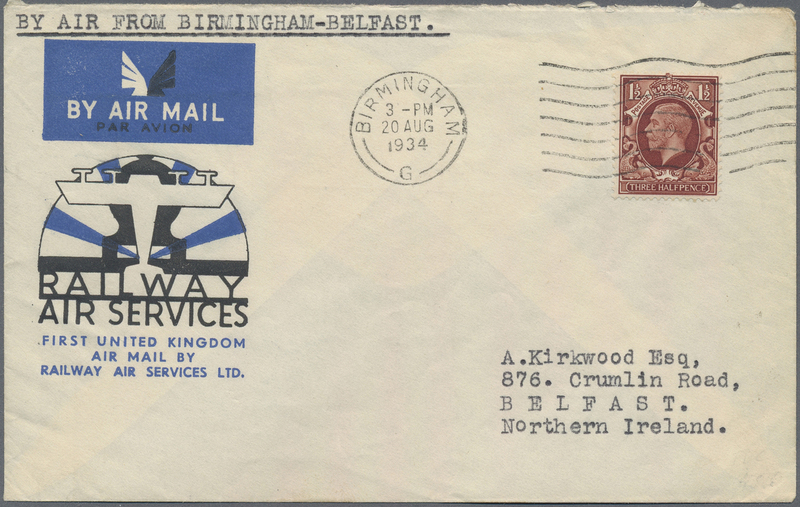 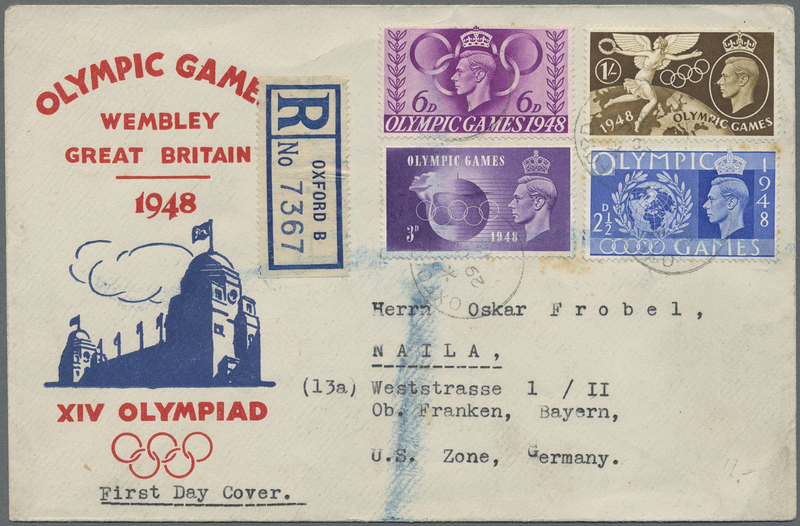 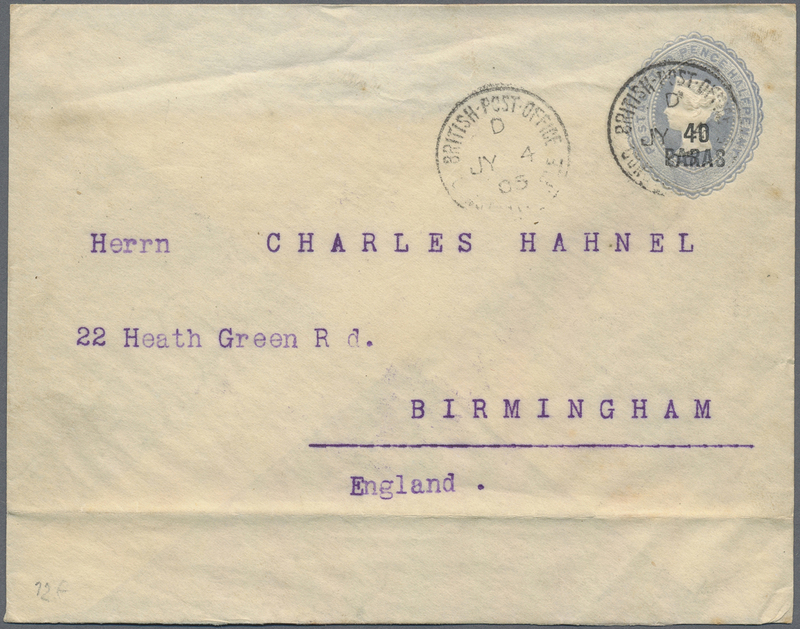 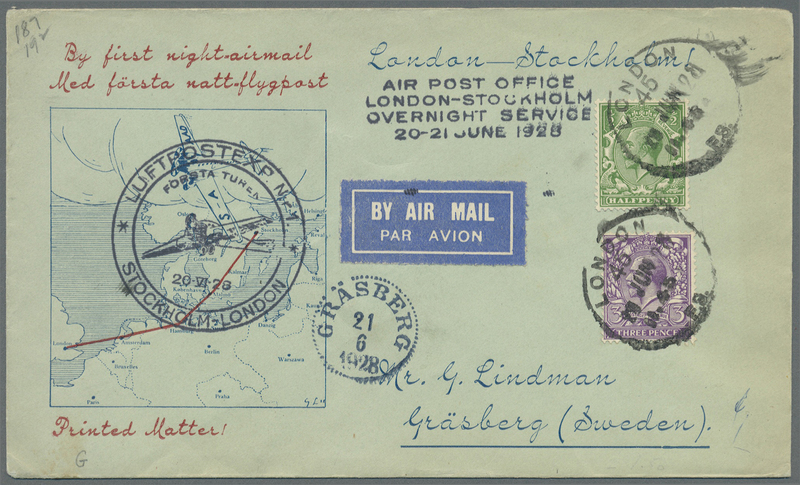 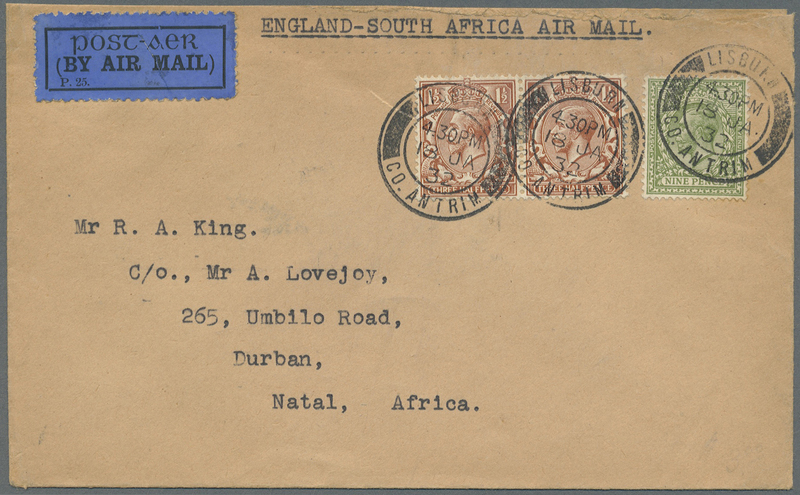 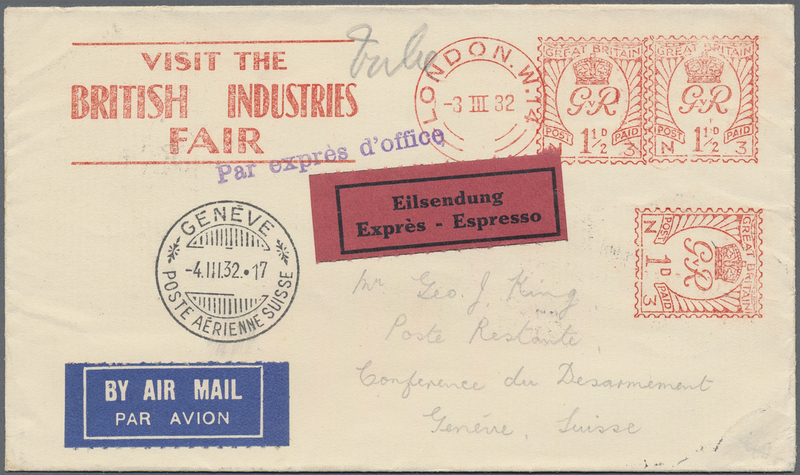 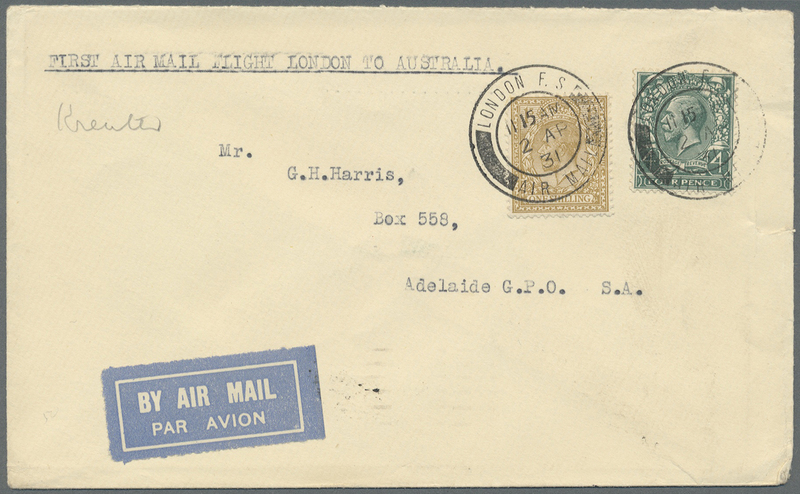 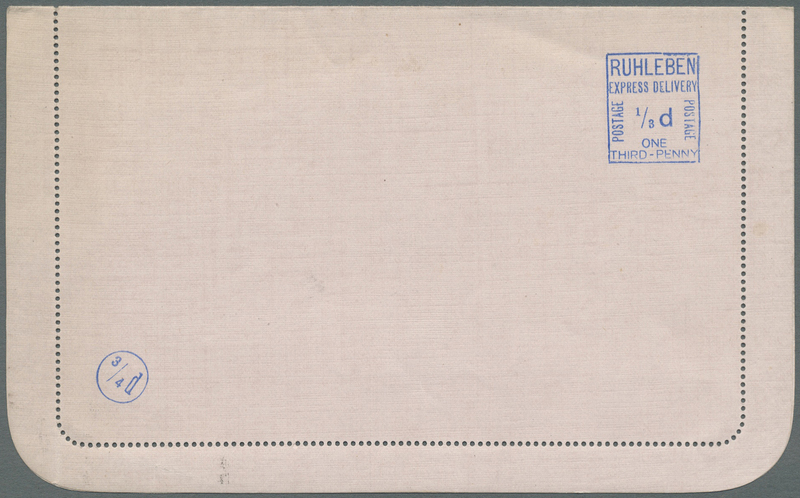 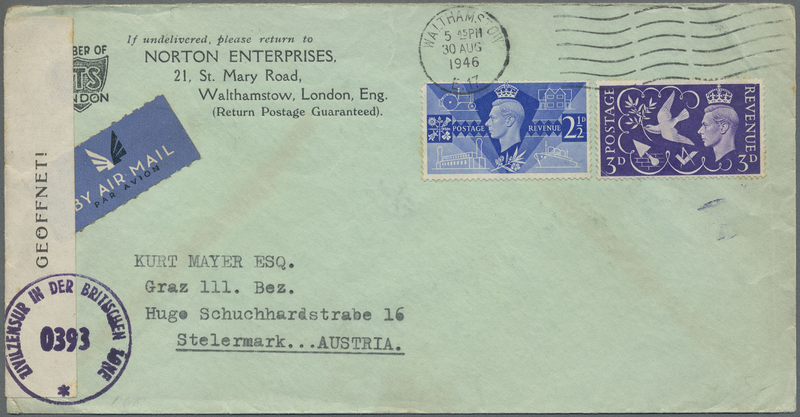 34985 Flugpostbrief (Flight cover) 1933/1943, AIRMAIL TO AMERICA, lot of 9 airmail covers to USA incl. 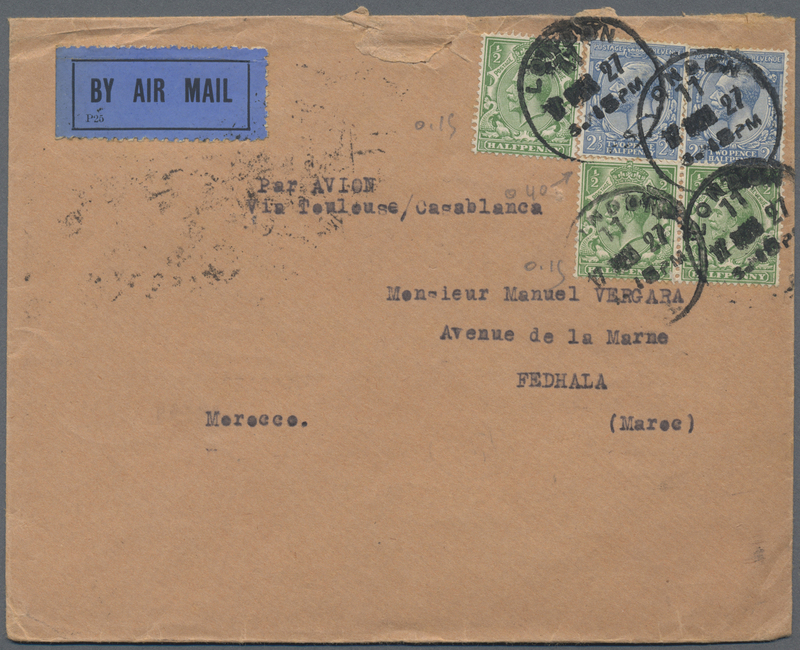 Hawaii, Bermudas, Argentinia, Brazil and Trinidad, incl. 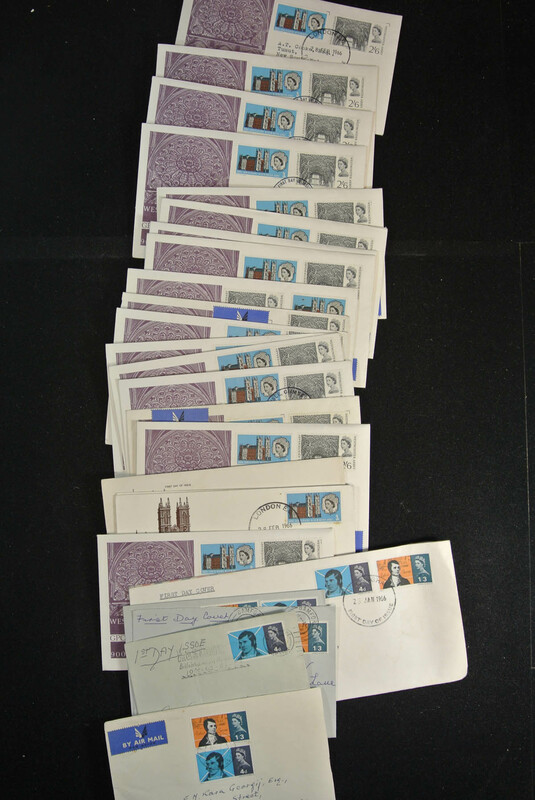 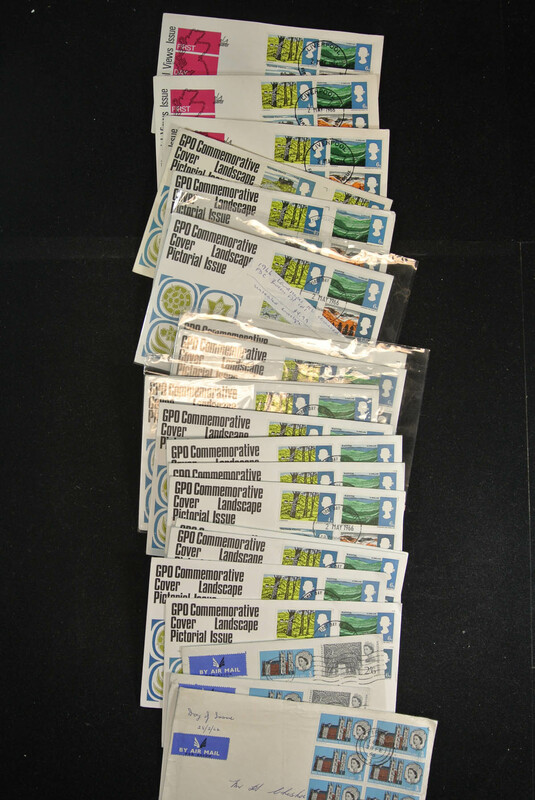 registered and censored mail, perfins, better frankings etc., few some marks, mainly good condition. 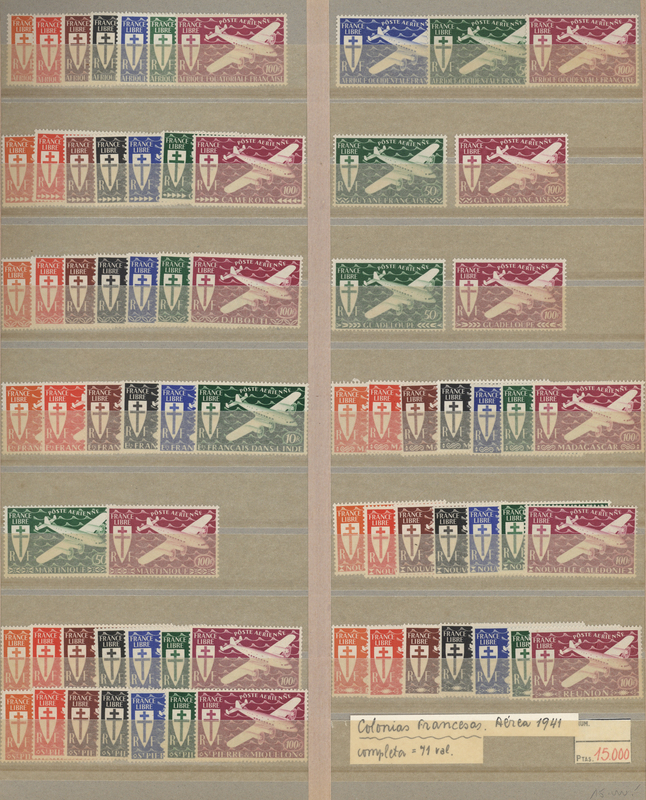 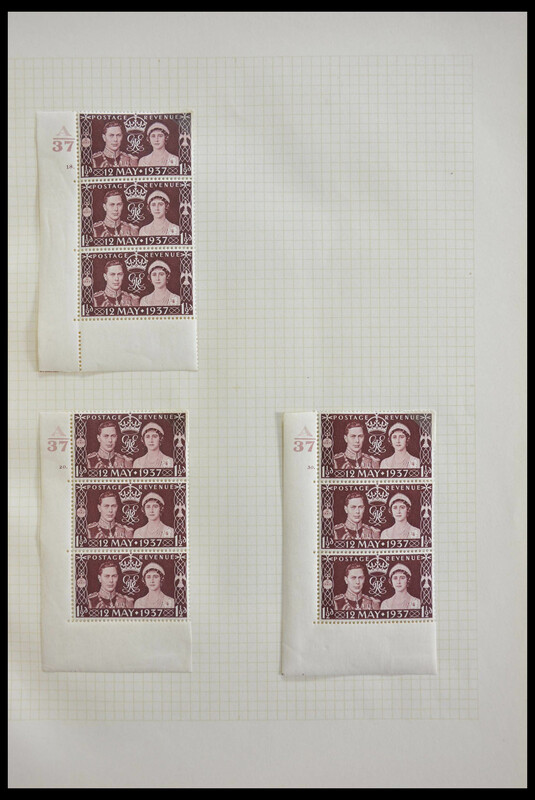 34994 postfrisch (never hinged) ** 1952/2001, a splendid u/m collection in three albums, virtually complete incl. 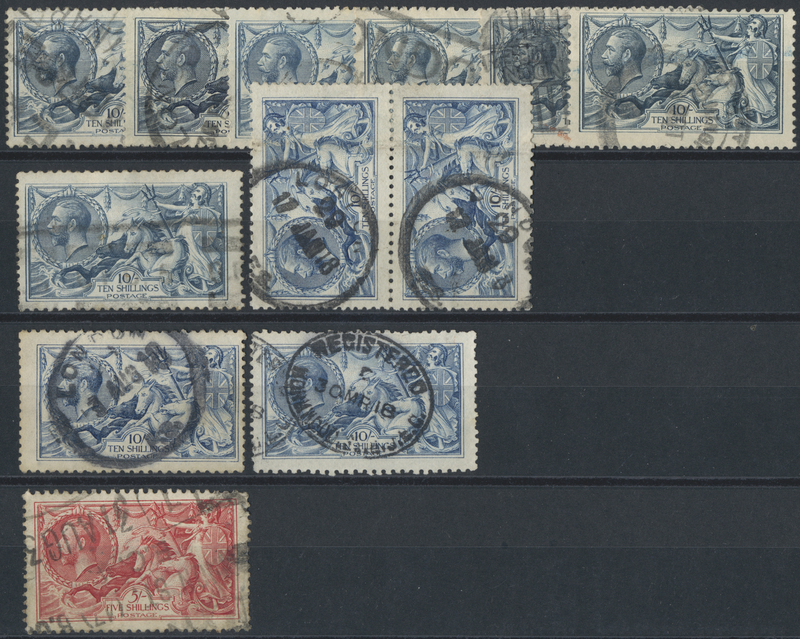 1955 Castles signed Pröschold BPP, phosphors etc.